With just a keep and gatehouse remaining, the castle that gives Newcastle it’s name almost goes unnoticed in the city. Indeed in 20yrs living up here I’d shamefully never even visited. We crossed the cobbles from the pub to enter the Castle Keep and picked up a glow stick which acts as your badge for the evening, (I was excited already). Then into the Great Hall, which I can confirm is very definitely a great hall. Projected onto the stone walls high up to the high ceiling were scenes from the origins of the castle. Sat in front of the stone fireplace was a man in a spotted shirt playing hauntingly good music on what looked like three giant woks…. One of the things with the Late Shows is many people drop in and out of venues, buses are laid on for events, and there’s a constant stream of people wandering around. And on that note it was time to explore the keep as it’s one of those places that you pass by without realising the fascinations within. Bit like the tardis with a huge central high ceilinged room wrapped by narrow corridors and corner spiral staircases. At the base are cellars and a marvelous old chapel, whereas at the top you suddenly and surprisingly emerge onto the roof for a skyline view of the city. A trainspotters paradise too with an aerial view of the station and snaking railway lines. Descending from the roof along the spiral stairways gave this view down on the great Hall. We left the busy Keep and walked over to the Black Gate where unfortunately the queues were too long, so carried on towards the central station. Interesting atmosphere in the streets with an eclectic crowd all mixed in with the usual crazy saturday night hen parties. Another building I’d driven and walked past without a second thought. Outside some street fire jugglers gave a clue to the events inside. Fascinating building housing amongst other things a queue locals would describe as ‘hyowge’. This snaked around and up the stairs right up to the bar….did someone mention a bar? Quick drink later we decided to join the queue which eventually brought us down into the hyowge and dramatic library…for circus stuff. First act was a juggler lit up in the dark on a tightrope, however the rope wasn’t tight it was loose, held by a group at one end making the whole thing a lot more difficult. We managed to stay for the next act where three acrobats slowly entered to stirring music and on to the stage in front of us. Now you’ve probably watched something like this on the telly and been mildly impressed but trust me, the telly is a one dimensional flat experience. You need to grab a ringside seat to comprehend the effort and strength involved. Muscles trembled, bulged and strained revealing the physical effort needed to maintain such balanced poses. My jaw dropped open several times, not a good sight, unlike the 3 acrobats who got a very well deserved round of applause. Must admit this was really impressive and great fun. Next we went downstairs to join a half empty Edwardian Lecture Theatre without really knowing what would happen. It soon filled up and Hannah performed a warm up routine before introducing an aspiring young juggler whose deadpan humour belied his age. Very funny. Followed by a lady who juggled balls with her feet whilst doing handstands, as you do. The acts were from Circus Central an arts charity based at Shieldfield Green in Newcastle. They offer courses in juggling, tumbling and various other circus things! Seem a great bunch, worth checking their website out below. 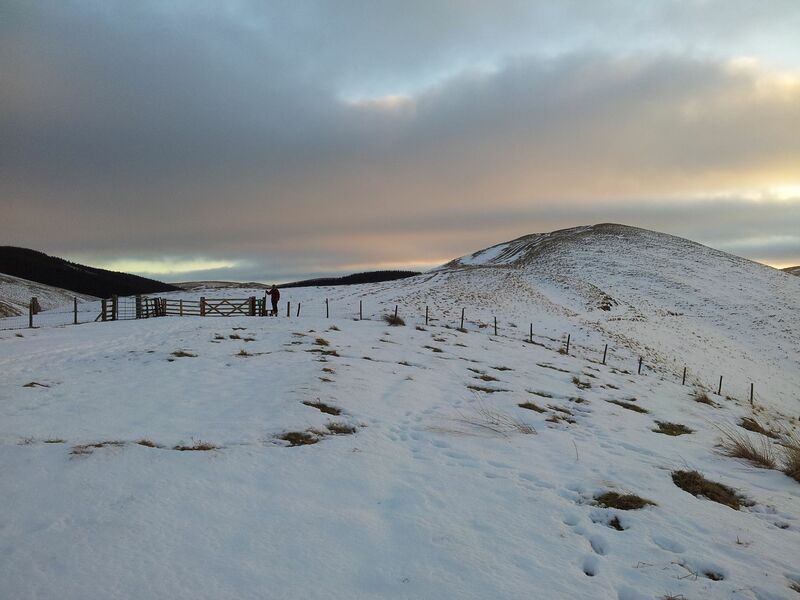 Long ago the Cheviot was an exciting volcano which unfortunately evolved into today’s peaty boggy upland plateau. 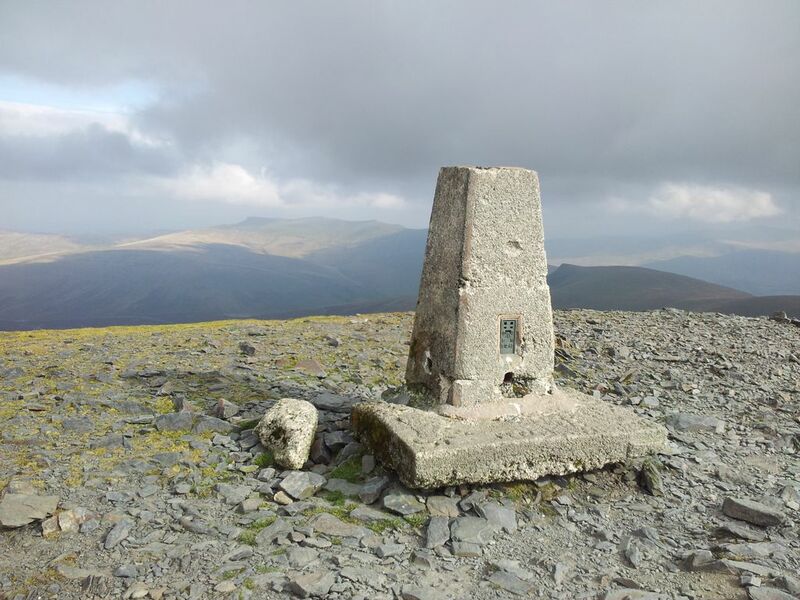 Summit views are disappointing and there’s few features, yet at 2,674ft this is England’s highest point outside the Lakes & Pennines so a draw for many walkers. 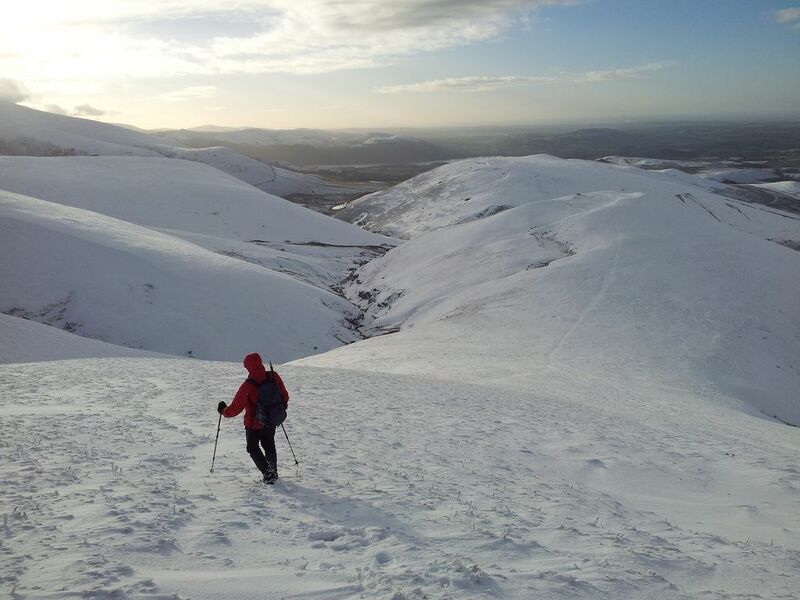 Best routes are probably from north west and College Valley, whereas those of us approaching from the south face the remorseless slog over Scald Hill from Langleeford in the Harthope Valley. As a variation to this route I diverted off to reach the northern Lambden Valley, following the river before ascending up the side of the Bizzle. 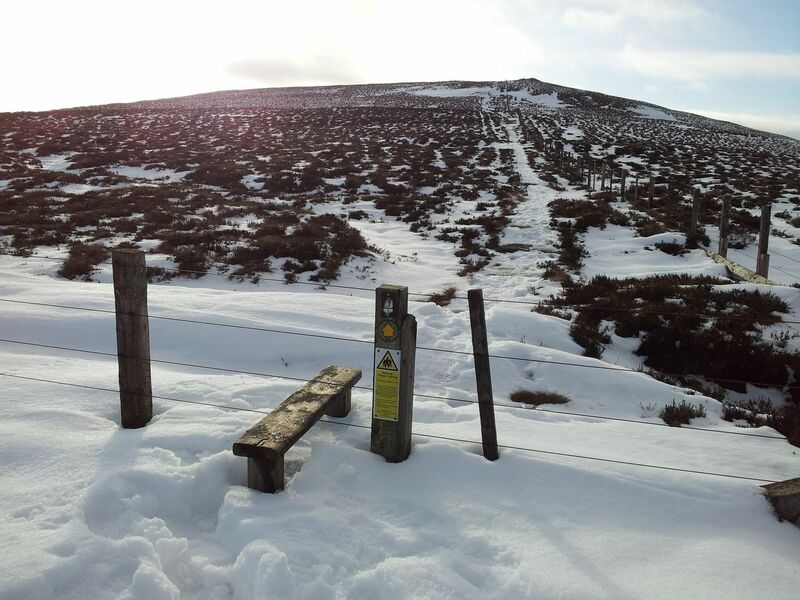 After navigating the summit bogs to reach the huge trig of the Cheviot, the descent is over Cairn Hill then down along the Harthope Valley back to Langleeford. Why do this route? Well it’s certainly different and you leave the world behind as it’s bloomin quiet, I saw no one for 5 hours. The best views from the Cheviot are from the edges and on this route extensive views north open up which are usually hidden. Disadvantages? Could seem a bit soul destroying losing that initial height gain to drop into the northern valley. 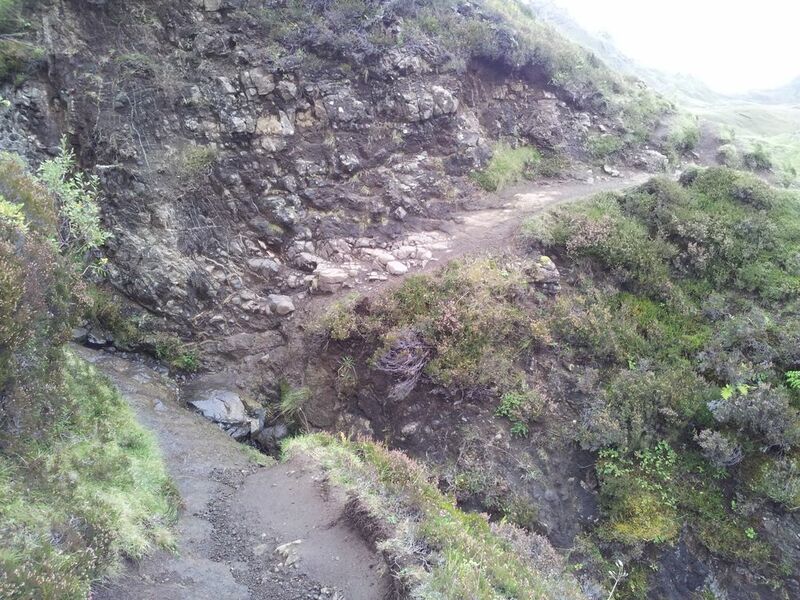 Also no nice pavement to follow on top, you’re at the mercy of the peat bogs and have to steer through them. Easier than it looks though. 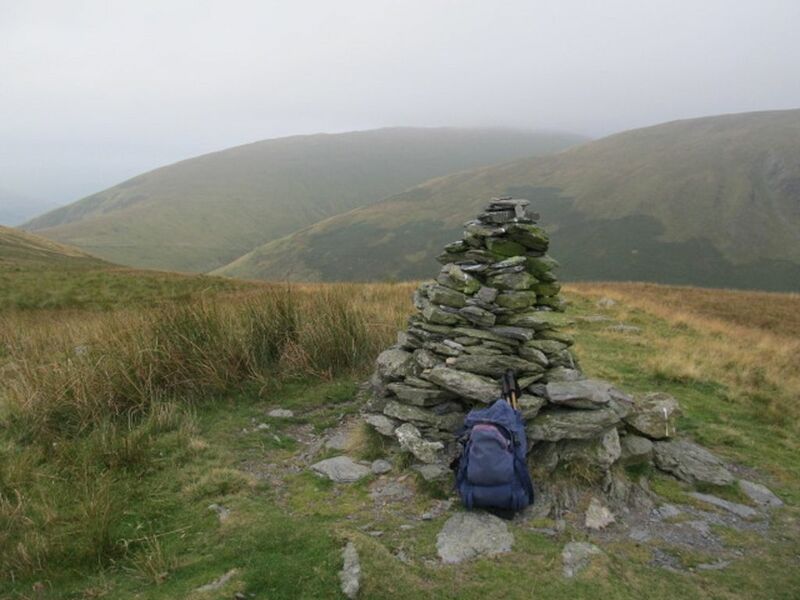 Extra ascent and mileage which is either an advantage or a disadvantage depending on how far/long you want to walk. After a short drive along the very pleasant Harthope Valley I parked at the familiar large layby east of Langleeford. 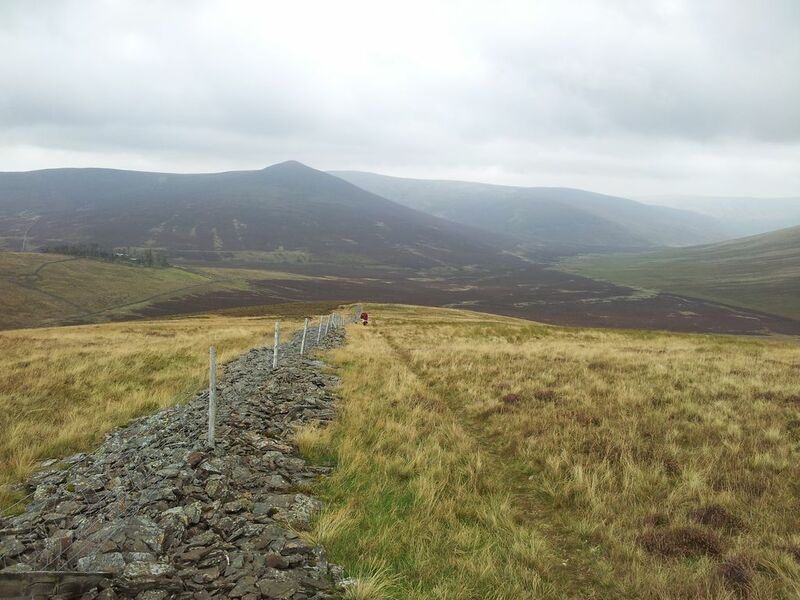 The walk starts along the standard route south west along the road then turning off right and angling west onto the open hillside towards the Cheviot. (For this route a better choice may be to cross the road from the car, heading north west following a curving track along the Hawsen Burn. 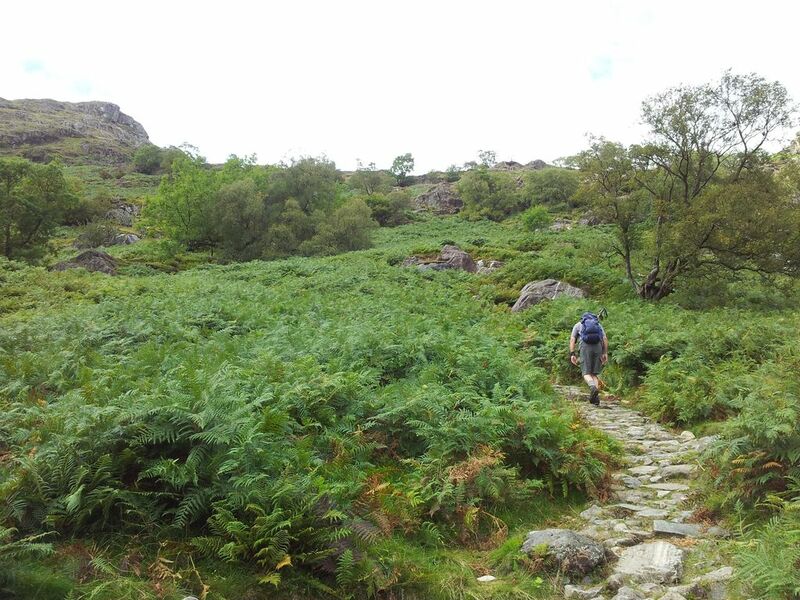 Have done this twice before however in summer there can be annoyingly dense high bracken to wade through). 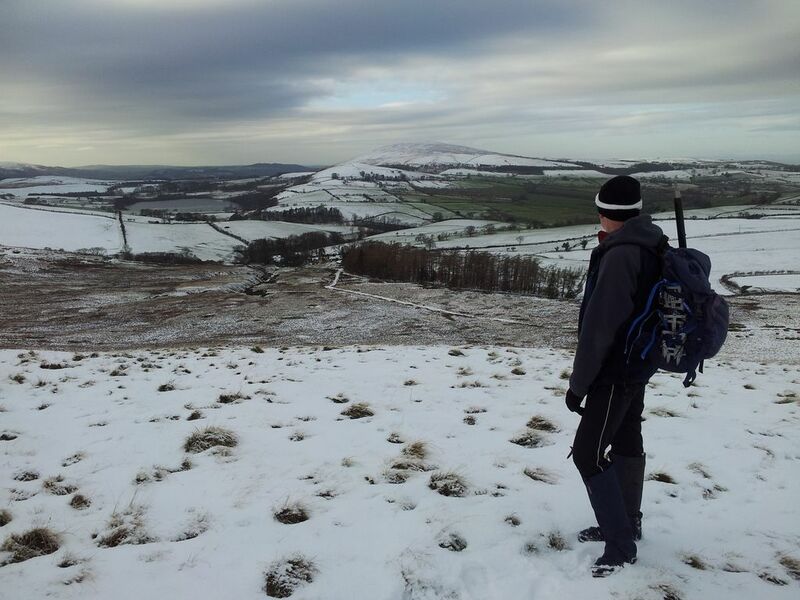 I was soon walking uphill and feeling a lack of fitness due to lack of hill days. I hadn’t felt up for this walk but have learnt to ignore that and just get on with it. Did manage to overtake a couple though, who as it turned out would be the last human beings I’d see till back in Wooler hours later. About 2/3rds of the way up Scald Hill I started the diversion by leaving the path, turning northwards heading initially towards Broadhope Hill across tufty grass. Over a stile a soggy peaty path dips down then up alongside a fence, before finally taking a left/west turn to begin the Lambden Valley section. 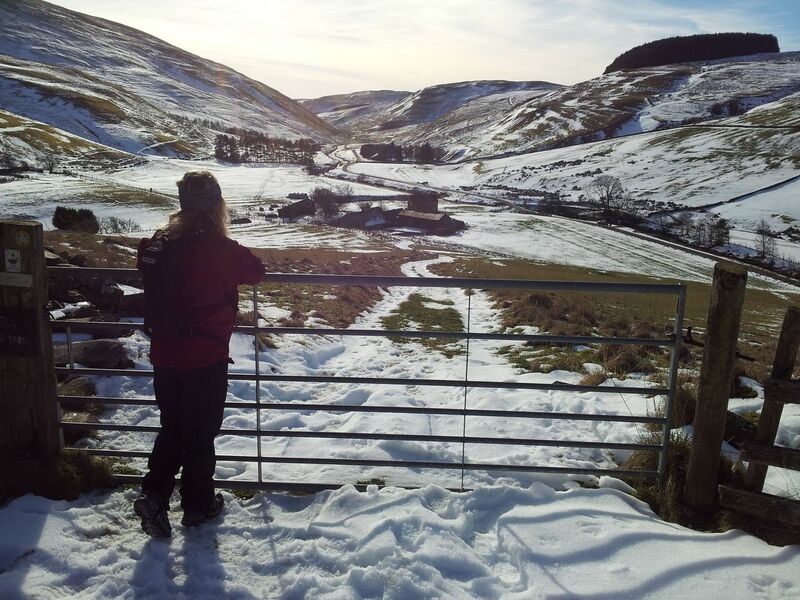 These are views here many Cheviot baggers will miss, looking along the Lambden valley to the Schill and across the northern slopes of the Cheviot. The path drops gradually through open heather moorland then briefly joins a forest road before an interesting 4 minutes through woodland. Bit of fun here winding round tree stumps, dodging conifer branches, before emerging into the open over a stile. (Update – some trees now block the start of the forest path). A sense of solitude kicks in as the route carries on westwards gently down to the isolated buildings of Goldscleugh. By now all previous height gain has been lost and Langleeford already seems a million miles away. 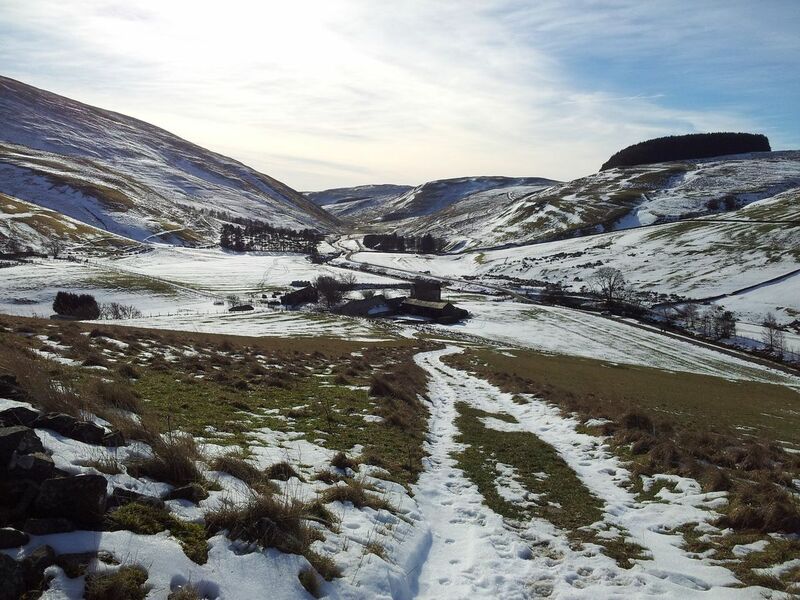 A final road section takes you to the equally isolated farm at Dunsdale, where the ascent of the Cheviot starts all over again. Dunsdale’s a good place for a refueling stop before the inevitable steep slog uphill, also a good place to survey the Cheviot in all it’s northern glory. Far more interesting than it’s dull southern slopes. 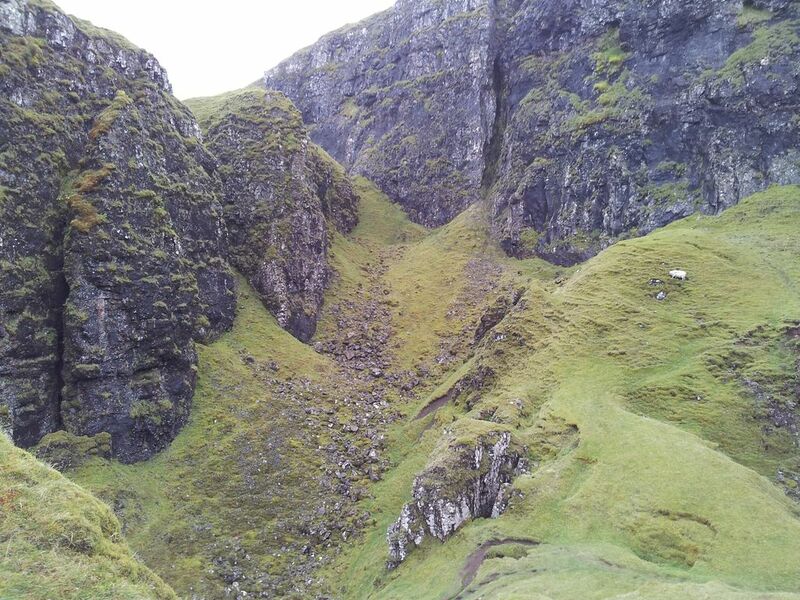 The obvious feature is the Bizzle, a steep cleft formed by the ice age. There are routes either side, I fancied recreating one done 20 years ago in snow up the eastern side. Wasn’t necessarily looking forward to this as I could still remember the peaty bog fest awaiting up on top. A path looked visible heading up to a cairn which would hopefully ease progress, so off I plodded. Unfortunately the path kept away from the Bizzle’s edge then petered out, so I veered right to get the cliff views. 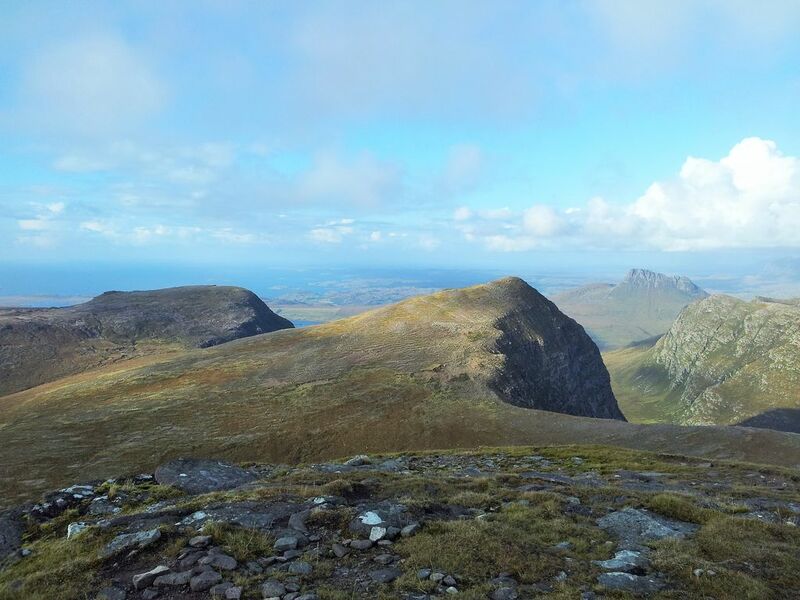 Nice views but surprisingly breezy, a northern wind was funneling up the flanks making progress hard. 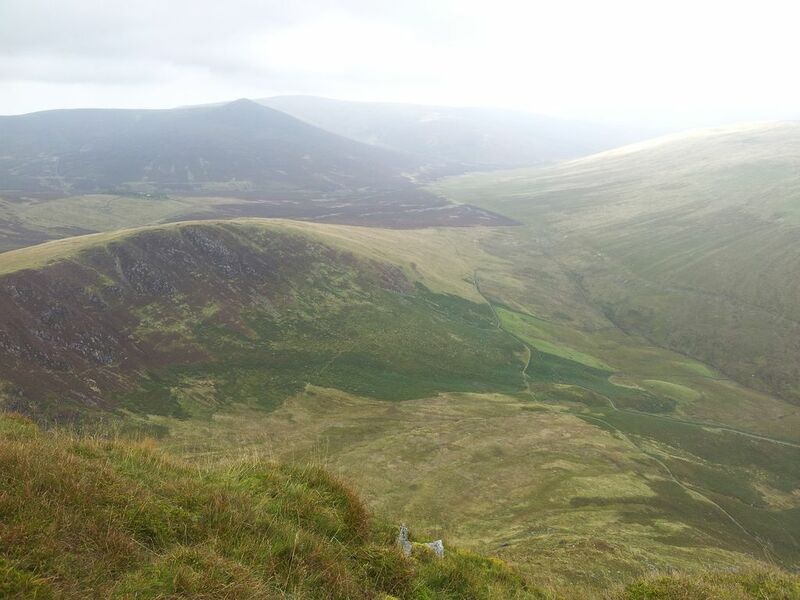 Had to move away and ended up on spongy energy sapping grass, before eventually reaching the cairn of Great Hill. 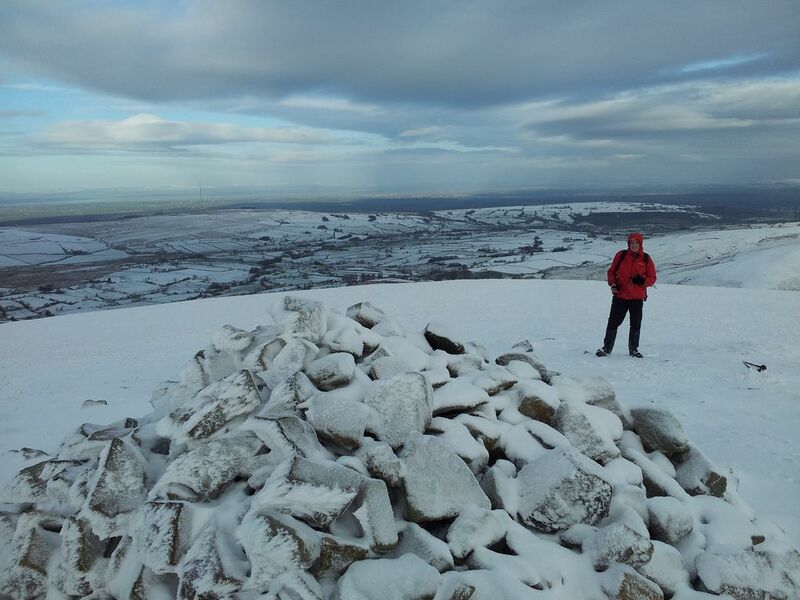 My lack of fitness was evident here but the views back down kept getting better and better, with the white farmhouse of Dunsdale getting smaller and smaller. 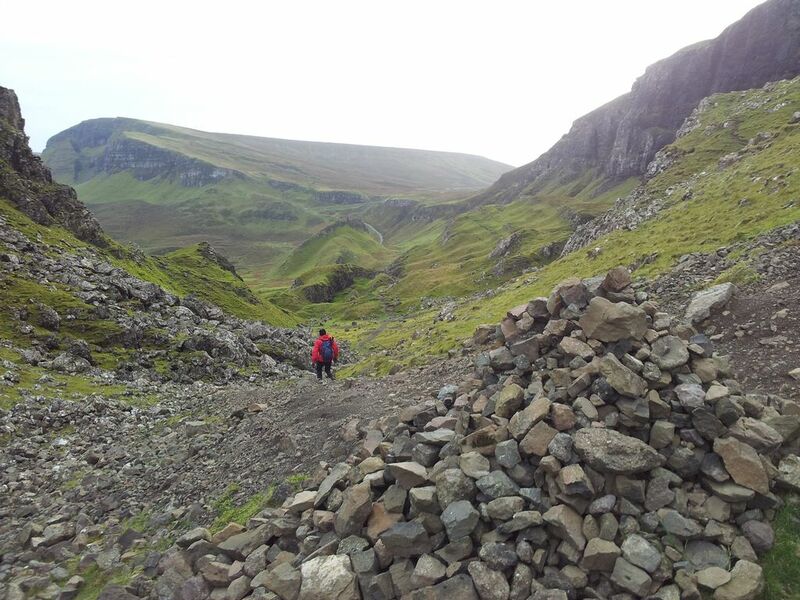 Eventually the cairn seen from Dunsdale is reached and the hard work eases on Mid Hill. 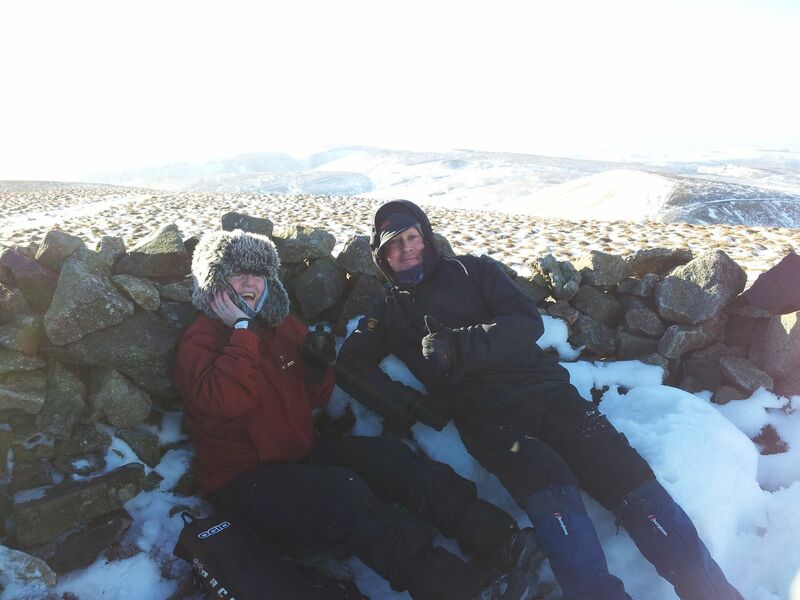 Had a short rest sheltered (slightly) by the cairn from the wind. Views though were great, different is the word to use here. Pity it was hazy though as really wanted to check the northern horizon, will have to return with binocs on a clearer day. No putting it off, now for the bogs, I was hoping for a track to follow but after a quick wander over the crags I found nowt. Was just a case of taking a bearing and picking a line through the scattered peat hags. Depending on how weird you are there may be some satisfaction in this challenge, my route turned out reasonably ok, no wet feet, no snorkel or flippers needed. Looking south at the boggy plateau ahead, Urgh! 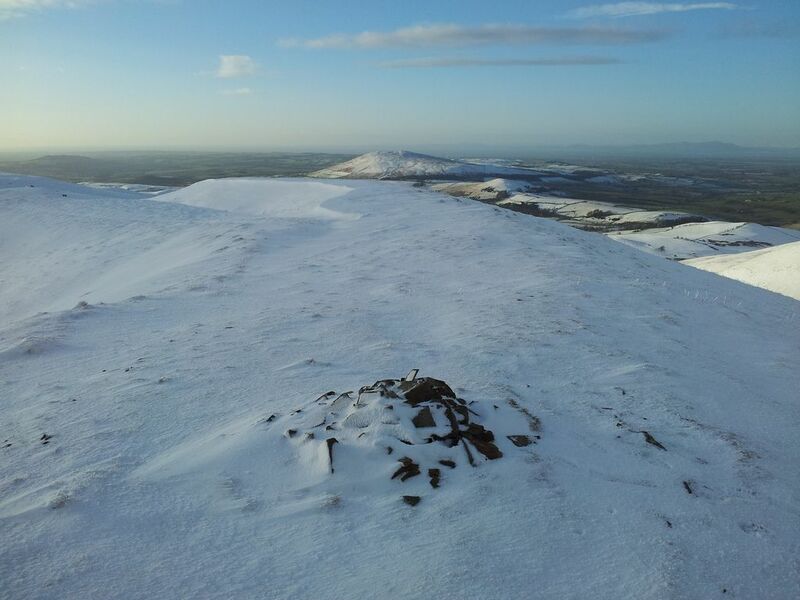 An uplifting sight on this peaty plateau is spotting the huge summit trig on the horizon. Soon I was very close then started laughing at the boggy mess barring the way. Discovered some footwear lost in the mire, fortunately no one still attached. Inspired by the challenge of maintaining dry boots I used skills honed in the maze at Tatton Park to weave through. 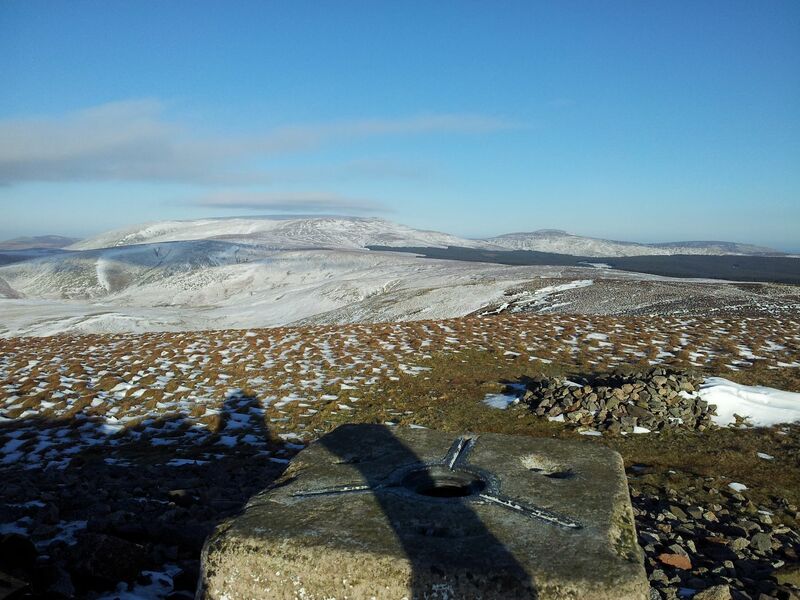 A final turn west to reach the sanctuary of the stone pavement then walking up to the solid foundations of the trig. I ate brownies on top and took a video to celebrate. Of the scenery, not the brownies. 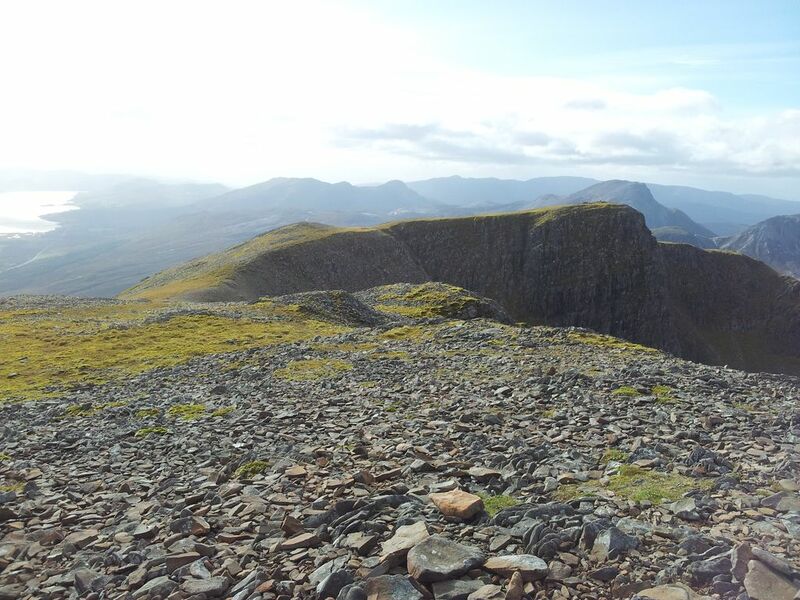 According to Wikipedia; “The view is obscured greatly by the flatness of the summit plateau. 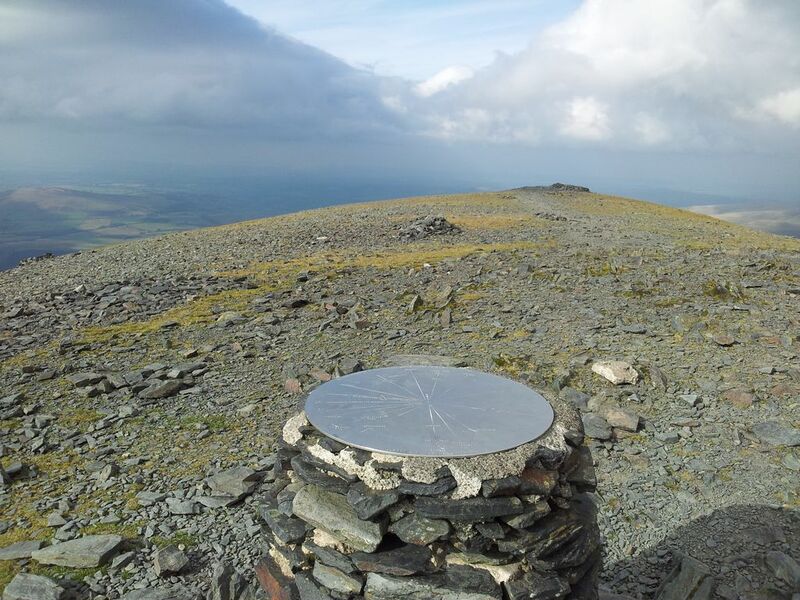 Nevertheless, on a clear day the following are visible (from west, clockwise); Broad Law, Moorfoot Hills, Pentland Hills, the Ochils, Lammermuir Hills, Lochnagar, Ros Hill, Long Crag, Urra Moor, Tosson Hill, Burnhope Seat, Cross Fell, Helvellyn, Scafell Pike, Skiddaw, Sighty Crag, Peel Fell, Queensberry“. 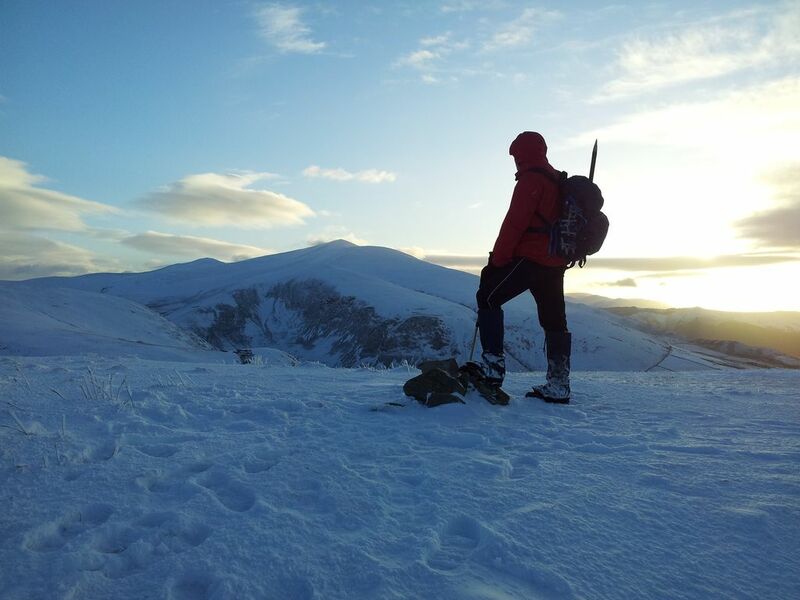 I’ve certainly seen the Lakes from the Cheviots, never yet the Pentlands but to see the Munro of Lochnagar would be amazing. Today due to the haze I mostly saw bugger all, and bugger all people were up here too, completely deserted, which was nice. Tempted to do the first, didn’t have time for the third and I fancied something different. So I did a number two, (maybe should rephrase that). The lowering sun through the hazy light with a hint of lenticular clouds was fantastic, very peaceful. My first time along the valley and I was initially ok with it then a little nonplussed. It’s longer than you think and of course views are limited in a valley. There was a choice of keeping to the stream or a path slightly higher on the northern side which seemed to keep a straighter line and avoid little ups & downs. Still it was different, though I certainly wouldn’t fancy this as an ascent route, far too tedious, the other two options are better. Would I recommend this? Well, Yes & No;- No if you’re after a quick ascent up the Cheviot. Yes if like me, you fancy something different and longer. 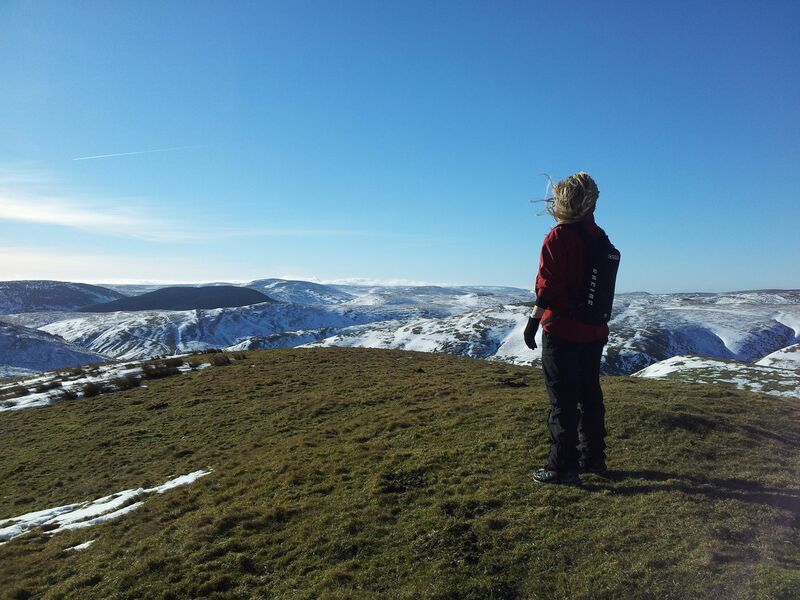 Next time I hope to be fitter and will explore the west side of the Bizzle over to Braydon crag. A 5 mile circular walk which starts from Whitley Bay crematorium then follows the Seaton Burn to Seaton Sluice, heading back south along the coastal cliffs to St Marys Island (check the tide times). 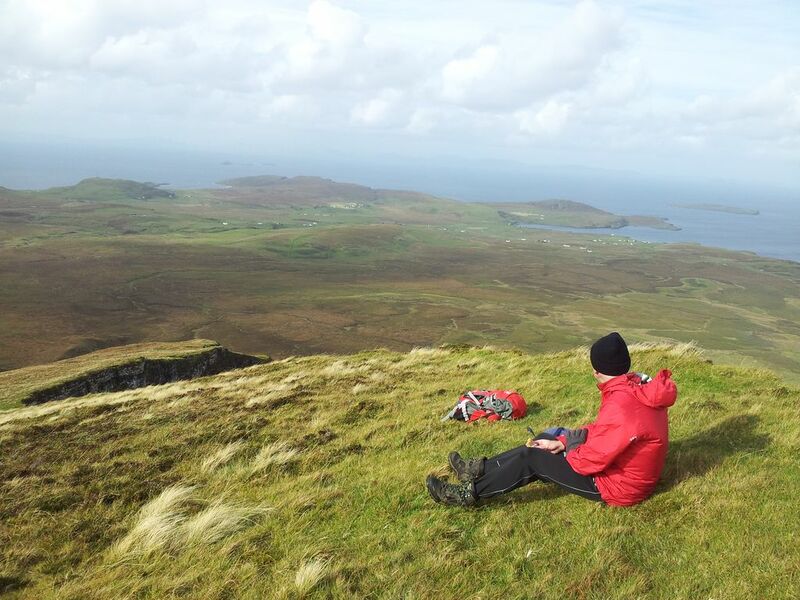 You’ll see plenty of sea, lots of seabirds, quite a few planes and if lucky a few seals. Good walk in any weather but even better on a quiet calm Sunday evening, with blue sky and low sun illuminating the famous lighthouse. Total Ascent = 470 ft, max height a modest 89 ft above sea level! 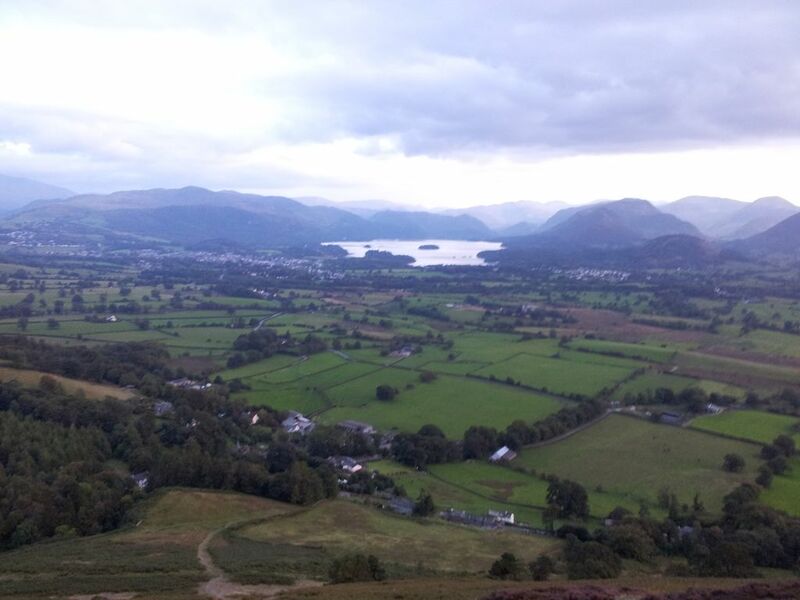 This was a straightforward evening walk after having to cancel a trip to the Lakes due to heavy rain. 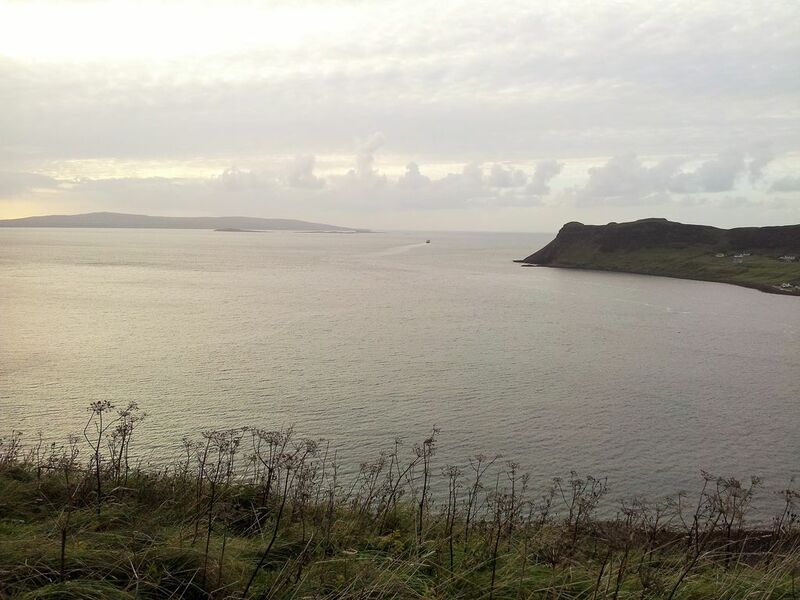 I needed exercise and tend to forget there’s a fine coastline right here on my doorstep. The idea was to make a decent circular route so I drove just 5 mins from home and parked outside the crematorium (as it’s free). Crossing the busy A193 I shuffled over the fence and walked across the deserted mini golf at the end of the Links. Then over the road to join the track heading northwards behind the St Marys nature reserve (signposted to Seaton Sluice & South Beach). This takes a straight line north on the west side of the reserve with a few viewpoints across the pond where you might spot wading birds, ducks, herons etc. Once past the reserve the track meets the coast briefly to give you a taste of the views to come. The track then goes through a small car park where I left the coast to turn inland up the road named E End past the Delaval Arms. Then over the A193 roundabout continuing west along W End (signposted Earsdon B1325). After walking gently downhill you pass an estate of bungalows followed by a Northumberland & Seaton Sluice sign. I turned immediately right through a tiny car park and gate to join the Seaton Burn section. This follows the winding burn through trees skirting around the back of the houses and eventually emerges out into the open at Seaton Sluice. Sticking close to the south side of the burn a feint path goes under the A193 flyover and onto the Sluice. Continue up towards the Kings Arms and survey the interesting scene below over the tiny old harbour, it’s a bit different. There’s some info plaques outside the pub worth checking out, it’s also worth crossing the footbridge over the “cut” onto “Rocky Island”. Here you can do a quick circuit where views north along Blyth Beach suddenly open up. This can be be calm or windswept but rarely uninteresting. Follow the path clockwise round to the headland where the sluice opens out into the sea. Now a succession of cliffs lead the eye to St Marys Island and lighthouse. Good spot this, so get the binocs out. Now to follow those cliffs firstly by taking the path straight back along the top of the Cut past a lonely house and over the footbridge. From here it’s simply following the line of the cliffs as much as possible down to St Mary’s Island. Initially there’s a grassy section in front of the houses which then joins the road before angling off towards a larger headland. This goes round farmland & a caravan park which you hardly notice if you keep near the cliff edges, (not too near of course). The causeway is covered for two hours either side of high tide, so pick a time when it’s clear as the island is definitely worth a visit (St Marys tide times). Bear in mind if you visit during the day especially at weekends this place can be heaving. At certain times the small shop maybe open with refreshments and a visitor centre. Always worth paying just to walk up the steep lighthouse steps for fantastic views out to sea. Kids love the numerous rock pools, as do a few adults, such as me:-) Planes circle overhead on their approach to Newcastle Airport, however today the seals took the eye. There were at least ten dotted around basking on the rocks, the most I’ve ever seen here. Many are technically in the photo below but far too camouflaged to make out. Definitely take binoculars, seals often pop up in the distant sea usually unnoticed by onlookers. Stay as long as you want but do keep an eye on that tide, part of the local tradition is watching tourists scampering back over a submerging causeway. This splodging fun can turn into danger though as the water gets deeper and currents kick in. There’s been a few incidents here and many a tourist has had to be ‘rescued’ by boat, so take care. From St Marys it’s a shortish walk back along the causeway past the car park (ice cream van possible), then either along the prom or road back to the car. Sometimes you see Cormorants on the rocks airing their wings in the breeze (ps there’s always a breeze here). 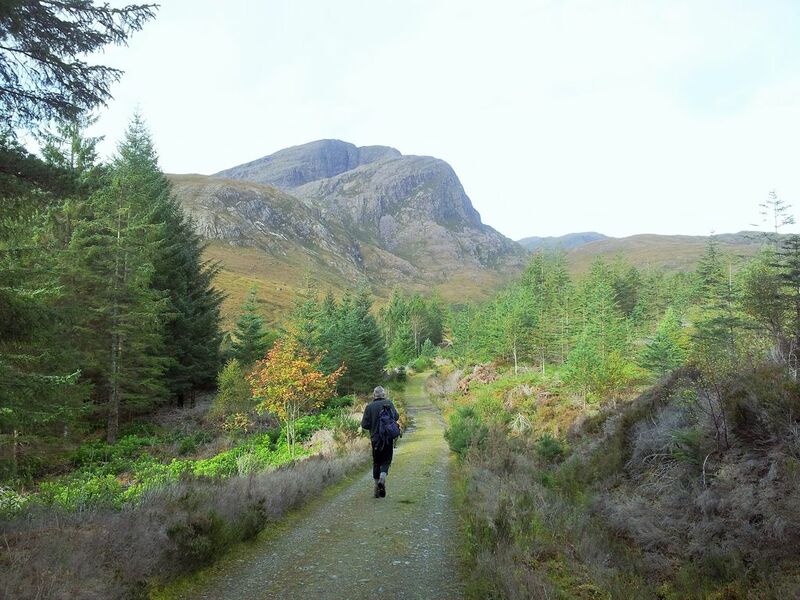 An interesting walk in an area of outstanding scenery just north of Ullapool. 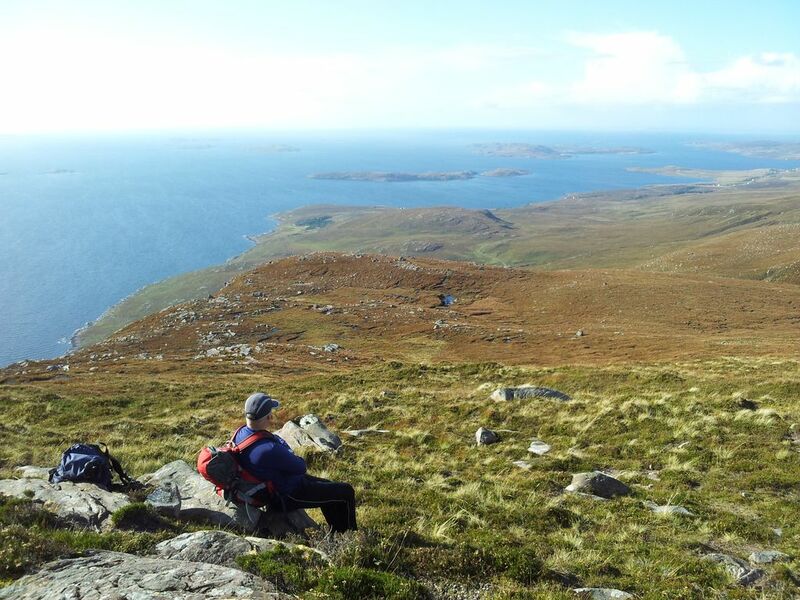 Approaching from the west gives an entertaining scramble with beautiful blue sea views across the Summer Isles and distant Outer Hebrides. 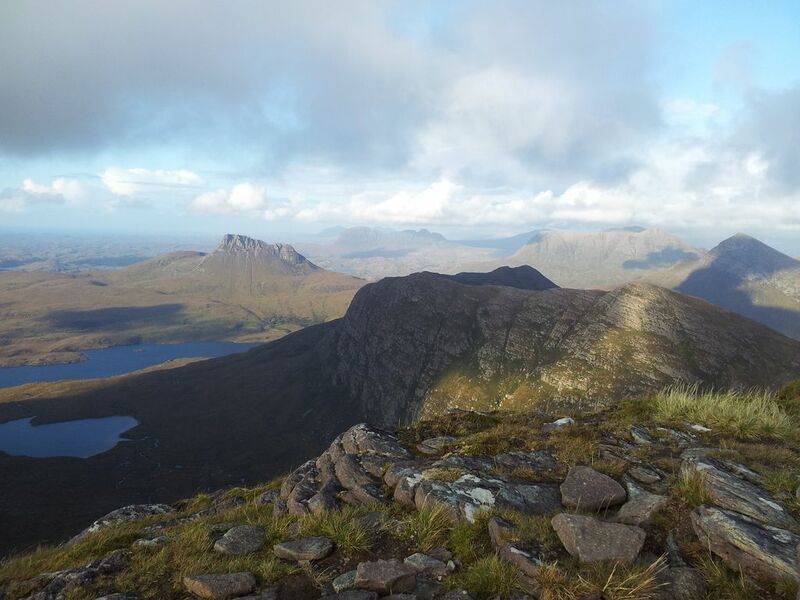 Even more inspiring are vantage points to the wilderness of Assynt with it’s uniquely individual mountains. Finally to end the day a gentle descent that personally I’d like added to every mountain. 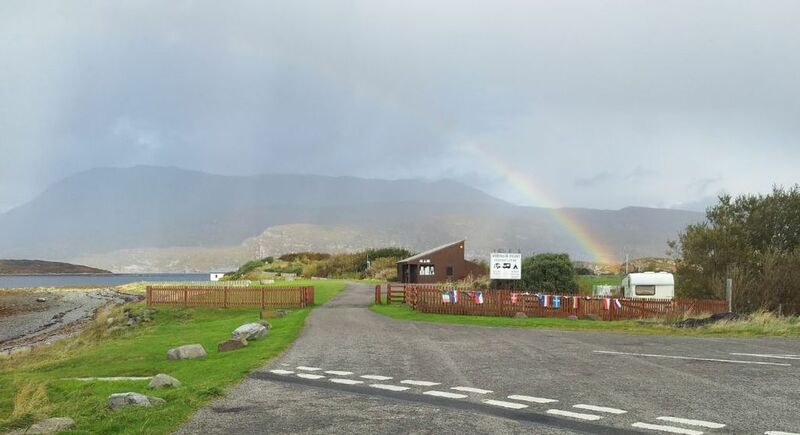 Transfer day on our October 2014 Highlands trip, after 3 nights in Plockton we were heading for 3 nights in Ullapool. 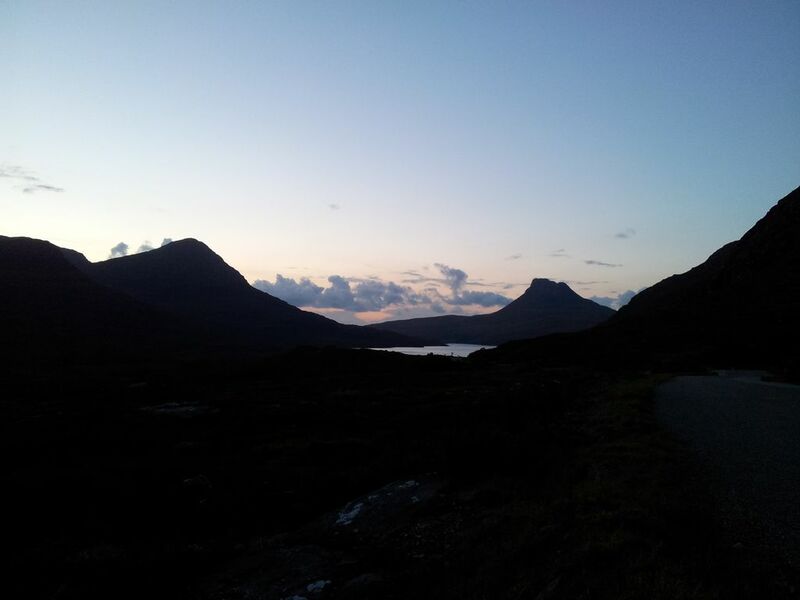 We needed a mountain walk along the way, so Plan A was drive to Ullapool and do Coigach, leaving a short drive back to town for evening food & ale. 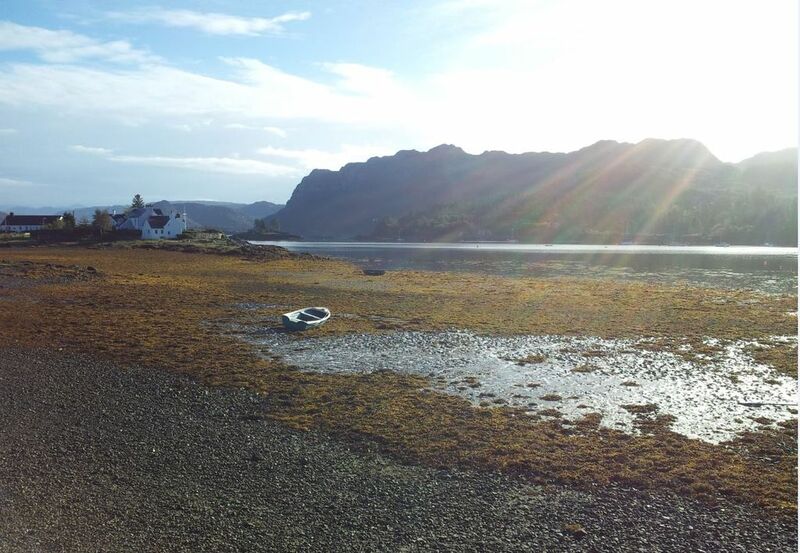 Morning weather in Plockton was surprisingly good, almost too good as the best weather was supposed to be further north. Anyway after a reluctant goodbye to much loved Plockton we drove on past much loved mountains, all looking lovingly clear. Leaving the guest house in perfect weather, look at that sky! 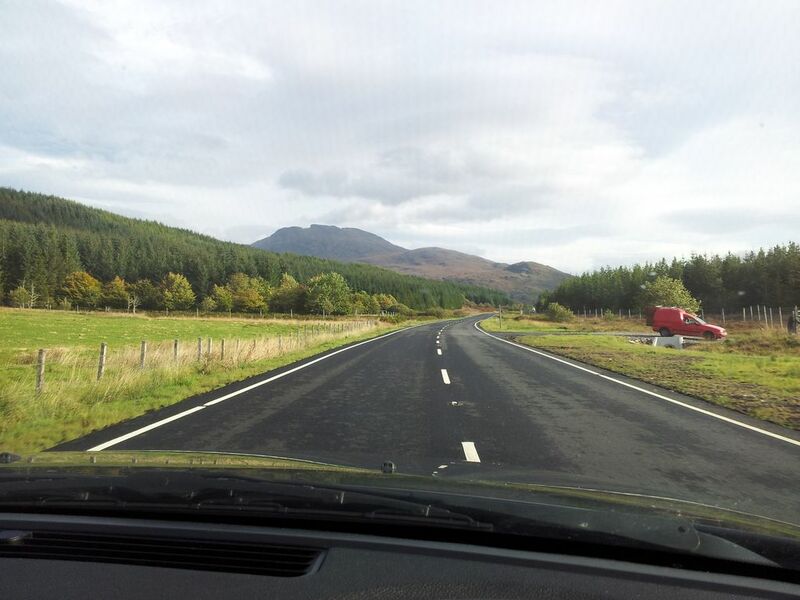 We took an indirect but rapid driving route zig zagging east through Achnasheen then northwest via Garve. After an hour’s drive the lovely blue sky ended in an unlovely dividing line of impenetrable cloud. 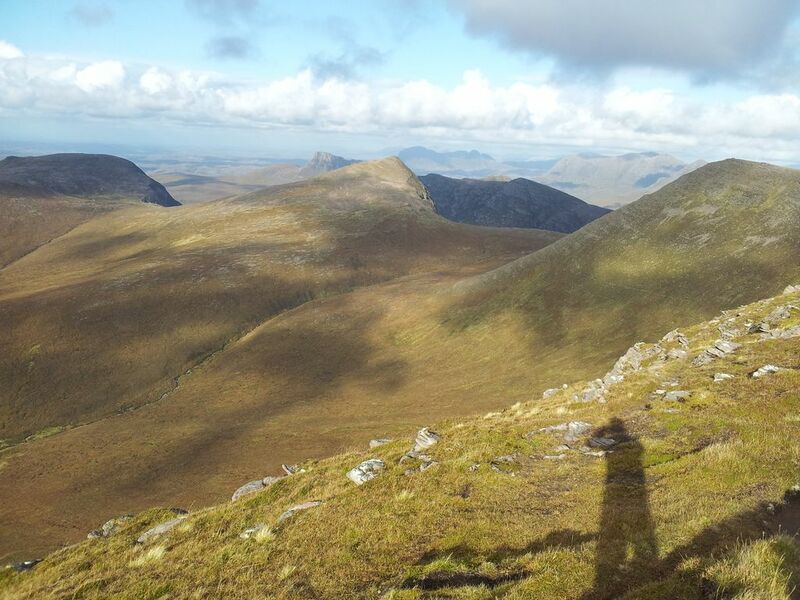 Ben Wyvis in the east was shrouded as was lovely An Teallach in the west. Approaching Ullapool our first sight of Coigach looked even worse, then it started to rain. All those lovely clear mountains passed along the way just to arrive in damp greyness. Coigach was one we wanted for the views, but no point turning back now so onward up the A835 past Ullapool, turning west at Drumrunie with fingers crossed. First choice of route from the east looked grim and very wet. The alternative from the west seemed a long drive away then a glimpse of blueness out to sea gave us the encouragement we needed. 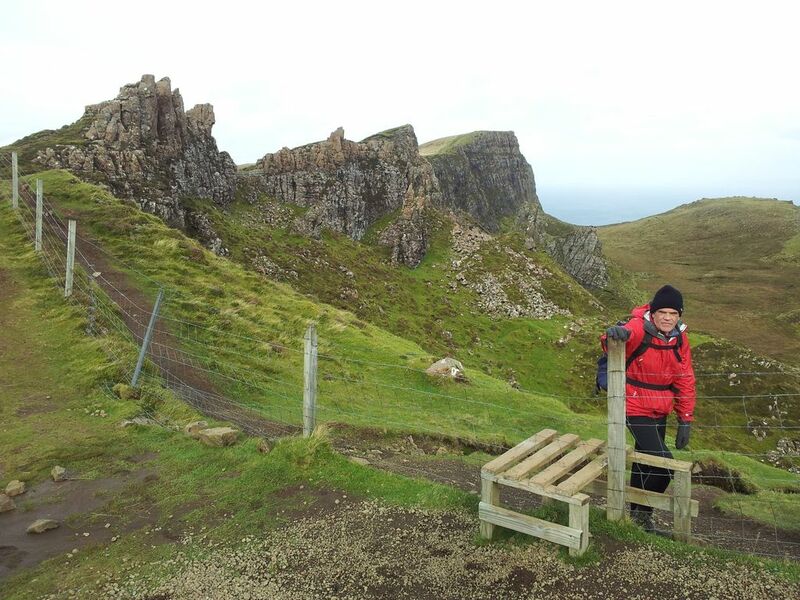 So off west we headed, passing lovely Stac Polly on a scenic loop around the lovely coast through Achiltibuie. When stuck in a cloud of crapness one can only hope that the weather did what it did that day. Yes it was windy but there were no complaints as we arrived 30 mins later near Culnacraig under blue skies, eager to get walking. There’s a layby with space for a few cars here, oddly a bit of shattered windscreen glass on the ground. Finally we set off on an anti clockwise route at 1.30pm, walking east along the road, soon turning off northeast following an obvious path heading upwards. Course this was our first mistake, we had completely missed the correct path heading southeast. Now we were heading instead directly for the Fiddler up our descent route, and had gained a bit of height before realising. I blame the long drive and over eagerness, mixed with sheer laziness to check the map. Anyway rather than turn back we decided after uttering a few swear words to contour southeast hoping to angle above the gorge of the Altt Nan Coisiche stream. This was hidden from view but a definite barrier on the map. Luckily this worked out ok, a slight dip crossing the stream but putting us back on course after losing maybe 10 mins. The views out to sea were outstanding, the weather now thankfully exceeding all expectations. 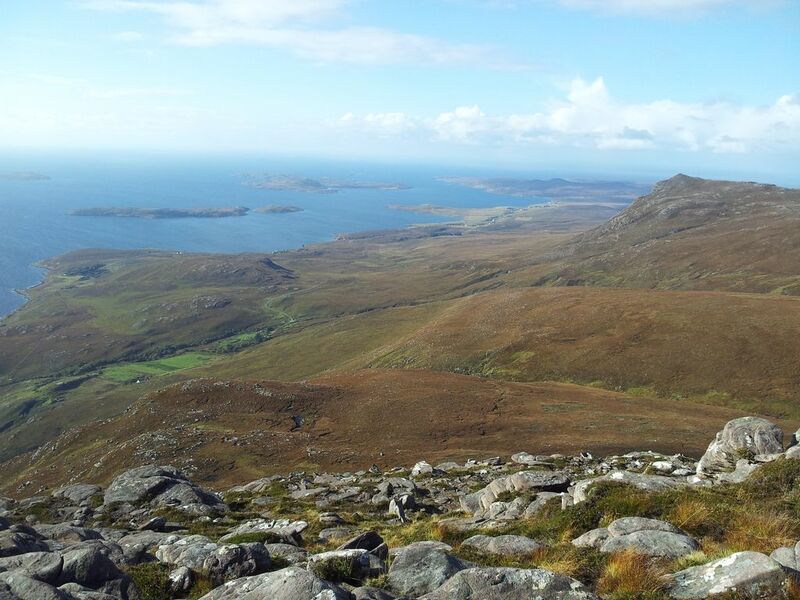 After some grassy slogging there was now just a straightforward ascent up and over that little steep bit ahead, then on to Coigach….we mistakenly assumed. 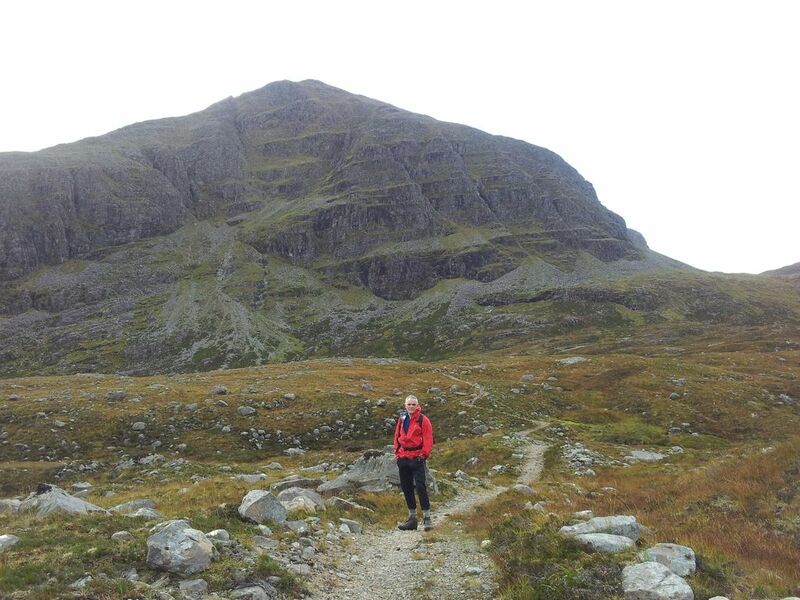 The ascent up the Garbh Choireachan (the steep bit ahead) certainly looks easy, but it’s further than you think. Lots of boulders to walk around which gradually develop into rocky and scree terraces, it seemed to take an age to reach the skyline ahead. 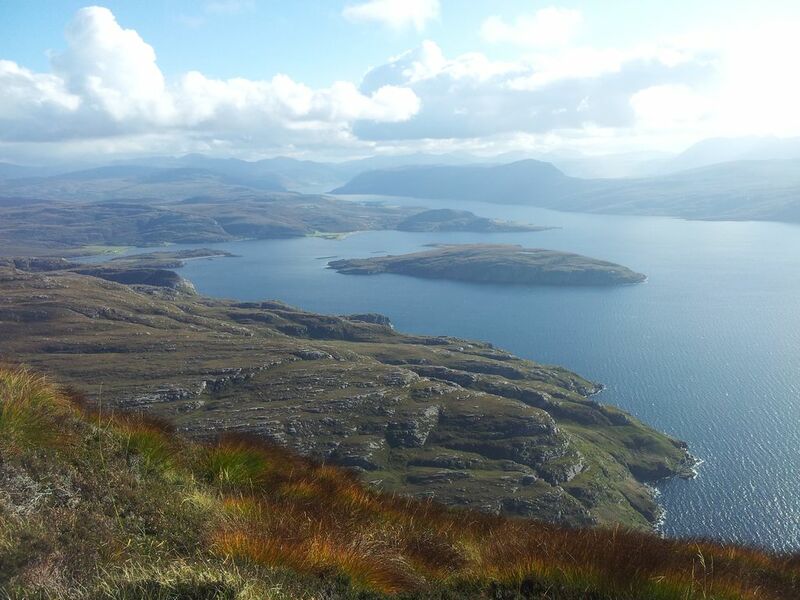 Views opened up south down Loch Broom over hidden Ullapool on to the Fannichs. Nice. 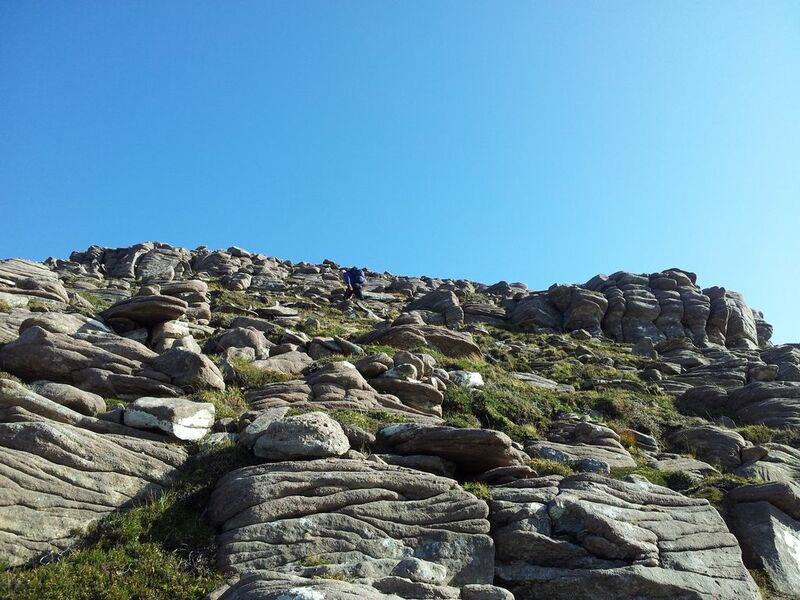 We hoped to reach a definitive ‘top’ with 360 degree views however every step seemed to yield more boulders ahead. There’s a myriad of tempting tracks, some clearly worn by humans, some by animals and some by natural erosion. 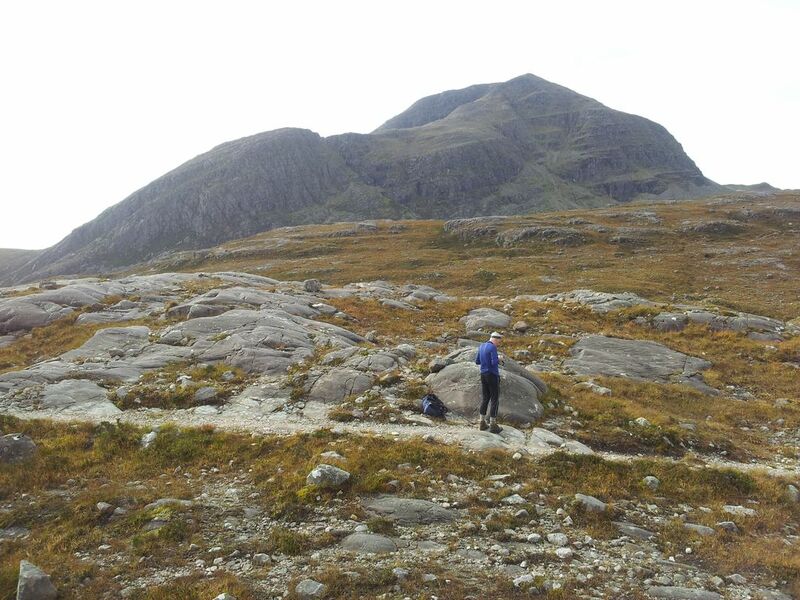 We just wanted to crack on to Coigach but were now meeting a strongish wind from the south. So we ended up slanting left around the ‘top’, seemed like people had done this before including on a couple of GPX routes I’d downloaded. 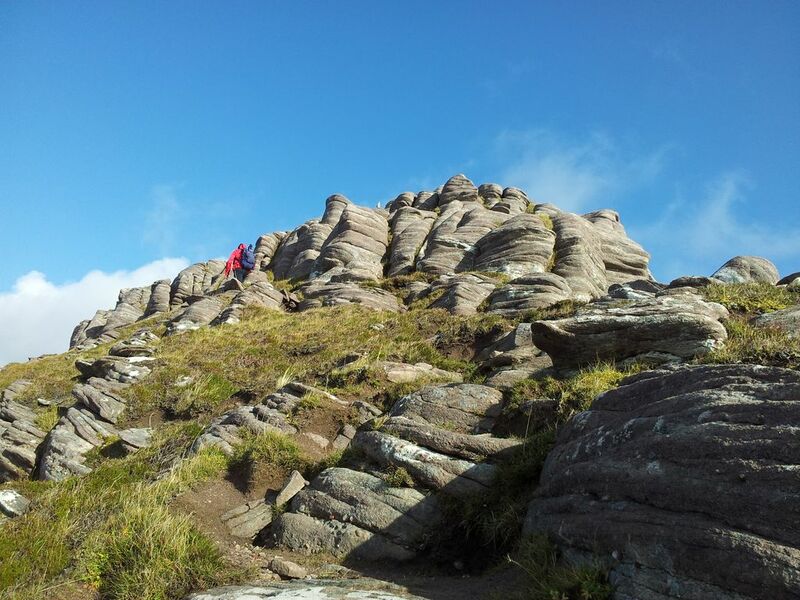 Again it took a while to scramble up to the skyline, still not sure of the best route here to be honest. With more time and less wind we’d probably have gone straight up. Either way we found ourselves on a surprisingly interesting ridge section. Course we would have known this had we checked things out properly beforehand. Going to mention that ‘views’ word again. Fascinating ridge walk ahead, sometimes on top, often along a side path with the ground sloping below. 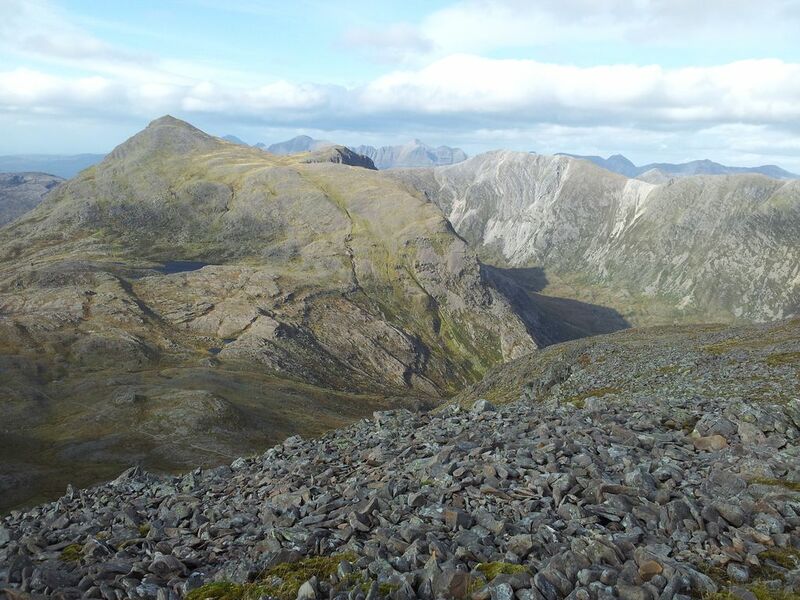 Never realised that this big lump beyond Ullapool was going to be like this. Eagles apart, the ridge is entertaining with some mild scrambles, how entertaining depends on the individual. Hint of exposure in parts and I used to love things like this but today I was less comfortable due to the wind. Kept expecting a gust to knock me sideways. It’s a pity we were mainly forced along the side bypass path rather than enjoying views on top. Another day maybe when concentration levels don’t need to be as high. 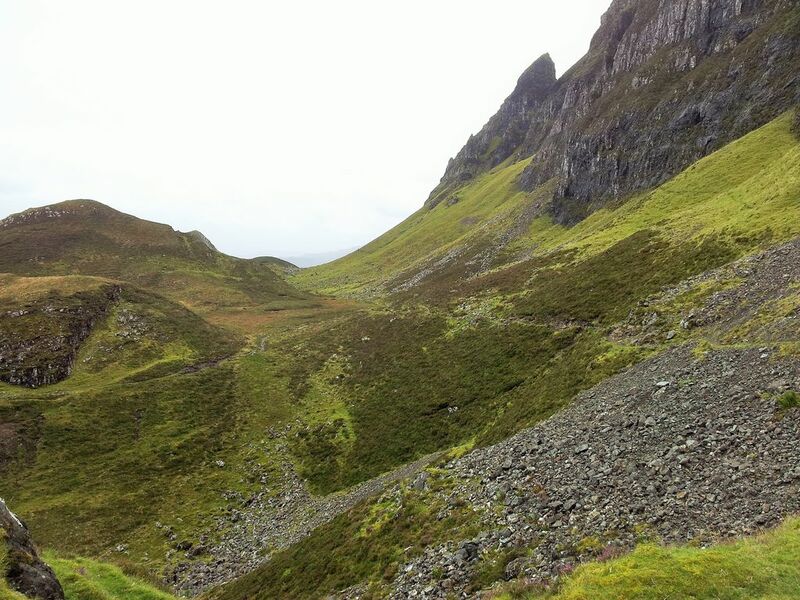 From the bealach we noticed a much lower path circumventing the ridge along the northern scree slopes. Perhaps a quicker but far less entertaining way up/down if needed. Now 2hrs 20 from the car, the ridge had certainly slowed us down more than anticipated. Fortunately everything becomes pretty straightforward from here and it’s only a ten minute easy pull to the top of Coigach. 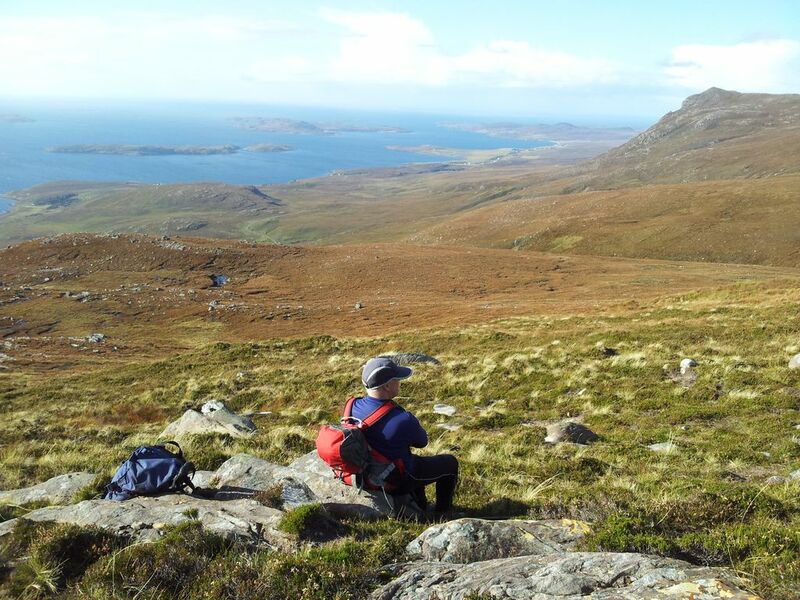 On Coigach there’s a welcome shelter where we stopped for refreshments; on Coigach the scenery is inspirational. 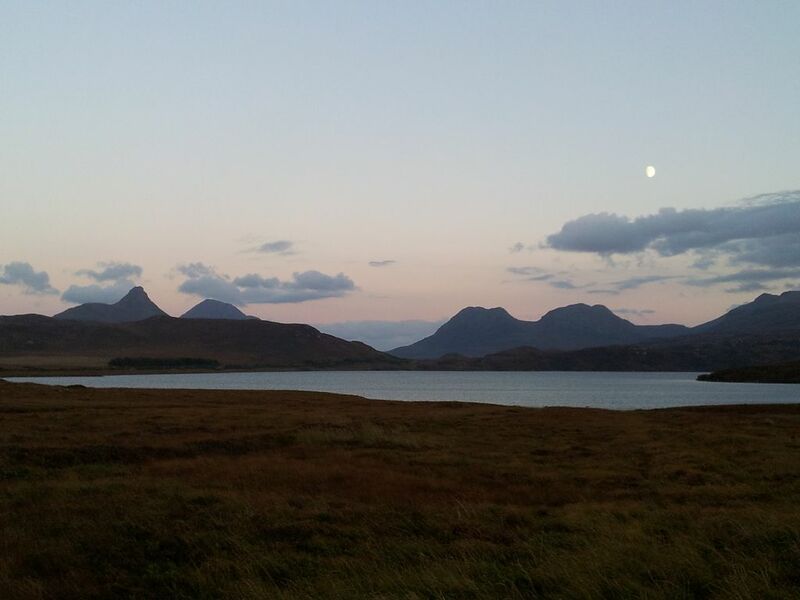 One wonderful window across Assynt, spoilt only by the inglorious vision of an old man munching a Mars Bar. After 2 hrs drooling at views south, east and west; now time for even better ones north. 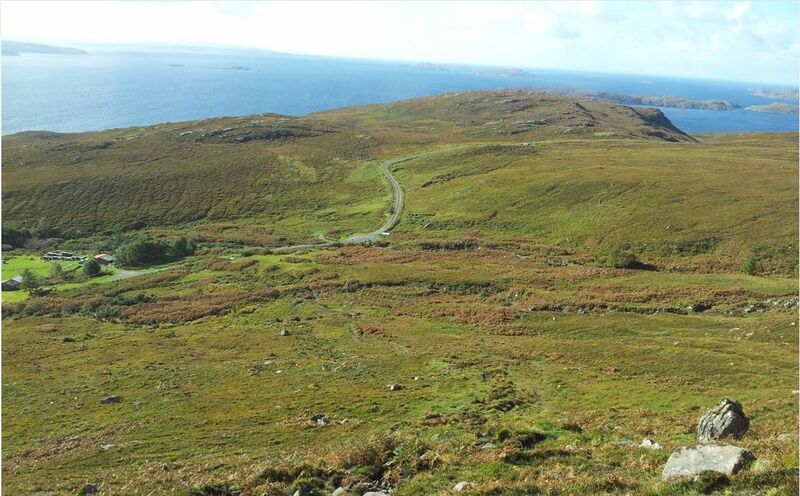 Just imagine all these photos from Coigach put together to make one dodgy 360 degree video? Well a team of specialists have done exactly that!! Only time for a 15 min stop then from the cairn we picked our way north eastwards across a strangely flat lunar surface. The aim is to swing round towards the spur of the Fiddler, but not too soon. We probably swung slightly late but there are no difficulties here and progress is swift if slightly boggy. Before the final ascent we looked down at one of the alternative paths from the east. Didn’t look too inviting, though the scene above it did. Also spotted a couple behind us, the first humans of the day and an advantage of the less popular hills (Grahams). 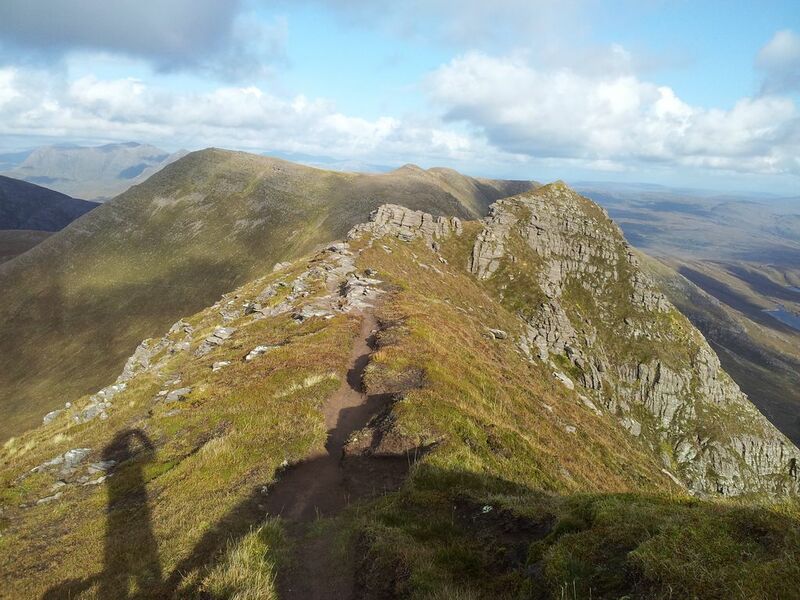 A steep steady 15 minute ascent brought us to the last top of the day Sgurr Na Fhidhleir. This incredible vantage point favoured by photographers is marked by a small cairn with little shelter. 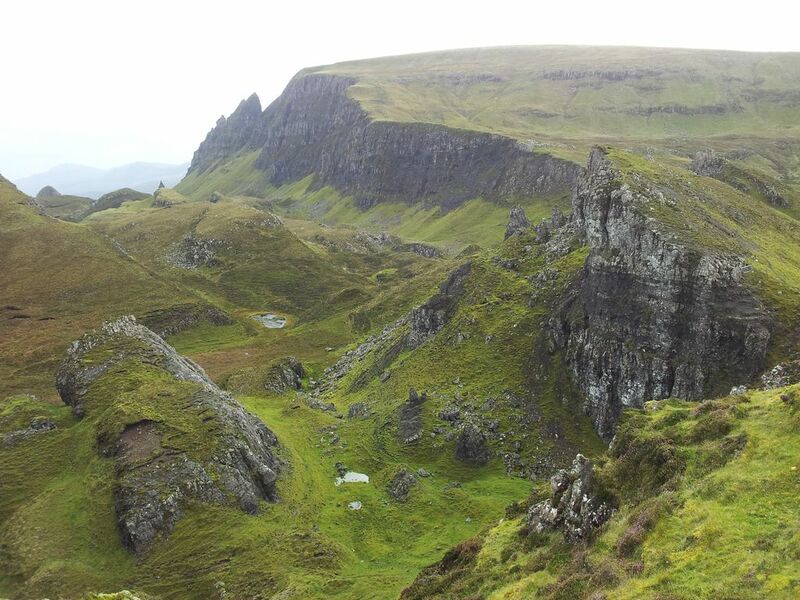 Only a few feet away are sheer cliffs plunging downwards to a green lochan filled wilderness. Strongest winds of the day here so crouching best for photography. What a situation and what a wonderful view, quite incredible. See below. Look at the shadow of the Fiddler cast against the mountainside below! Much fun on the Fiddler trying to identify the horizon, remote Seana Bhraigh spotted in the east. Quite a difficult place to leave even on a windy day, if any calmer I might still be up there. 5.15pm though and we needed to get down in time for an Ullapool evening meal. Now for that descent; nothing special, just a straightforward southwest line back to the car on sloping moorland. However soon the ground becomes surprisingly sandy, lightly cushioning footsteps making walking a pleasure. Add in the gentle gradient and an ever enticing seascape and lowering sun over blue island-dotted seas. All helps to make this the perfect descent for a guy with dodgy knees, I loved it and we raced down. (Ok gets a bit eroded at the end). Back at the car just 55 mins later at 6.10pm, a walk of 4hrs 40 mins with some brief time on tops, never enough time of course. 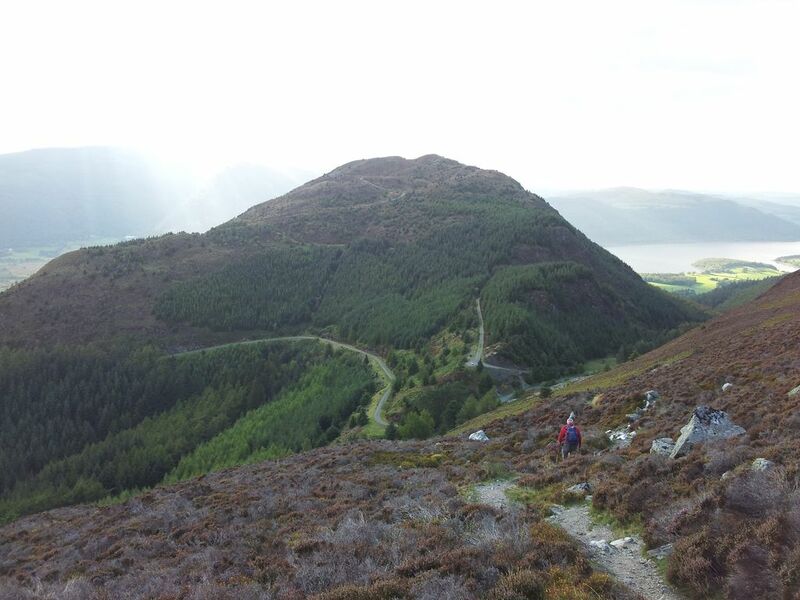 Highly enjoyable, amazing scenery, yes you could tick this off in the cloud but it’s one for the views most definitely. Now back to Ullapool, check in at the B&B then food and beer. The drive back was spectacular, bibs required for persistent drooling. Good food at the Arch Inn, Ullapool, best beer was the An Teallach. PS; on the coastal drive to Culnacraig I spotted a ‘Piping School‘ which for one brief moment I thought was to do with icing cakes, I kid you not. We just don’t see these things in England. 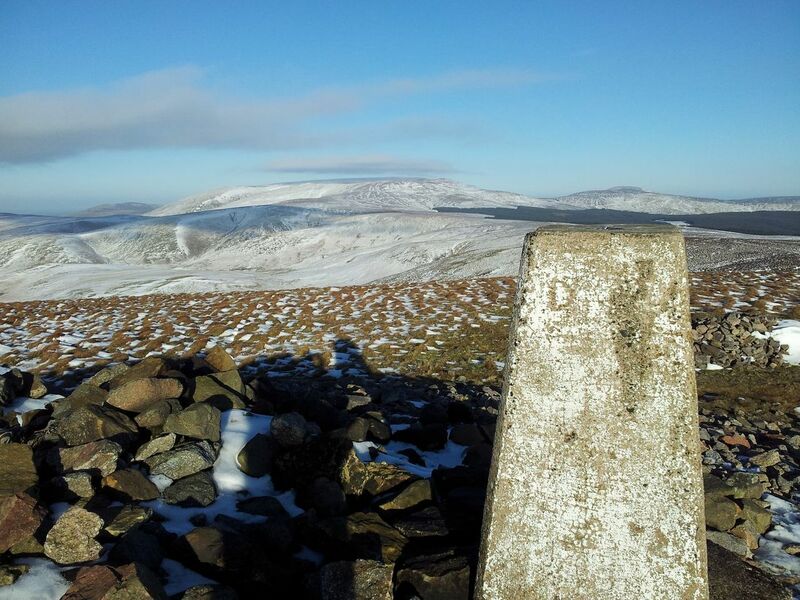 Another weekend Windy Gyle walk, a slightly new route and a chance to play in the snow! What could go possibly wrong, well actually nothing, it was an excellent adventure. 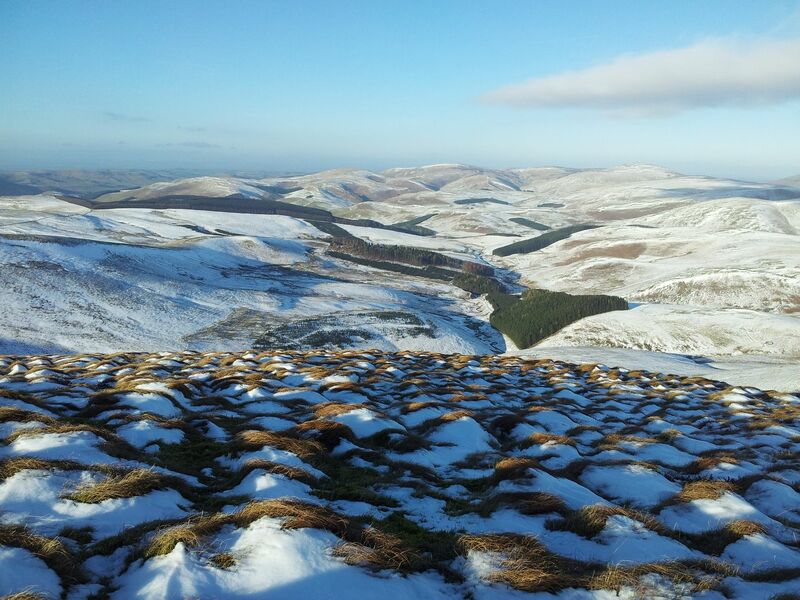 Also the chance to show a friend the Upper Coquet valley for the first time and views from the Border Ridge. Clear skies were forecast with hill fog due on the tops from mid afternoon, so a quicker ascent route was needed to ensure those views. 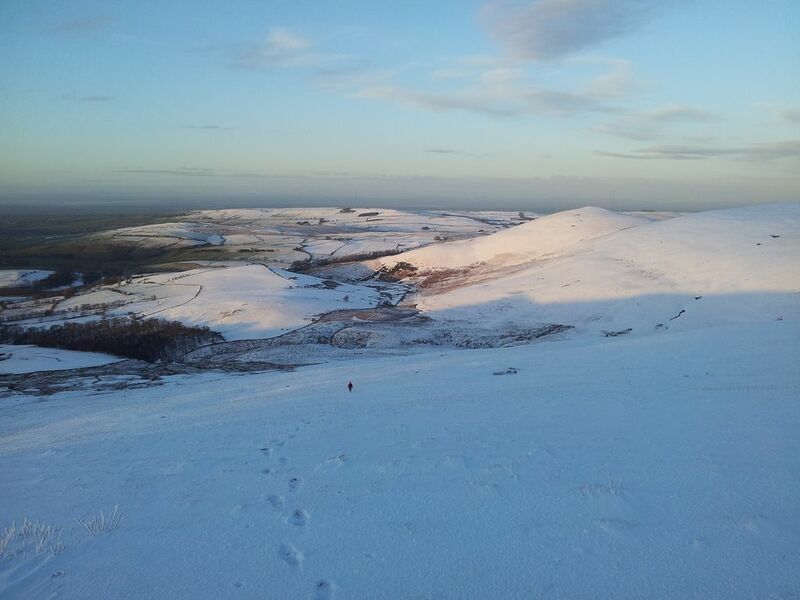 With far more snow on the hills than expected this would be a fun afternoon in the Cheviots. 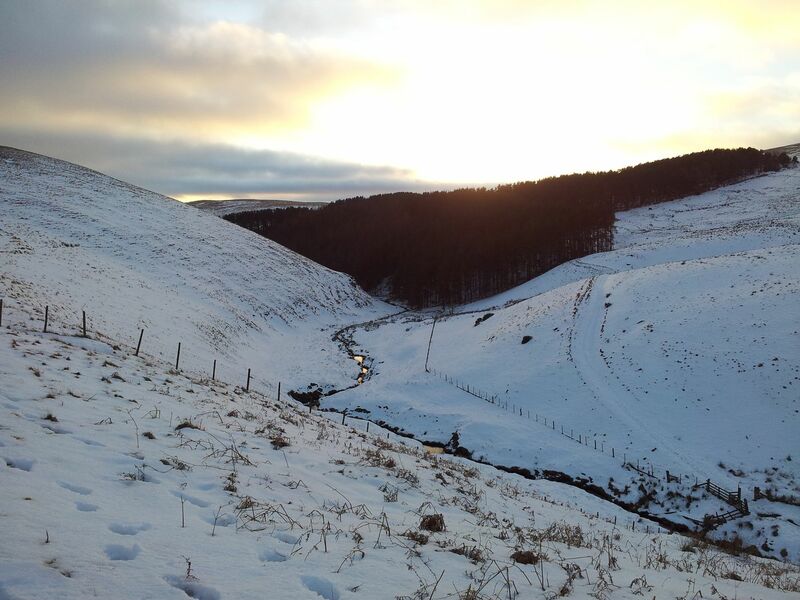 The stunning drive up the upper Coquet valley had rarely looked better as we pulled into a snow filled car park. 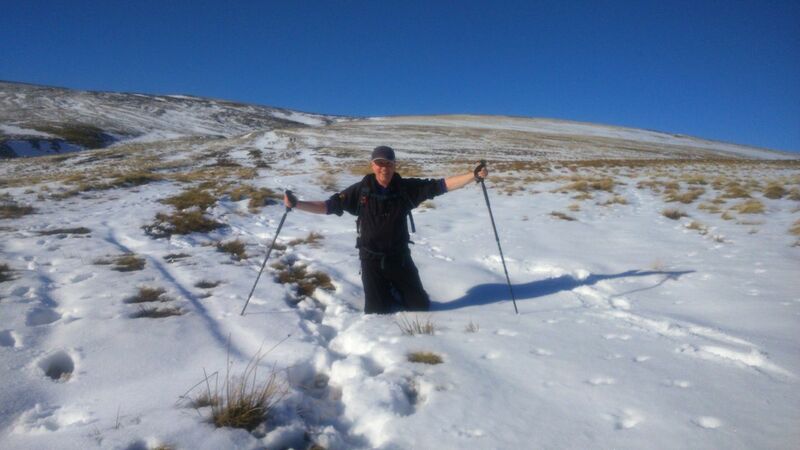 First thing was to whip my ancient Yeti gaiters on, luckily no one was around to see this distressing sight! Once dressed it’s a pleasant short walk north up the road by the river turning off to the Farm Tea Shop. They were closing at 4.00pm so little chance of finally making it back in time for a cuppa. 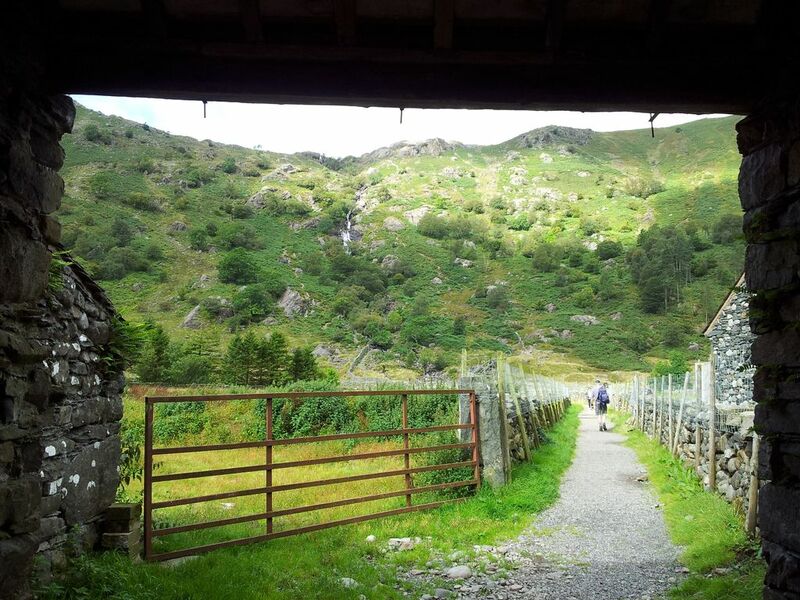 Instead of following the Hepden Burn we walked around the farm making for a path ascending the hillside directly behind. 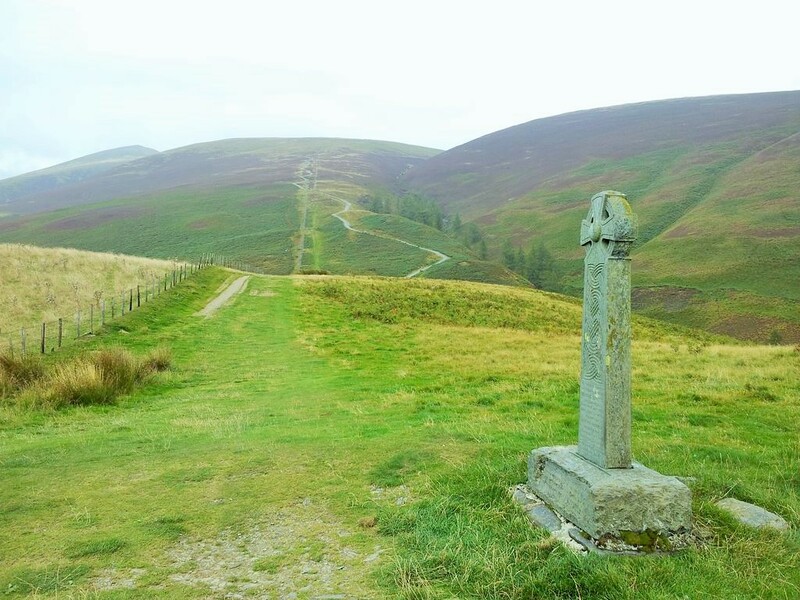 This is marked “Border Country Ride” on the OS maps ands takes a rough line up towards the direction of Windy Gyle bypassing Barrow Law, gently rising with attractive views back down the valley. Soon the path starts to level out with views opening up along the Usway Burn valley across to the remote farmstead of Uswayford. We passed a few armed squaddies, (always slightly alarming), fortunately due to my Ron Hills and the cold weather it was obvious I had no concealed weapons. After a few minutes of gentle descent we passed a small wood, but this is no ordinary wood, it’s Murder Cleugh! 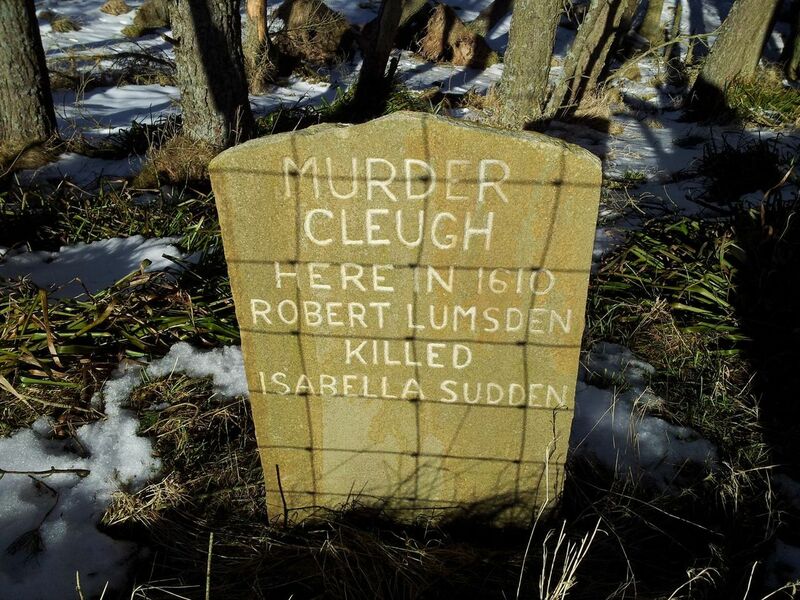 A Cleugh is a valley/ravine, a murder is an unlawful killing, which you probably knew. And here marks the spot! Next the gate incident! Hadn’t slept well due to a take away the night before, anyway as I bent down to gallantly open a gate there was an ungallant wind noise. 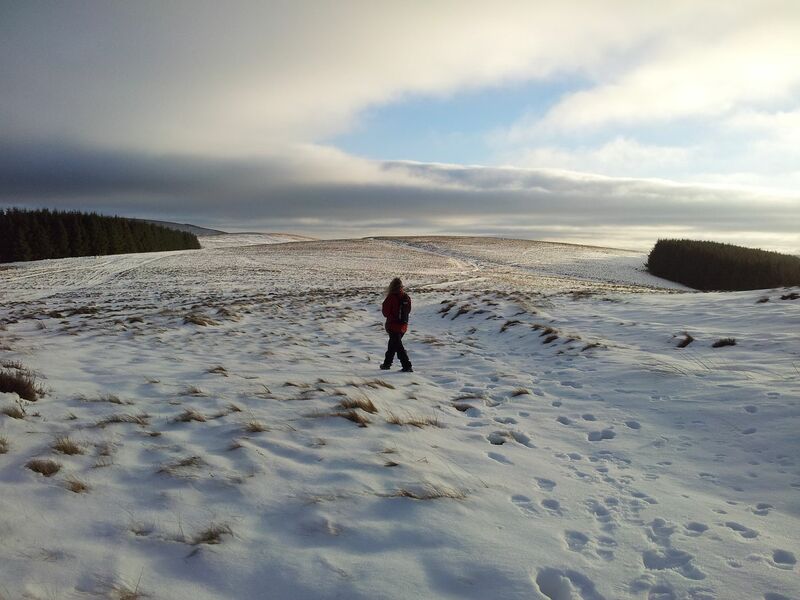 It’s very quiet in the Cheviots, I’d hoped my friend hadn’t noticed, alas she’d already collapsed crying with laughter. I tried blaming the rusty gate hinge to no avail, if only Alan had been here I could’ve blamed him! Anyway let’s say nothing more about the Windy Gate incident, (hangs head in shame). The Windy Gate of shame! 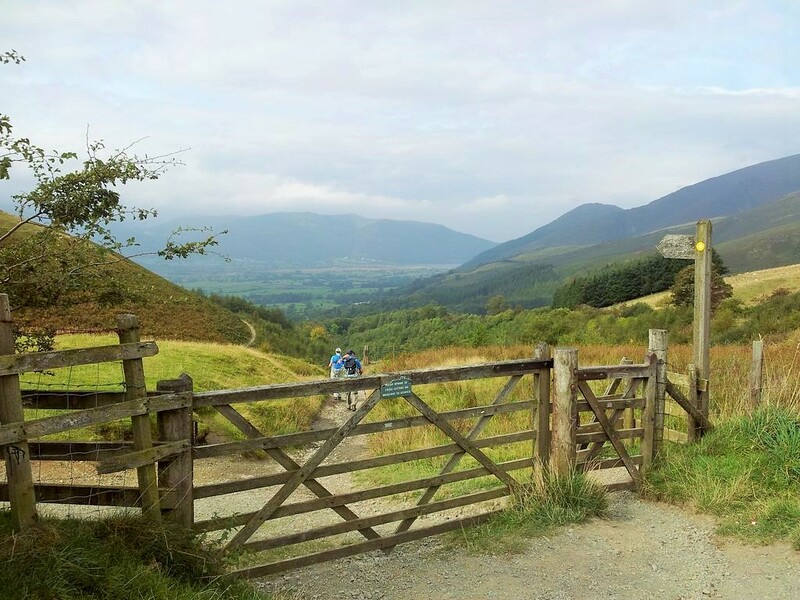 Through the gate, we crossed the private road/track following the walkers in the photo above to start another gentle ascent heading north. With a little height gain we suddenly noticed behind us a distant line of low cloud which seemed to have sprung up from nowhere. Slight panic ensued as I feared the delights of Windy Gyle may be lost in mist. We made a quick diversion to the nearby bump of Ward Law to at least secure some views. Nice bump, nice views, worth the detour. We needn’t have worried as the improved views soon allayed any cloud fears. 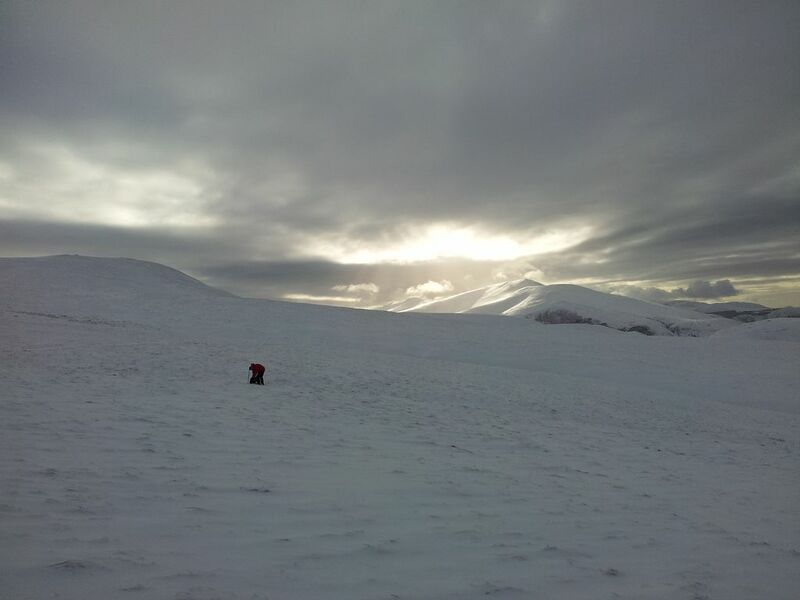 All was ok looking west which meant Windy Gyle would be something to look forward to. 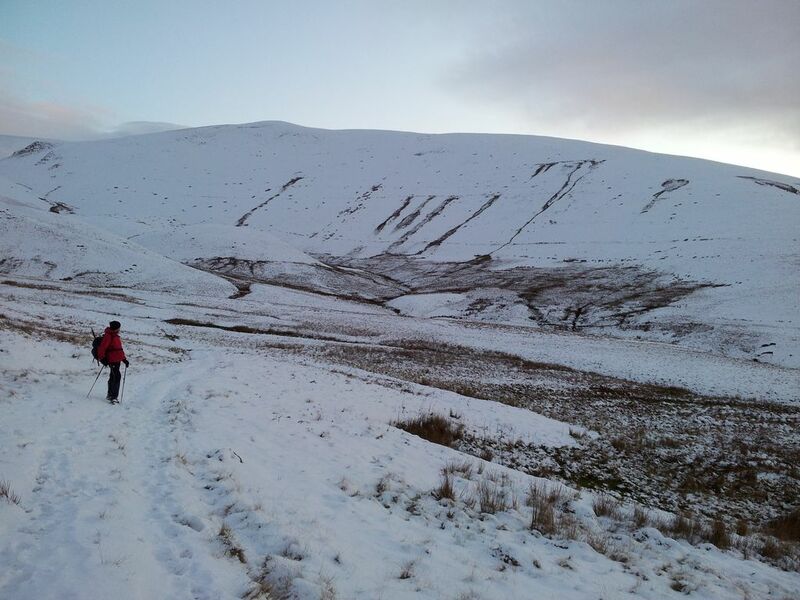 Firstly a boggy descent to rejoin the path which then swings north west to start the final peaty ascent up Windy Gyle. Bit snowy too. How to walk in snow lesson one – this is not how to walk in snow! One of the advantages of the more direct routes from the Coquet valley is you’re shielded by the high ground until the end. 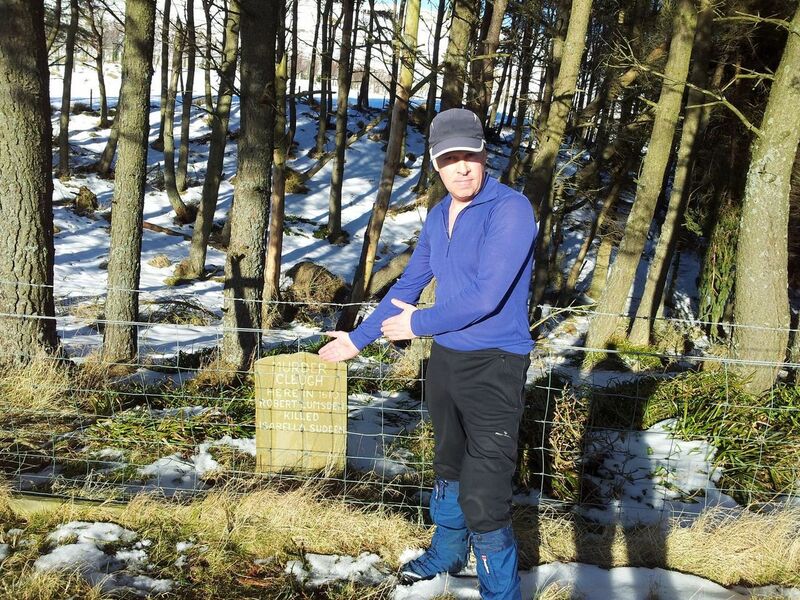 Firstly you see a gate then a sign and a large cairn. 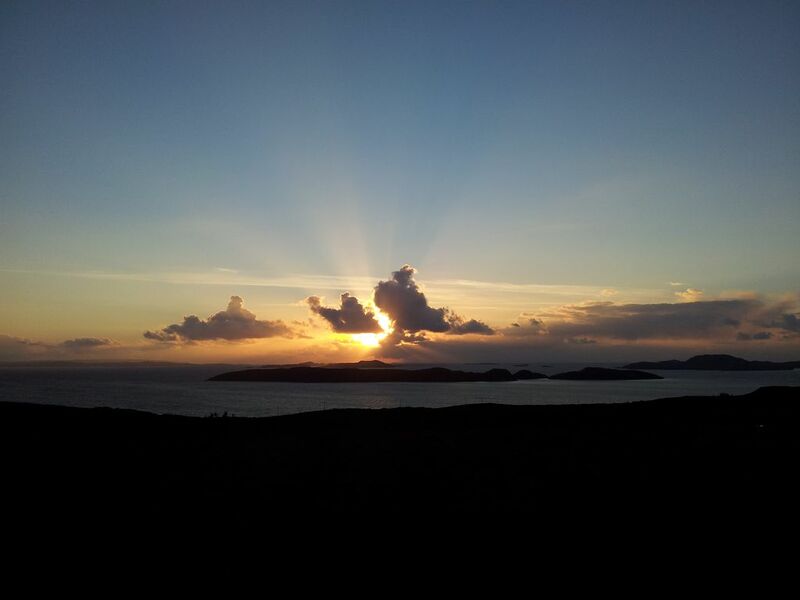 Then the full scene west and north bursts into view, something that grabs you every time. 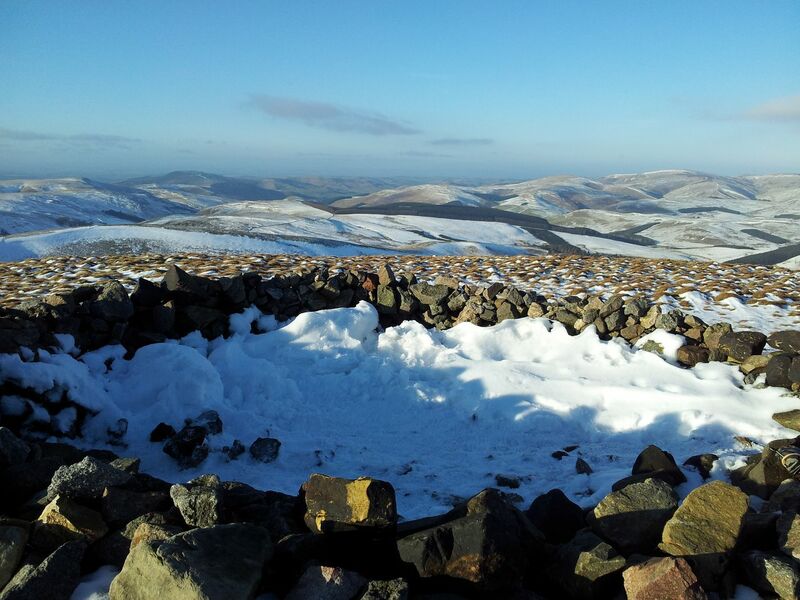 For a relatively ordinary looking 2,030 ft hill Windy Gyle certainly delivers and is my favourite spot in the Cheviots. You are in England and Scotland AND Lord Francis Russell was killed near here in a border dispute in 1585. 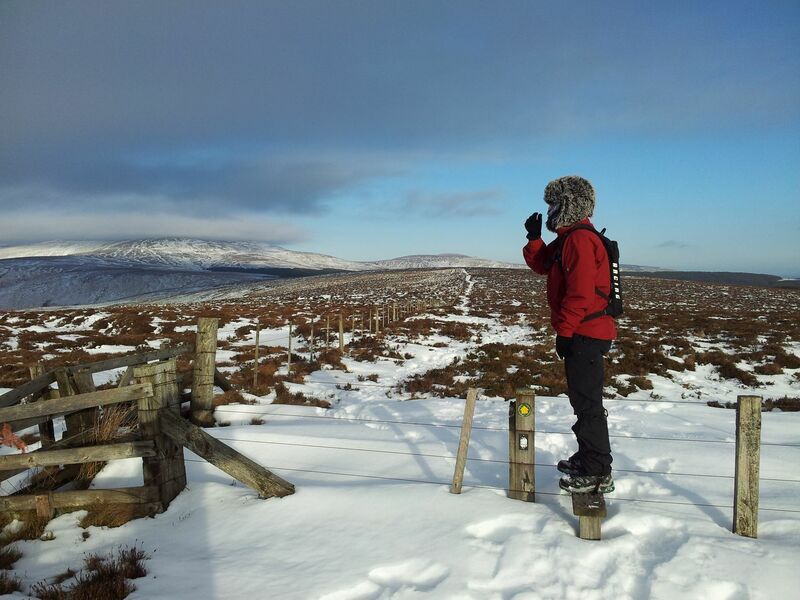 It’s all kicking off on Windy Gyle. There’s a welcome shelter too, it’s often windy on Windy, and you may want to stay awhile. Always the highlight of the day and a good place to refuel but always wrap up as the body seems to cool faster here than the coldest of cold places. Wearing a dead squirrel on yer head can help apparently. As can being slightly silly. 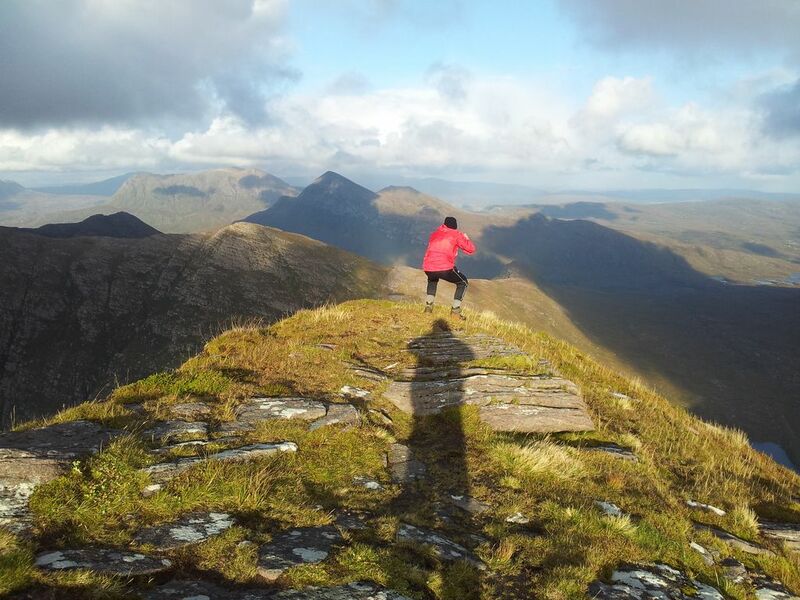 Windy on Windy – and it’s not me this time! 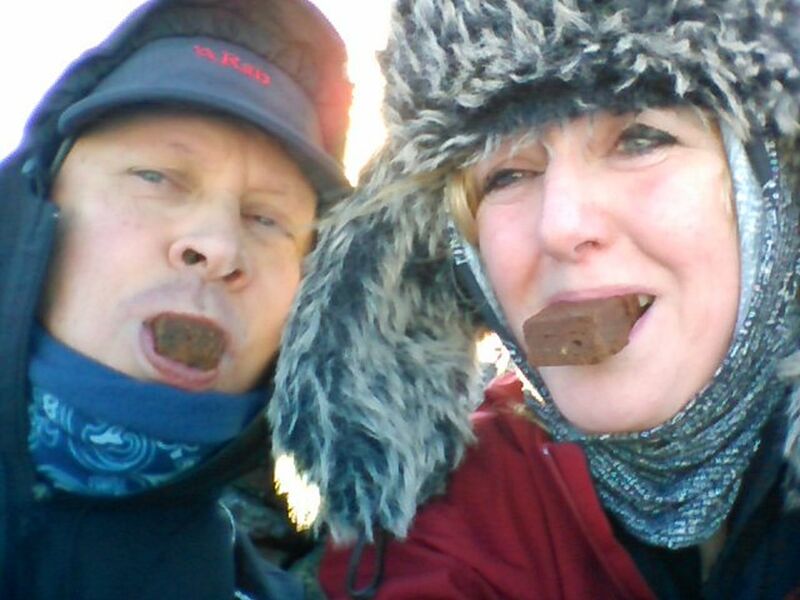 Brownie selfie, such a flattering photo, check our Buffs out! 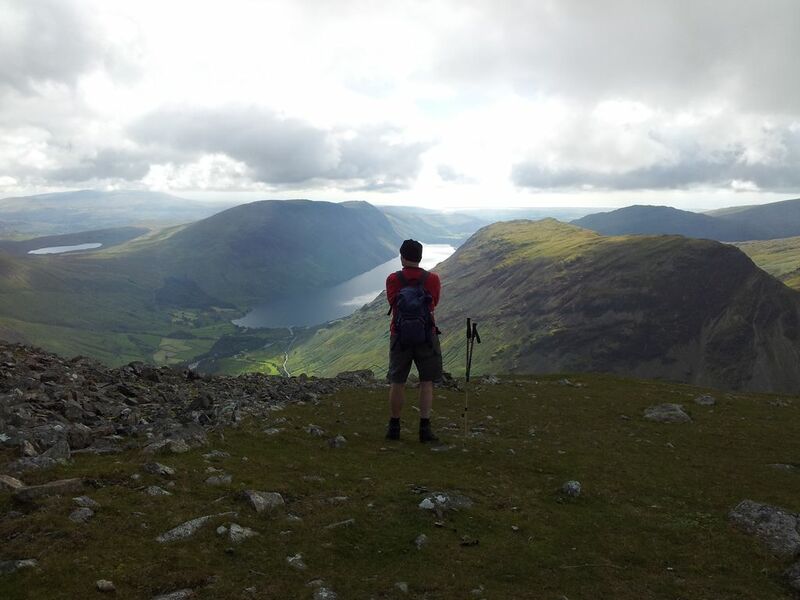 I can describe the horizon with my eyes shut – that’s Great Gable over there! Bizarrely I met my hill twin in the car park and then again on top, both of us wearing black Paramo Fuera windshirts with red rucksacks. I pointed out he’d let the side down with his non regulation black trousers! Two fashion icons, colour coordination is allegedly vital in the hills! 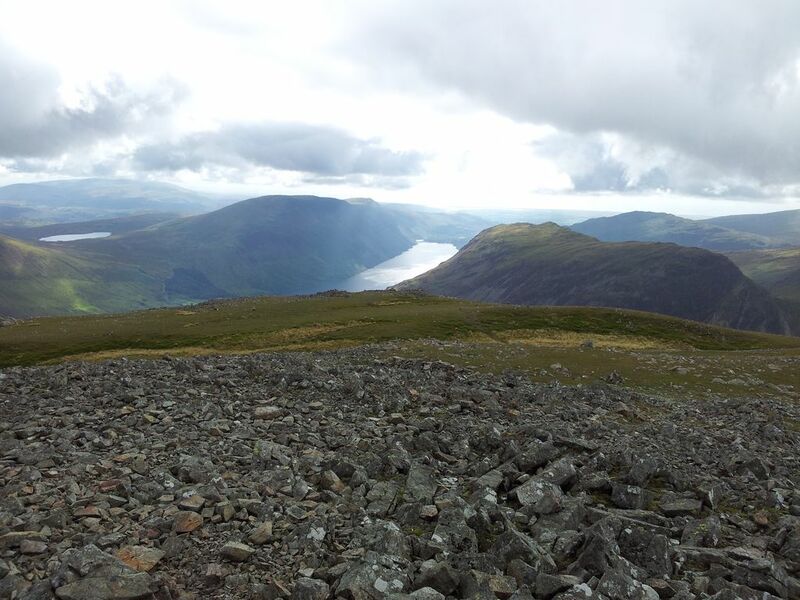 Descending slightly north from the summit gives a better view north, lots of lovely bumps. Always a reluctant place to leave, usually the stinging pain in your freezing fingers helps you on your way. 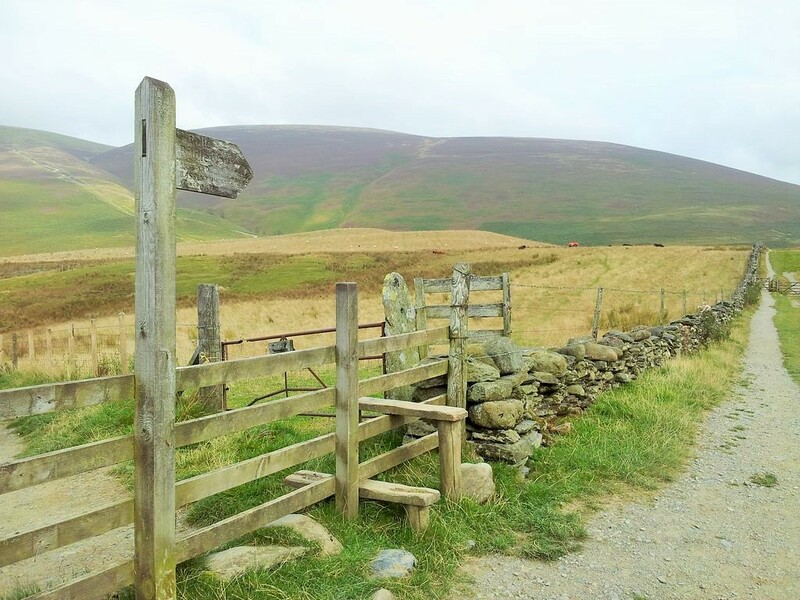 We retraced our steps southwards to the stile by the gate, then turned east following the paving slabs of the Pennine Way down to the Border Gate. 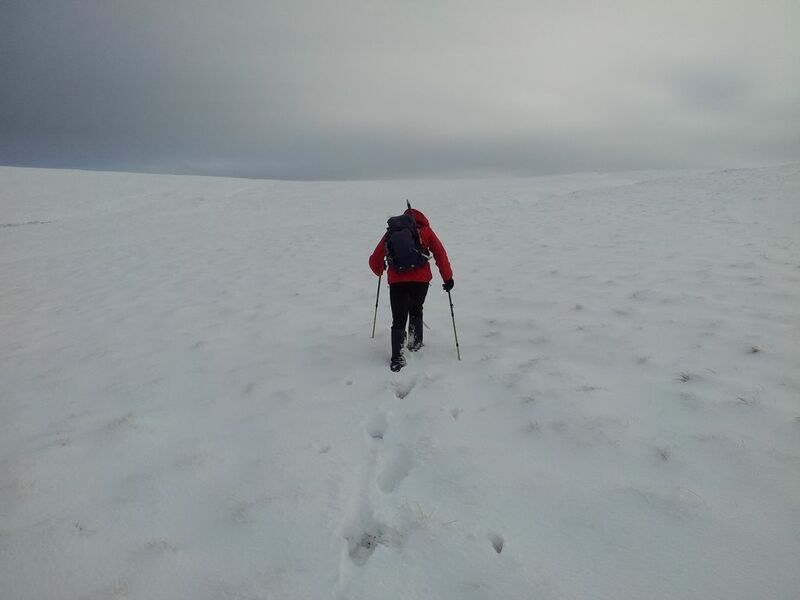 These often slippy slabs were a joy to walk on in the snow but ALWAYS stick to the path as the snow obscures some watery hell holes either side. A few deep foot steps left by previous walkers served as a constant reminder – and raised the odd laugh too 🙂 Ooh notice that patch of cloud forming over the Cheviot in the pic above which had rapidly expanded in the photo below. 3.15pm and the Met Office were pretty accurate again. 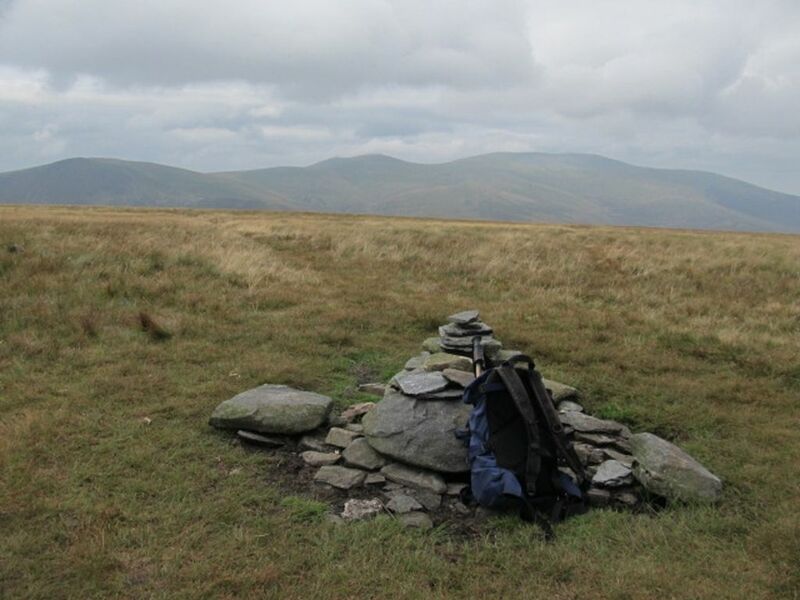 Windy Gyle has an excellent cairn shelter, two in fact as there’s also a mini one. The Border Gate however has a wooden log, nice. I’ve sat on it so many times and poured a cuppa. Today it was also a good place to throw snowballs. Time to leave the high ground and turn south for the slow descent back, firstly the featureless plateau between the forests before dropping down by Hazely Law. Walking down this section was mostly hilarious with the snow holding most but not all footsteps with just a few crashing through to bowl you over. The path descends to the Usway Burn valley before we nipped up over The Middle in tremendous light then through the dark forest of death via Fairhaugh. The wonderful light started to fade and we carried on south descending gradually back down to Barrowburn and the car at Wedder Leap for 5.40pm. 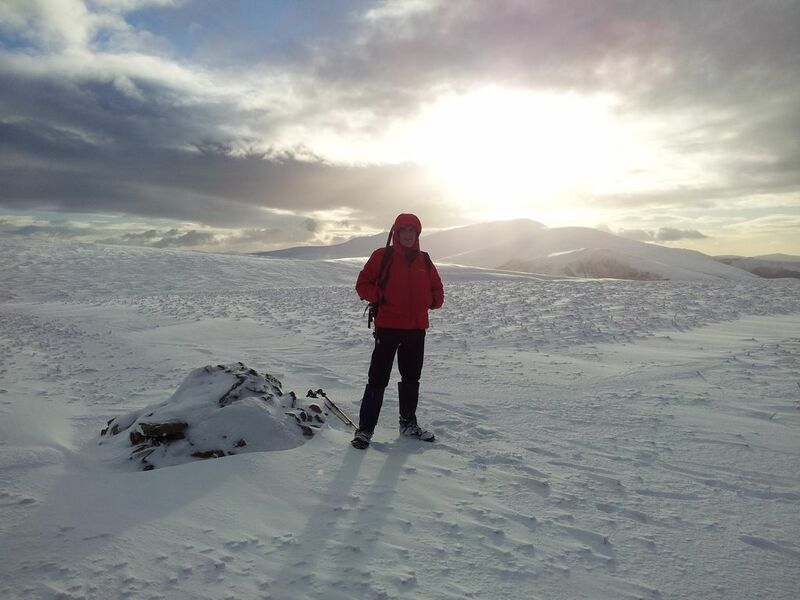 It had been hard going at times in the snow but worth every deep step. That crunching sound of boot on snow was also a constant and welcome companion throughout the afternoon. The windy sound from my backside less welcome. 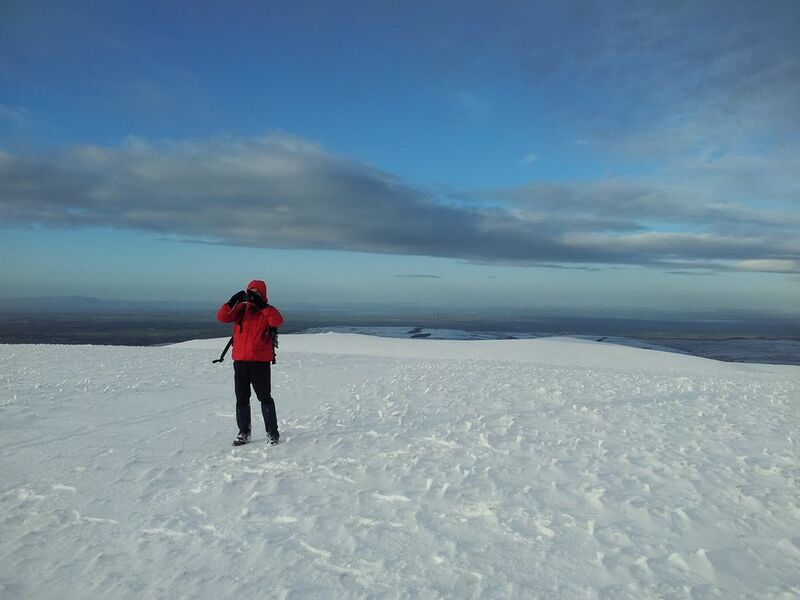 Today had been immense fun mainly due to the great weather, great light, great company and lovely snow. Not too cold, not too windy, no need for axe or crampons, just nice gentle gradients, (in icy conditions more care would be needed of course). 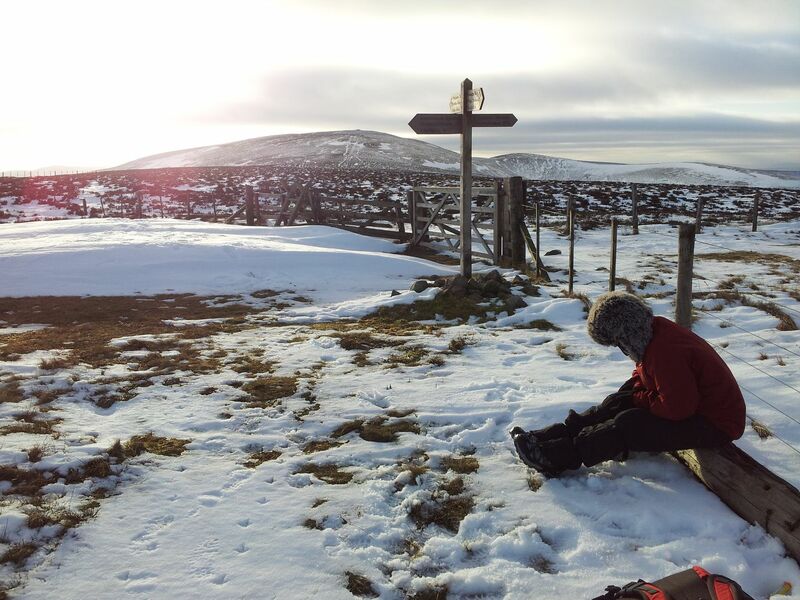 Another plus was ascending Windy Gyle via a missing route in addition to the usual ones;- 1) Via Trows Road/Slymefoot, 2) The Street, and 3) Today’s descent route via Fairhaugh. All differing in timings and features and all with their merits. Pint & food at the Anglers Arms at Weldon Bridge, on the drive back to snowless North Tyneside. They’d been on my list for ages, forever forsaken for more illustrious fells, relegated to winter then almost forgotten. After a lengthy 4 months away from the Lake District finally a chance to return and with a slightly encouraging wintry weather forecast. It would be interesting and full of snow, boggy ground would be frozen and views would hopefully be pretty damn good. We were not to be disappointed. Last time in the Lakes was mid September in shorts on a grand tour of Skiddaw, today would be different. After a dismal drive over the claggy A69 things began to improve on reaching the Lakes with lifting cloud revealing white sculpted mountains. Turning off the A591 at High Side we headed for the elevated start point of Longlands. As the road rose patches of ice appeared then tyres started losing grip on the final ascent. Deciding to drive no further we made a 7 point turn then retreated slightly leaving a 10 minute slippy road walk to Longlands. 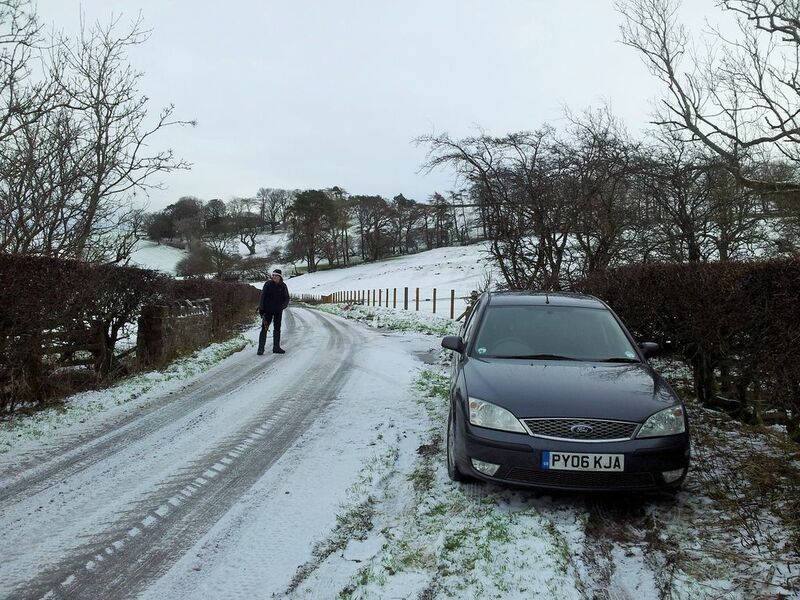 (In ice or snow the road from the top of Bassenthwaite west of Over Water is a better approach). 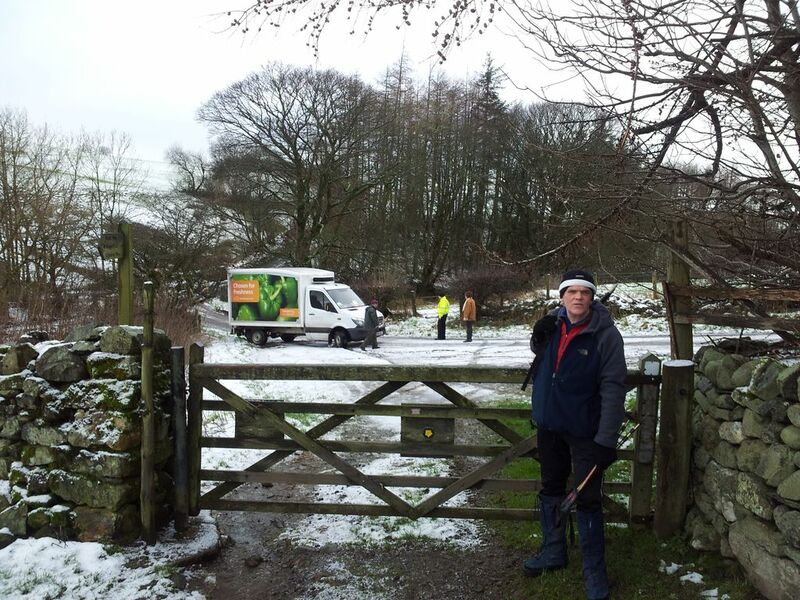 At the tiny hamlet of Lonscale we met a Sainsburys delivery van stuck in the dip! We had no regrets over our parking decision. There’s spaces for a few cars here, if you can reach it. Through the gate there’s two routes depending whether you’re doing this clockwise or not. Our clockwise route meant heading north east along the grassy old road gently curving and rising for 10 mins before turning off south up the highest grassy shoulder. You could easily head straight up from the gate but this small diversion sticks to the better ground. 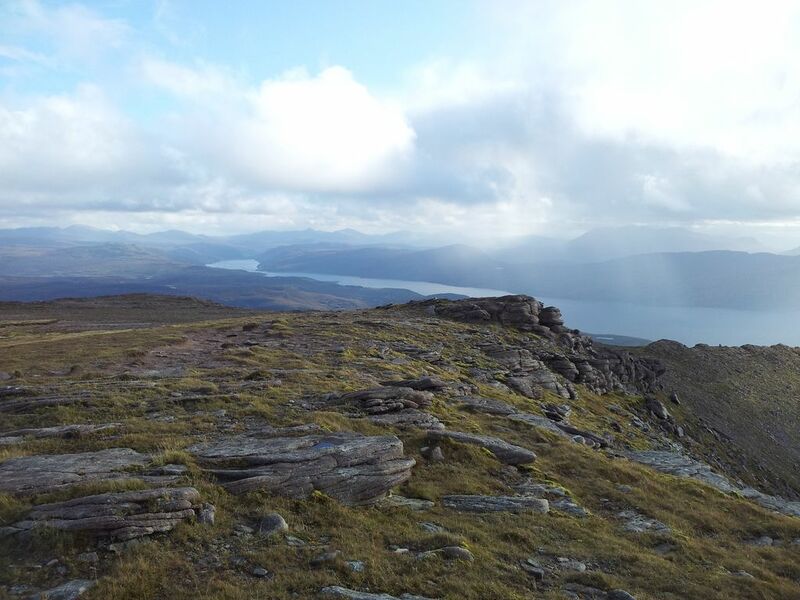 The weather at least was improving and instead of the forecasted low cloud the tops were pulling clear. This suggested the better weather was here early, but for how long and what about the possible 40mph winds later! It didn’t take long for Alan to utter his immortal words, “we should’ve been up there”. Just 25mins after leaving Lonscale we reached our first Wainwright and there can’t be many more straightforward ones. Nice views back across the clearing Solway Firth with snowy McScottish hills twinkling across the sea. Very refreshing to see no tracks in the snow, we were the first ones up despite our late start. 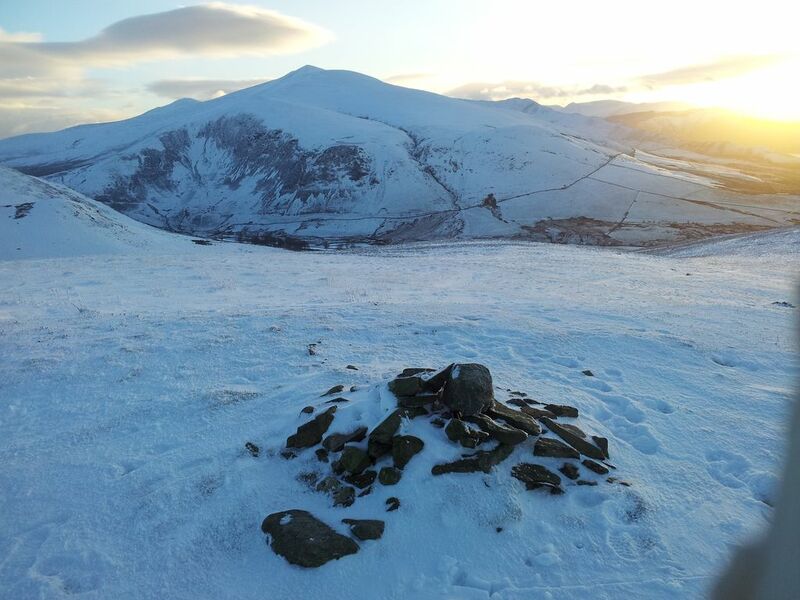 Skiddaw also looked very attractive, definitely better in snow, as are most things. 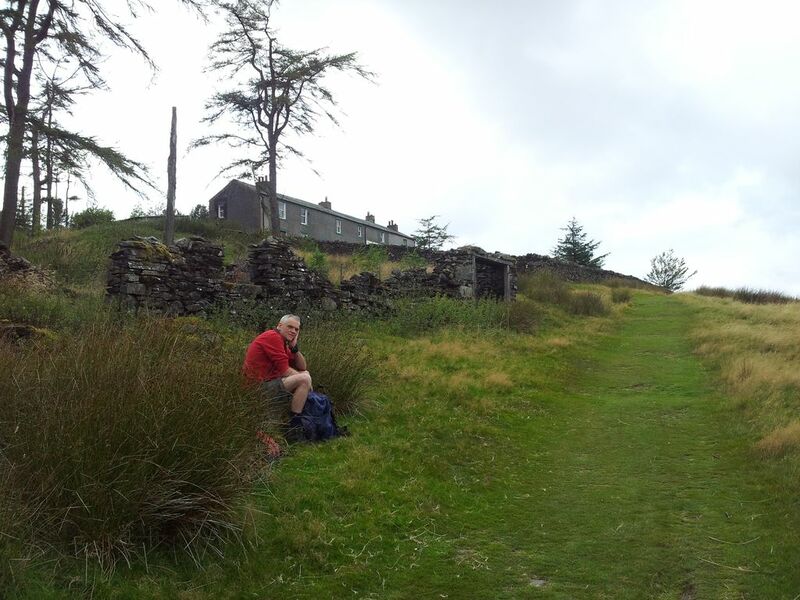 We continued on southwards down a dip where you can either follow a track east around Lowthwaite Fell or just head up. 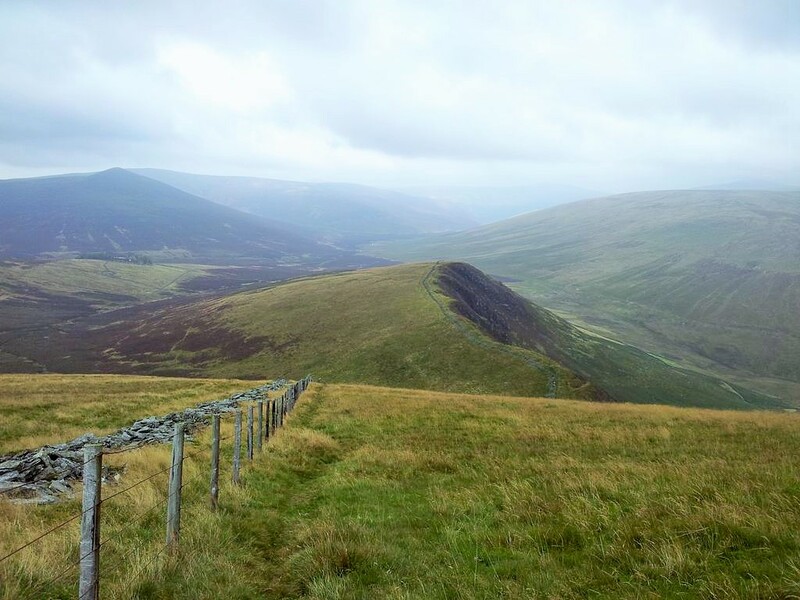 We headed up, it’s not far and it’s not a Wainwright, that would just be too easy:-) From the mounded top we then turned east down into the valley towards Brae Fell which sits stretched out on a higher limb. There’s probably a nice track to follow but down here the snow was deep so we just ploughed onwards. Here’s a tip for walking on virgin snow, pretend you need to adjust something and wave your mate ahead. Then follow in his footsteps. My mistake was picking a long legged Alan. We contoured around a small gully, actually I edged carefully down across it then discovered just a little more contouring would’ve avoided this. 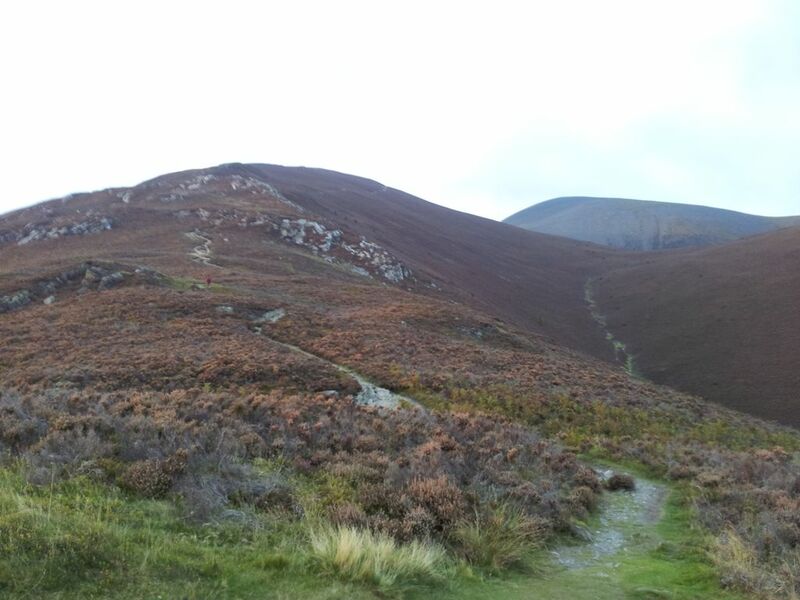 Then a pull north up towards Brae Fell joining a decent track. Very nice views up here including a faint Isle of Man. We saw ski tracks up here and spotted the first few people in the distance. Turning back south we then passed an actual person, the only person we passed all afternoon, a benefit of these modest hills. 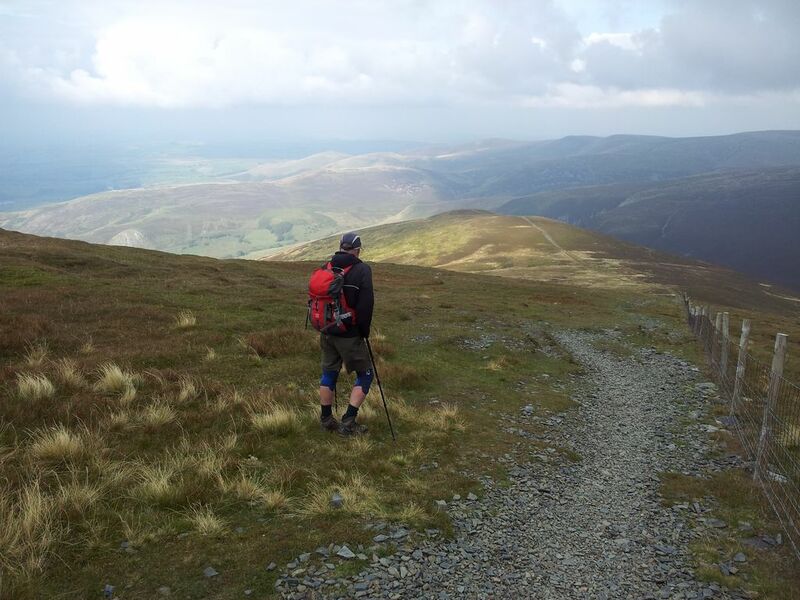 It’s then a steady 20 minute or so trudge up to Little Sca Fell. Conditions rather nice now with cloud drifting away and no signs of gales, just a bit nippy. 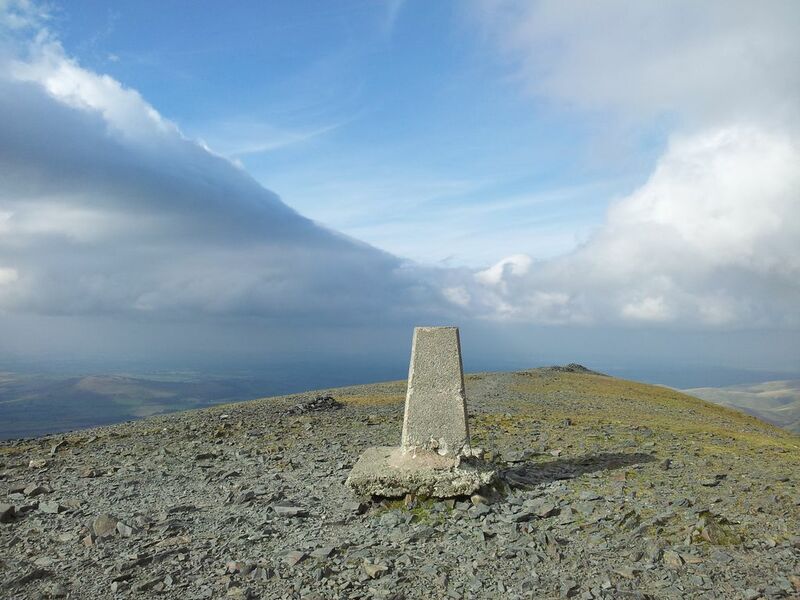 A short trek to Great Sca Fell, slightly higher yet less satisfying. 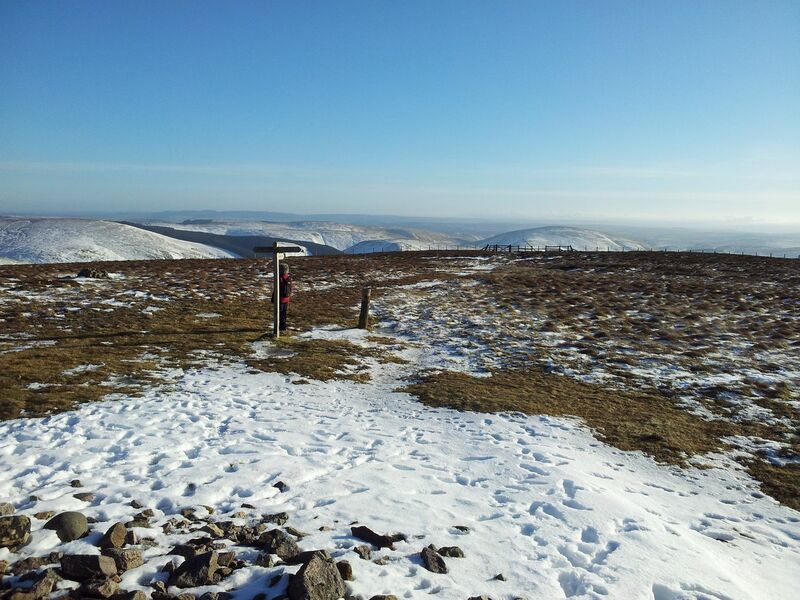 From here an out and back diversion can be made to the Knott which gives a panoramic view of the south which is the main thing missing from today’s route. 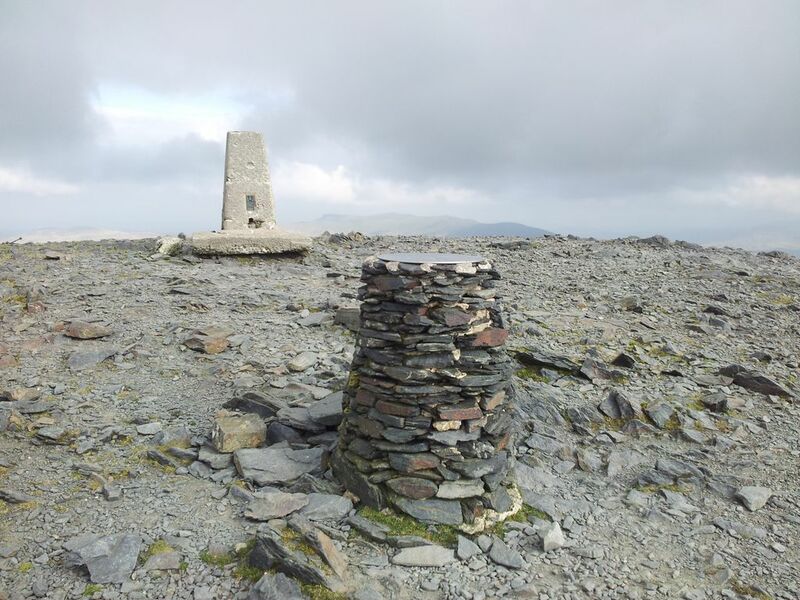 We had already done the Knott but it’s probably worth the detour if you have the time. We did not, so we did not do the Knot. With more time we would have done the Knott, but we did not. I hope that’s clear. We had many similar sounding fun conversations in the snow that day. 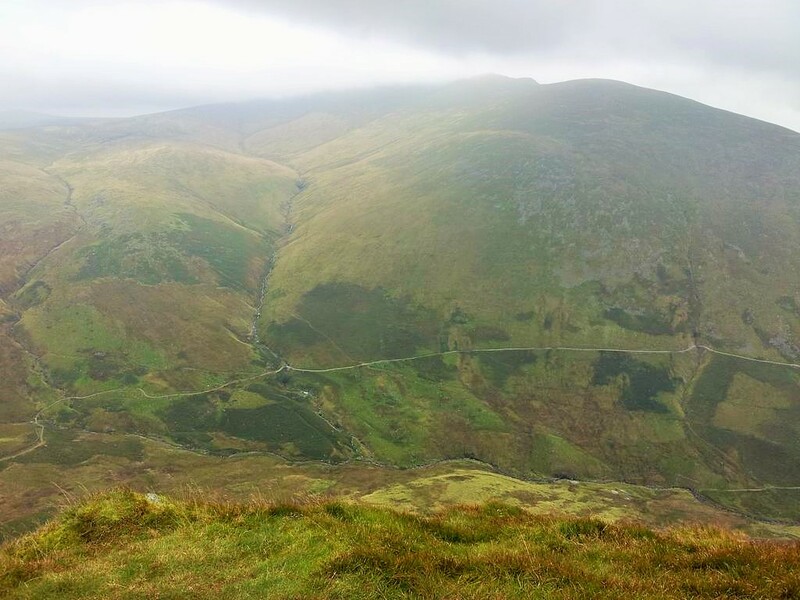 From Great Sca Fell we turned west, descending to a dip then up to Meall Fell. First chance to sit down on this route but not for too long in the cold. Damn glad I’d brought my ancient Yeti gaiters out of hibernation, how the elasticated rubber soles are still going strong is beyond me, but they reminded me how excellent they are in totally enclosing the boot and shins with ancient Gore tex. Dry feet all day. 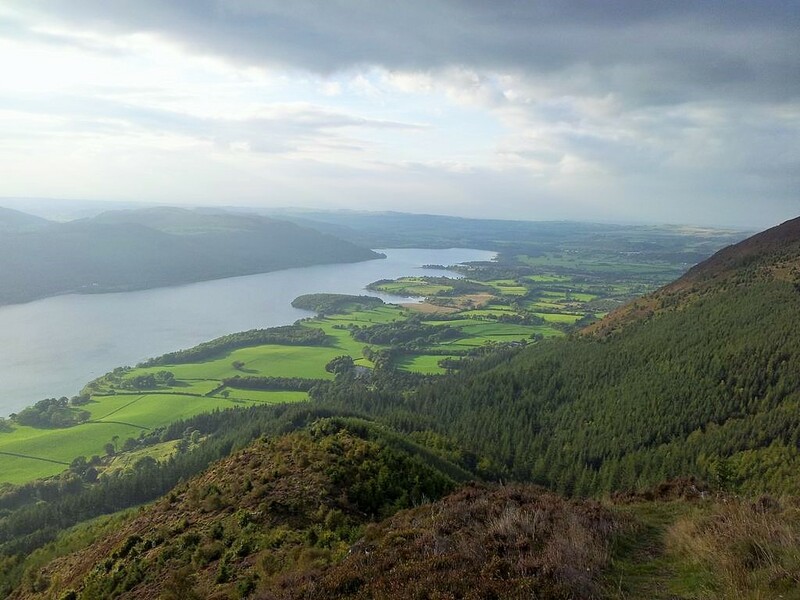 Having feasted on choccy brownies with flask tea we made the short descent down to the dip of Trusmadoor then the short ascent to the final Wainwright with the glorious name. Great Cockup, what can one say, except there’s nowt here except a tiny pile of stones, lovely views of Skiddaw and the Solway coast. There’s no shelter on Cockup and a strengthening freezing breeze started to bite at the face, so time to go. Most routes retrace down to Trusmadoor before heading north, I’m guessing to avoid boggy ground. From here though it all looked pretty straightforward so we walked out to the west top before blasting directly downwards north in the snow. Excellent fun, my dodgy knees even seemed to like the soft snow. After speeding down the slope we turned right joining a path east crossing a tiny stream to join the main track from Trusmadoor. 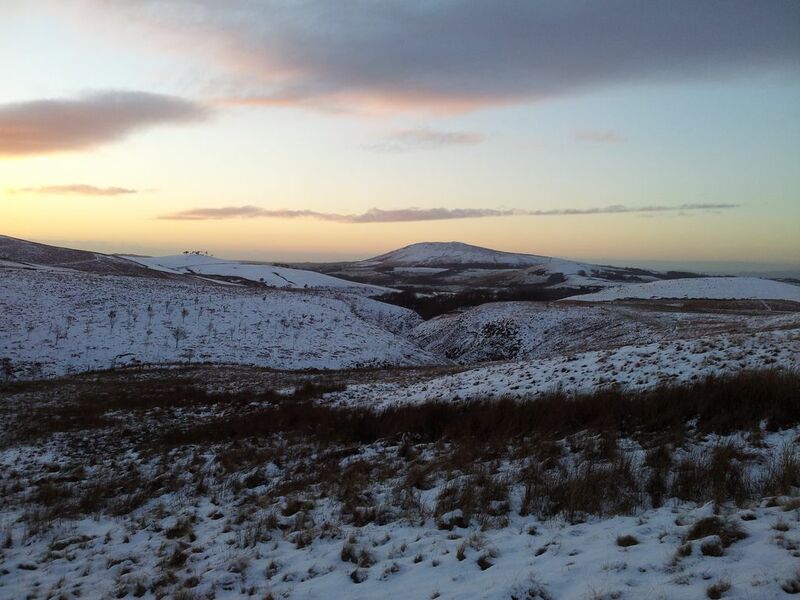 This heads north back to the starting gate at Longlands giving a last lingering view of Binsey with the sun going down. Only then did we remember the extra 10 minute slippery walk along the road to the car. Instead of taking the same route back we drove west of Over Water via a straighter flatter wider road to meet the A591 further north, definitely the one we should have taken. 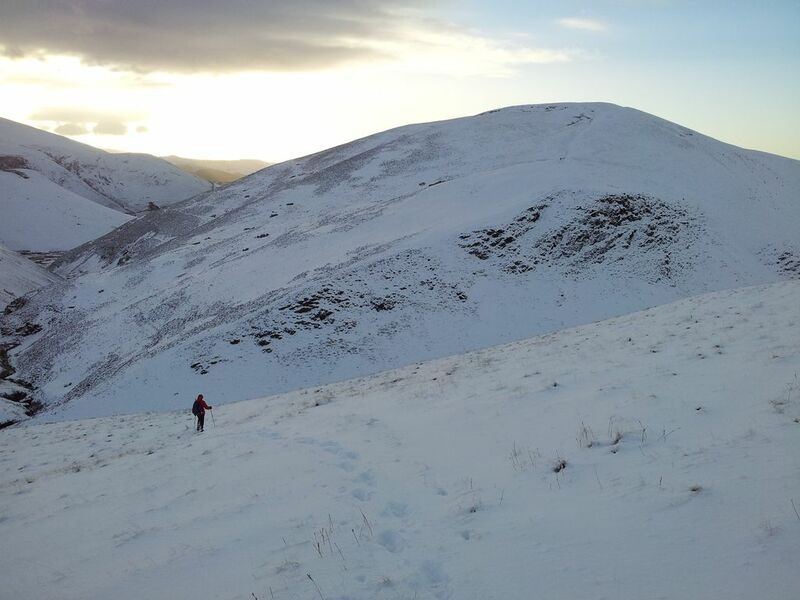 A great afternoon in the snow and arguably the best conditions to walk these hills. 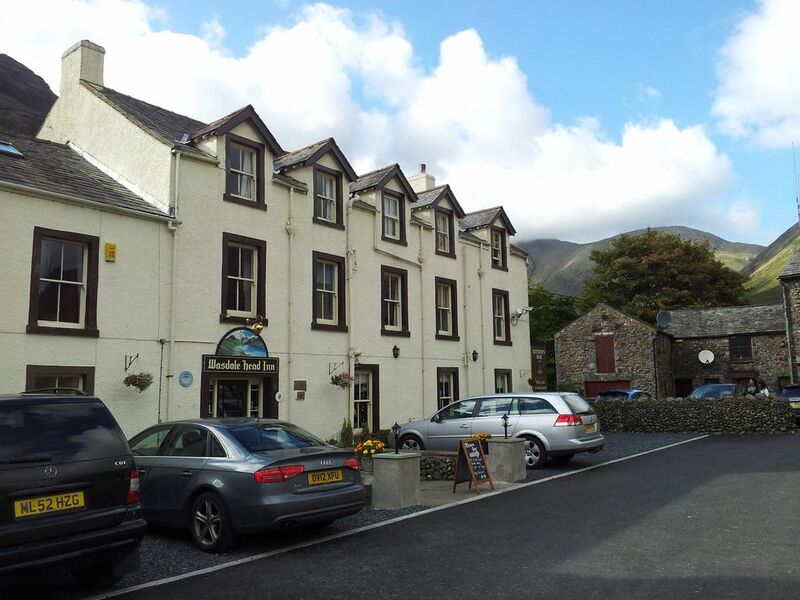 Stopped for a pint at the Middle Ruddings, a friendly Braithwaite hotel bar with well kept real ales. Most walking routes on the net favour today’s clockwise circuit which has a nice rolling feel to it. Either way would work maybe depending on the prevailing wind or whether you want the low sheltered path at the end or the start. Must admit I’d choose this way again. 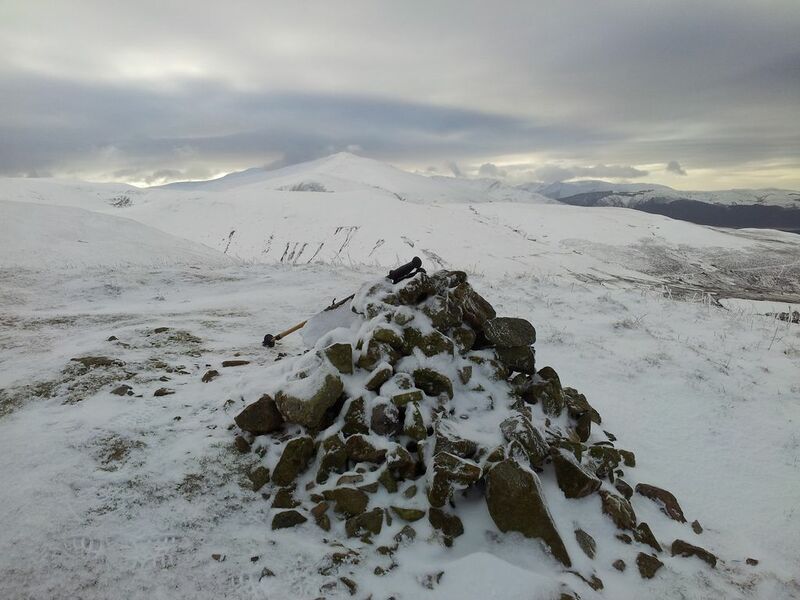 (Whilst we were enjoying the soft snow on rolling hills it was sad to see a walker fell to their death on Helvellyn’s icy Swirral Edge. 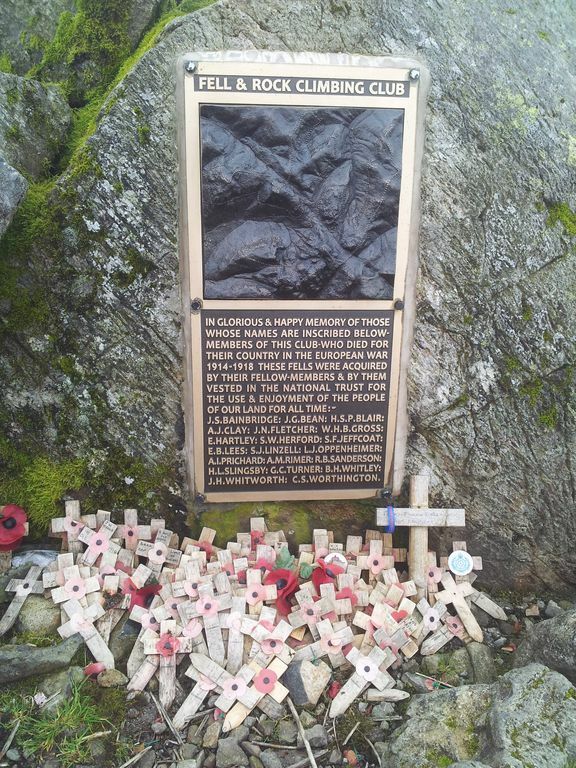 Condolences to the families and friends and a reminder of the dangers of winter conditions in the hills. We didn’t need our crampons & axes today but carried them nonetheless, being over equipped is safer). 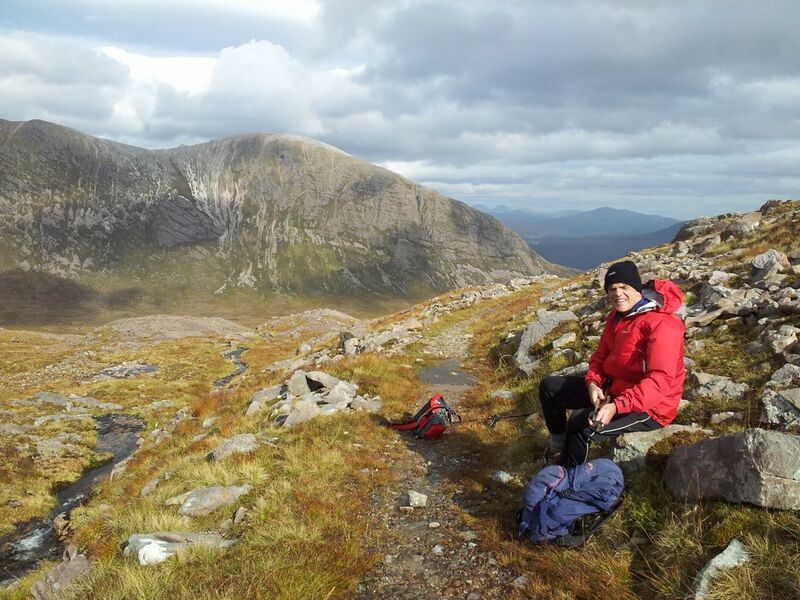 Day two of a week’s walking holiday in the north west highlands. After a night of heavy rain and gales we were in no rush to leave our Plockton guesthouse, so instead enjoyed a leisurely breakfast chatting with the owners and guests. 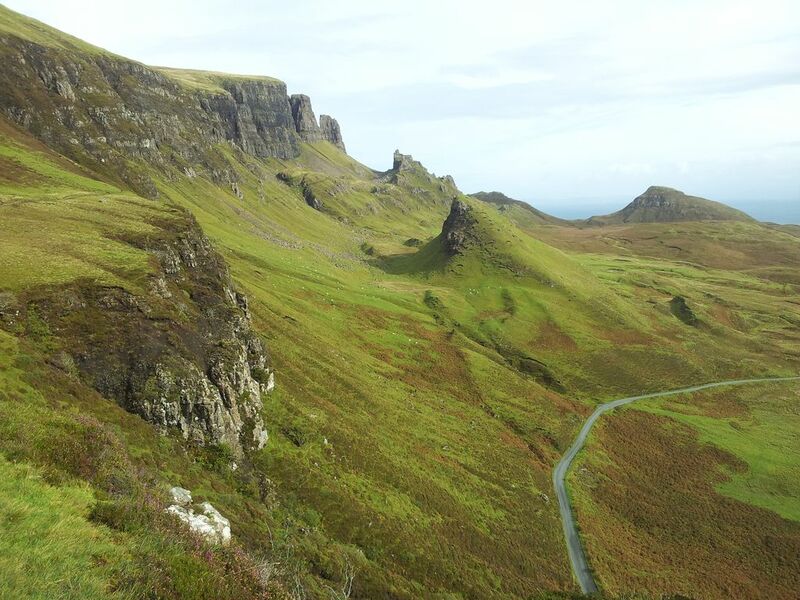 Hopefully a decent weather window would arrive later in the day from the north west, so plan A was to head to the Isle of Skye for an afternoon walk. 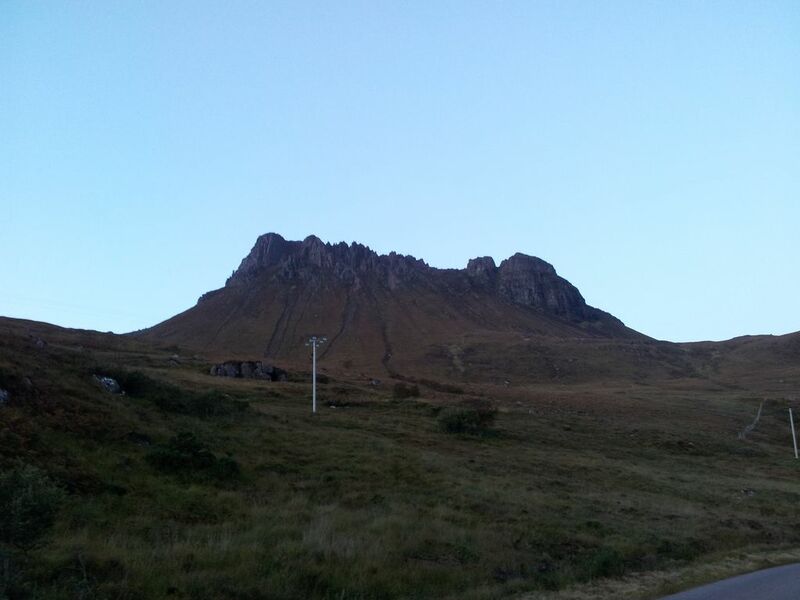 Always exciting heading to Skye, first glimpses appearing invitingly on the entertaining single track road to Kyle. 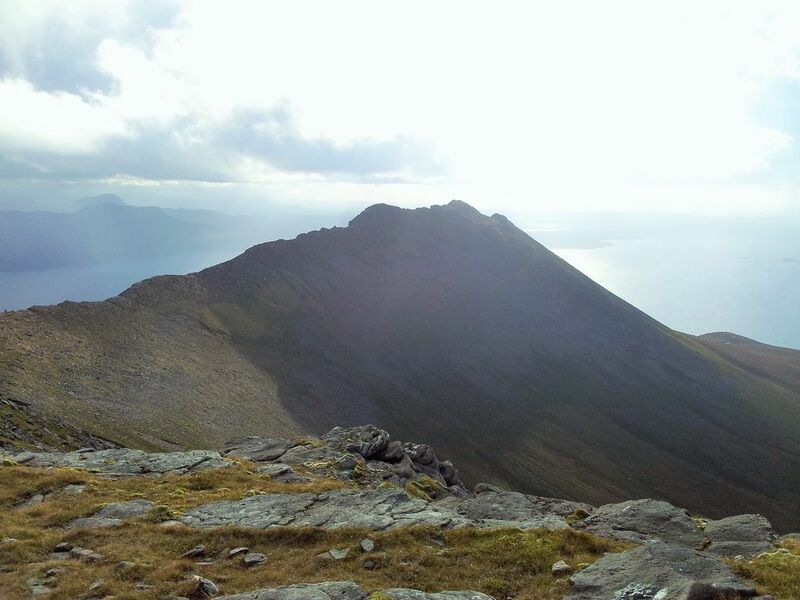 Cloud was down over the Cuillin whilst lower areas looked far more inviting. 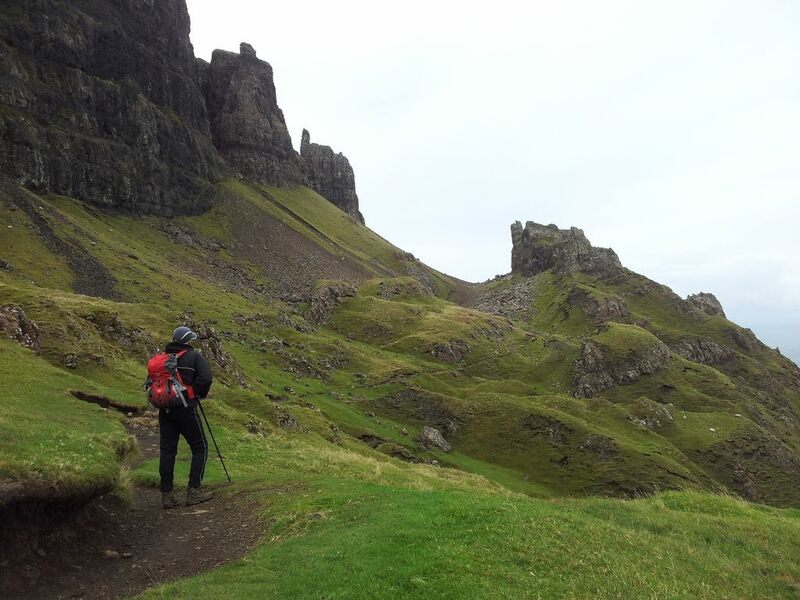 We discounted a few walk options along the way before choosing north Skye as the best bet. 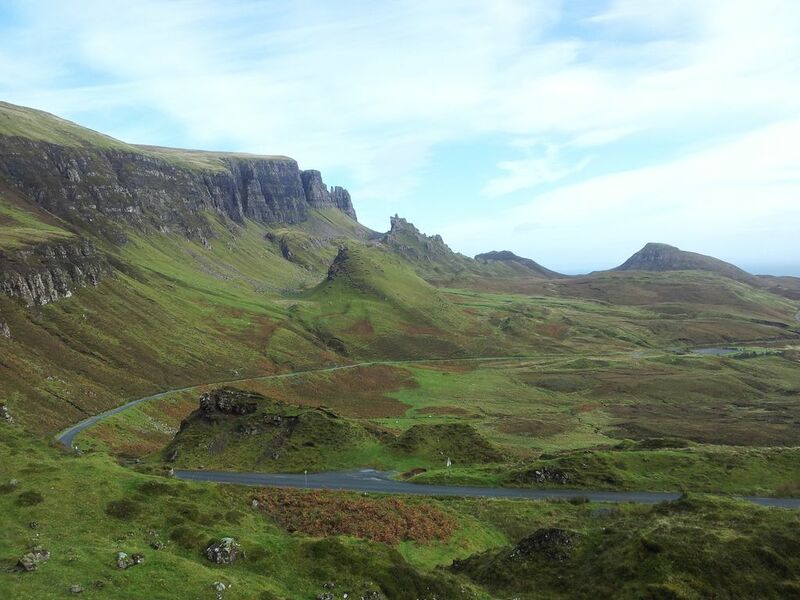 Nearing Portree the Trotternish Ridge was already enjoying perfect blue sky and we began to regret our late start. 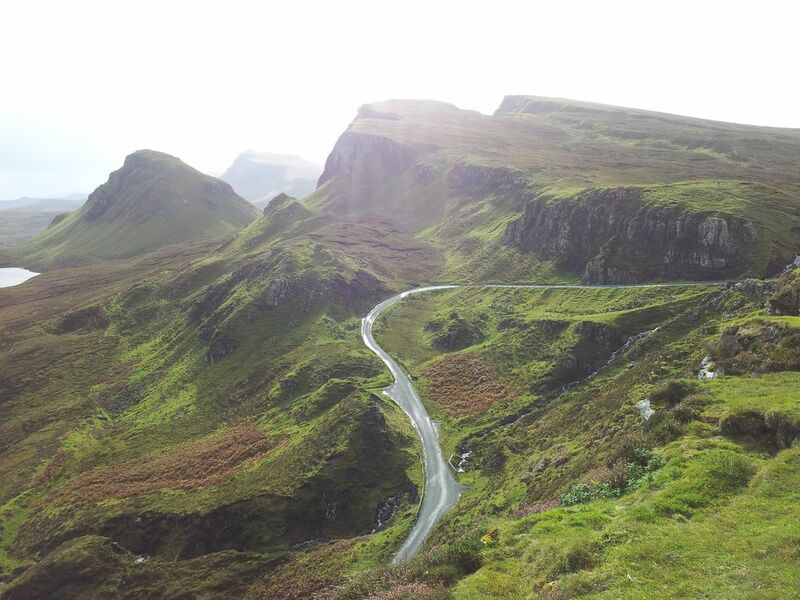 The Quiraing had been on the to-do list for ages but we always ended up diverting elsewhere. 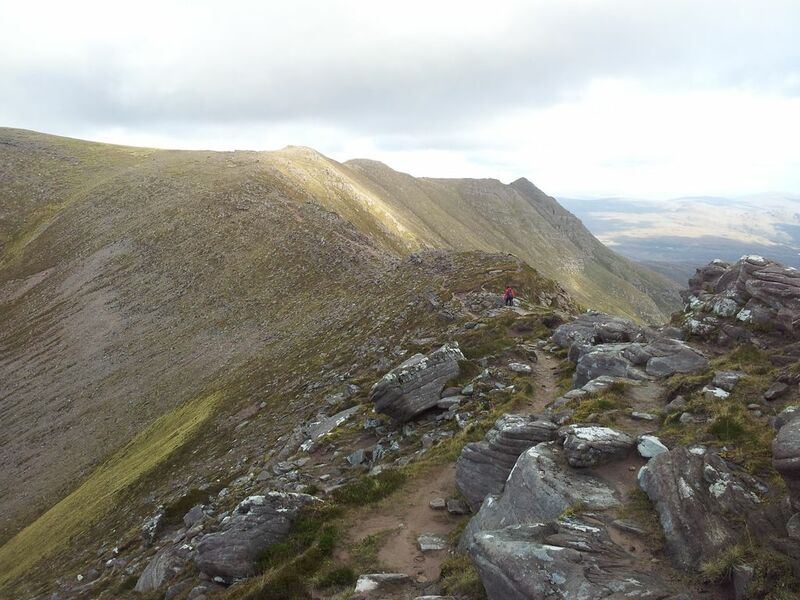 We wanted to do it justice in good weather but whenever good weather appeared we rarely made it past Sligachan. In poor weather we’d end up at the coast especially the northern point of Rubha Hunish. Today we didn’t have time for anything higher so just hoped the weather would hold. 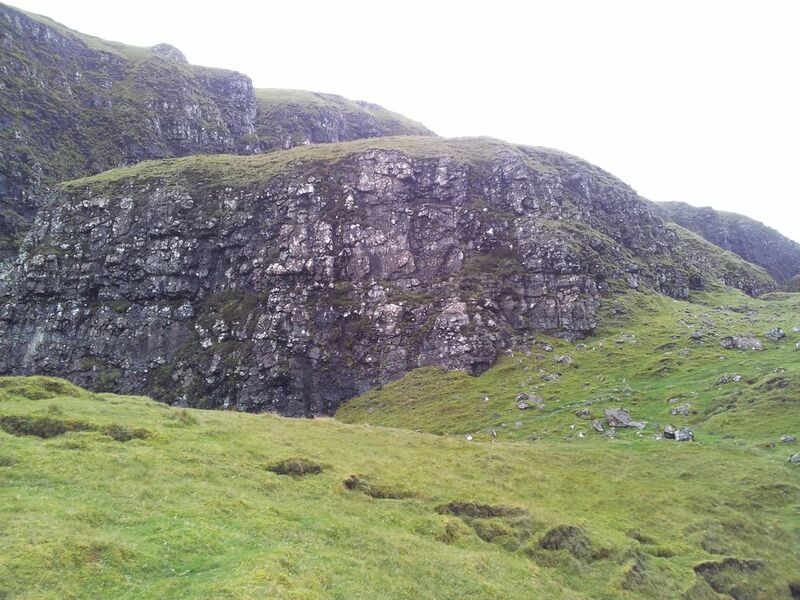 Turns out the Quiraing consists of a long section of sheer east facing cliff with the Table & Prison a diversion in the middle. 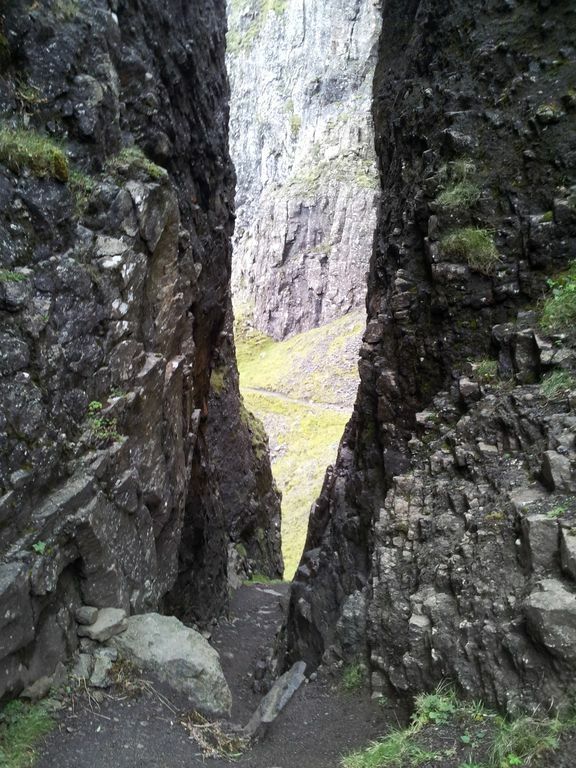 There’s a path along the top of the cliffs looking down and a path along the bottom looking up. 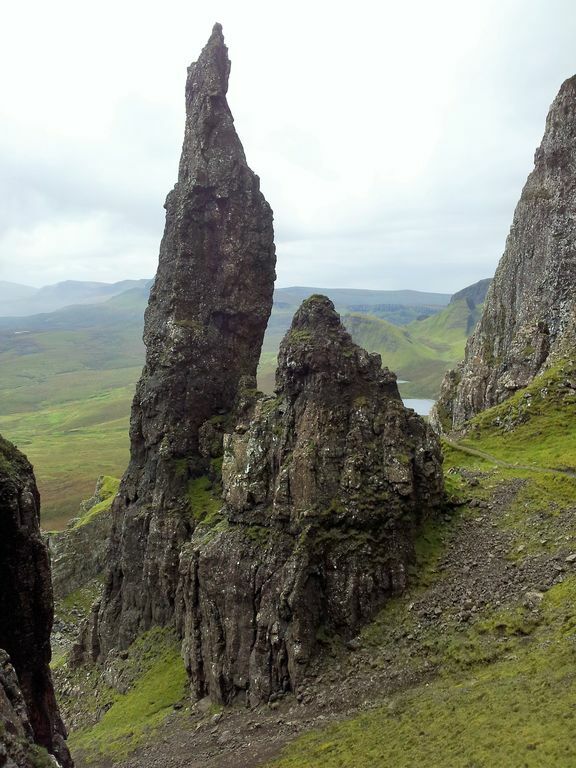 It’s different in some ways to the Storr with a surprising watery rock step along the tourist path. 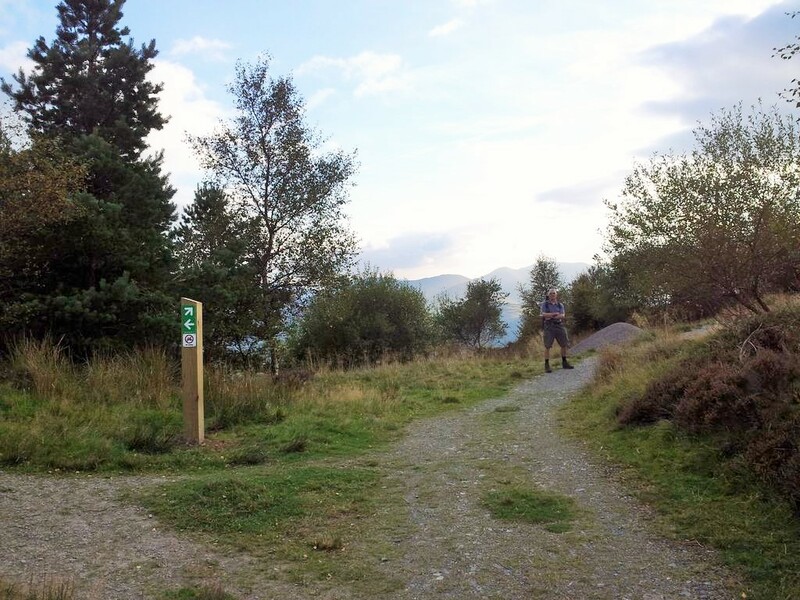 Most people seem to take the lower path as an out & back but we wanted to do the full circuit starting up the higher route along the top then joining the lower path back to the car park. 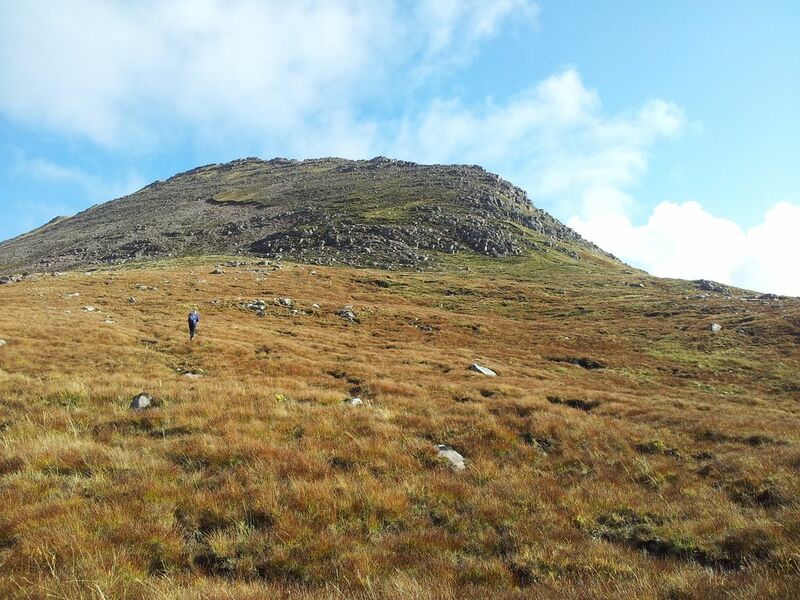 We added in an extension in the middle going further out on the ridge to Sron Vourlinn, (with hindsight we should also have added a small diversion to the highest point, Meall na Suiramach). 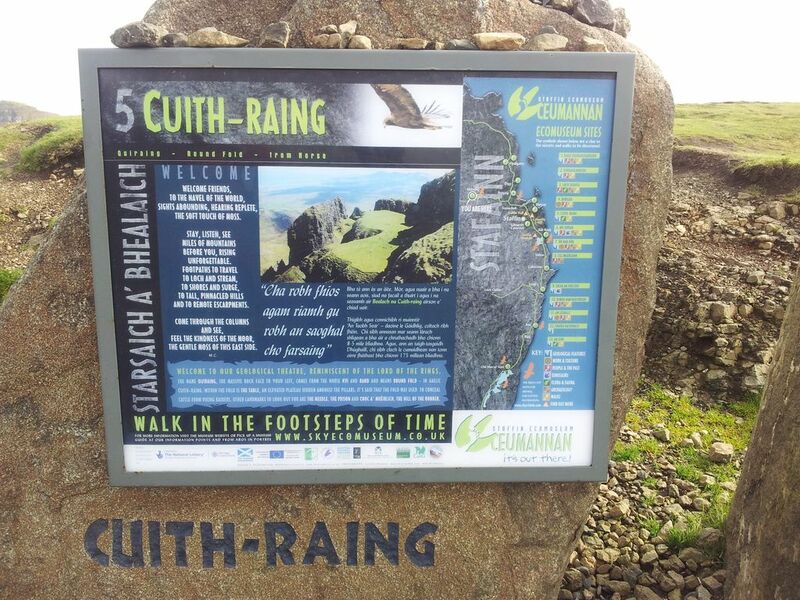 After driving up the A855 we turned off at Brogaig, opposite Staffin Bay, signposted Quiraing & Uig. 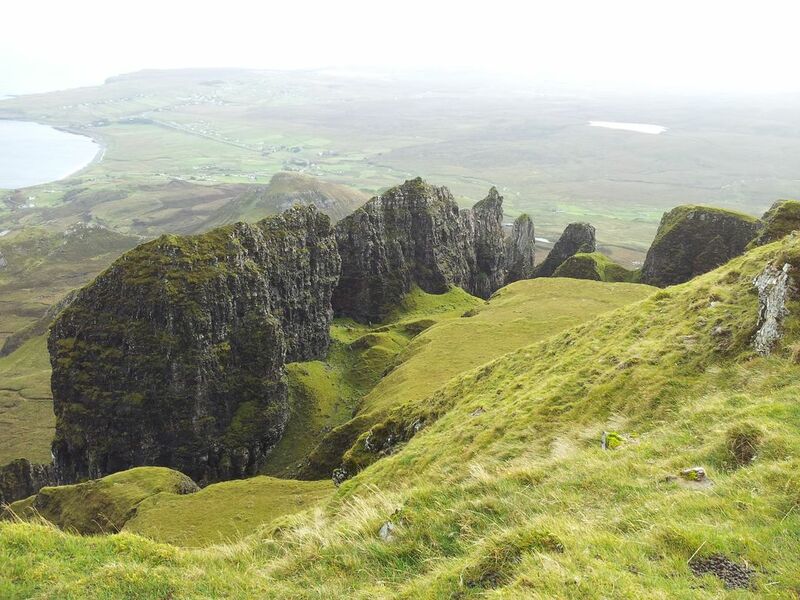 The car park commands one helluva view across the dramatic east edge of the Trotternish Ridge, a unique jumble of fascinatingly eroded landslips. Breathtaking. We started at 12.35, firstly crossing the road to follow the main path north east for a few yards before leaving it for a small grass promontory and more photos. Here’s some trivia, apparently Michelle Pfeiffer was once at this spot filming Stardust. 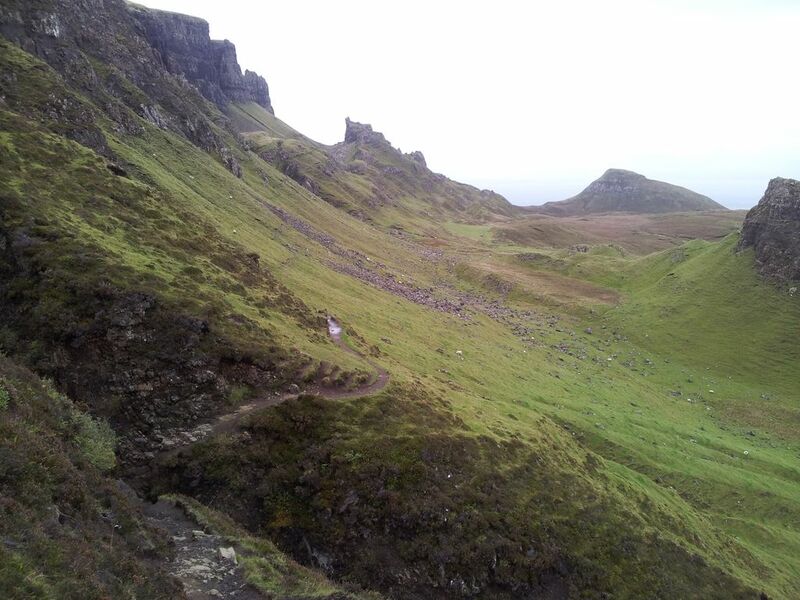 We rejoined the path then almost immediately diverted north along muddy tracks going straight up the hillside for the high route. Views back are pleasing. We somehow managed to lose the upper path going a little too far north then swinging north east to pick it up. It goes through a gate and eventually branches in two with the main path taking a direct line, whilst we chose to carry on following the cliff line path giving more interesting views. The wind prevented me getting too close to the edge, it’s very sheer with dramatic drops so do take care taking the compulsory photos. 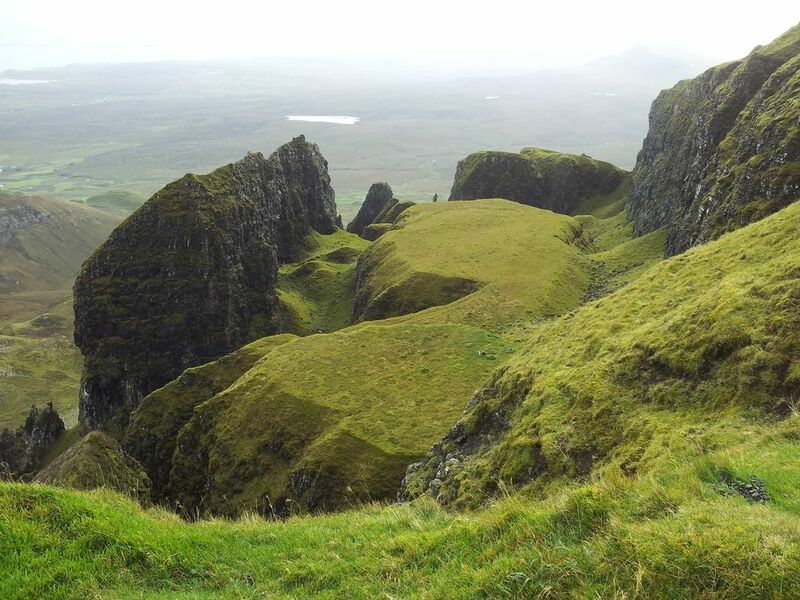 The Table is a section of grass topped volcanic cliff that long ago detached slipping down. Apparently cattle were taken there to be hidden from the Vikings. We saw no cattle and no Vikings in fact no one at all down there. Hoped to be standing on that grassy mound later. Soon the path swings north and we passed up an opportunity to divert inland to the uninviting looking trig point of Meall na Suiramach. 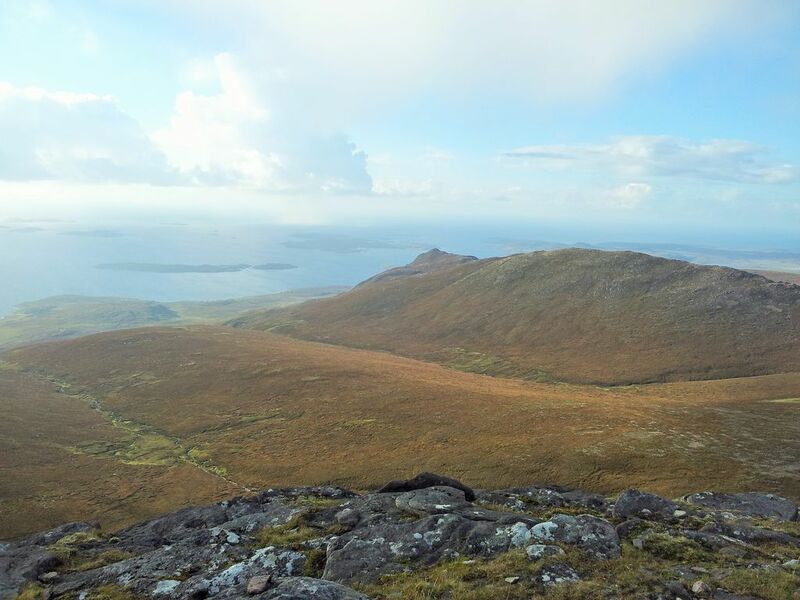 This is in fact the highest point in this area and apparently despite the flattish ground gives views to the north and west of Skye. 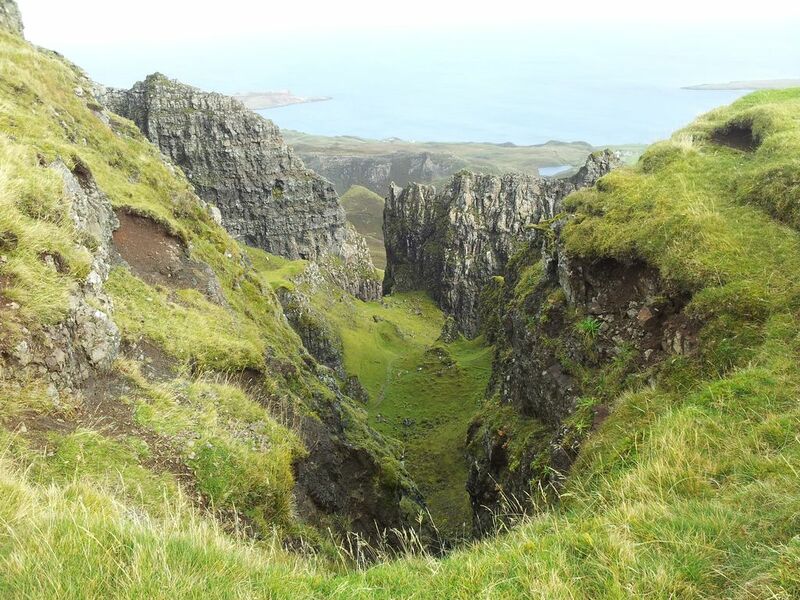 We carried on skirting the cliffs along the path which started gently losing height whilst providing an impressive panorama over the east coast. On a clearer day the north west mainland would look wonderful from up here. The path reaches a gate to meet the low path rising from the south, however we carried on north then north east to follow above rising cliffs towards Sron Vourlinn. It’s then just a matter of broadly following the skyline northwards out to the furthest point of the ridge Sron Vourlinn. 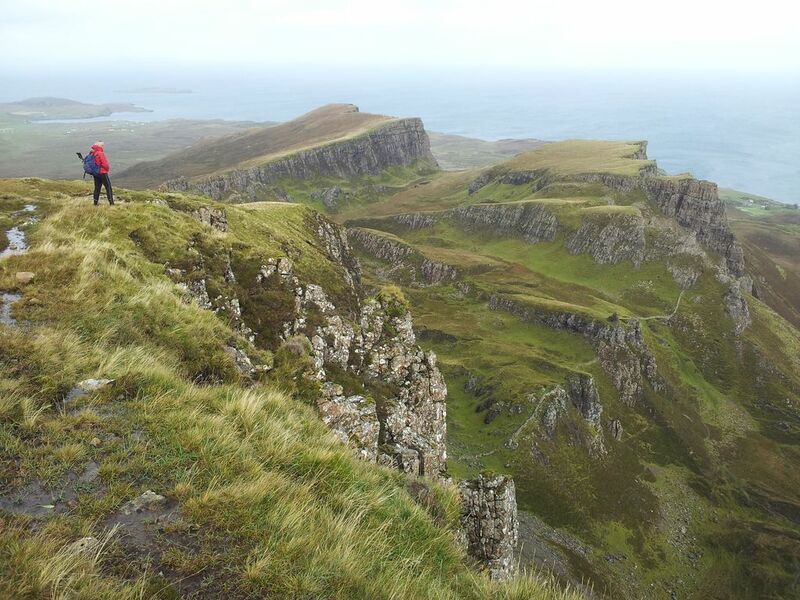 Breezy up here so a little caution on the sheer Trotternish cliffs. 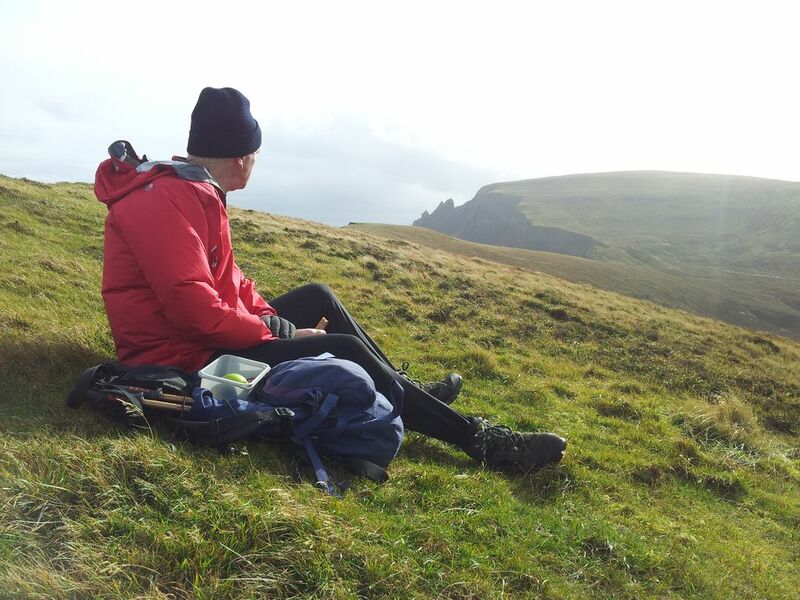 Sron Vourlinn is the most northern point of the Trotternish Ridge (just) and although lower than the main ridge is still a decent quiet spot for a sit down and scan with binocs. Few people seemed to come out here which was nice and it did feel worth the effort. 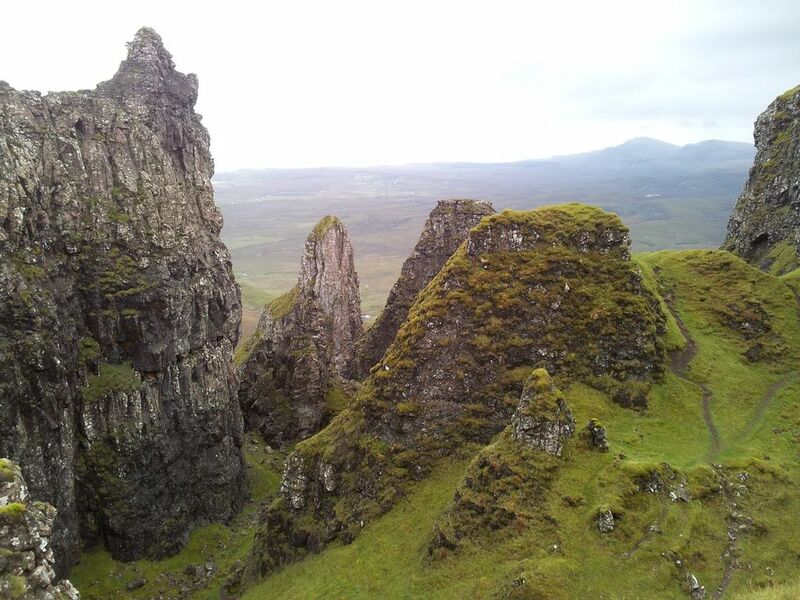 (Rubha Hunish is a recommended short walk & the best place in Skye for whale spotting). Crossing the fence there’s a short eroded muddy descent opening out on to a more level path heading south south east below the cliffs. The interest gradually increases. We had a food break at a sheltered spot then sauntered along the scenic path which soon met another path coming up from north east. The cliffs looked black as the cloud thickened, we had been lucky so far but our weather window looked to be disappearing. 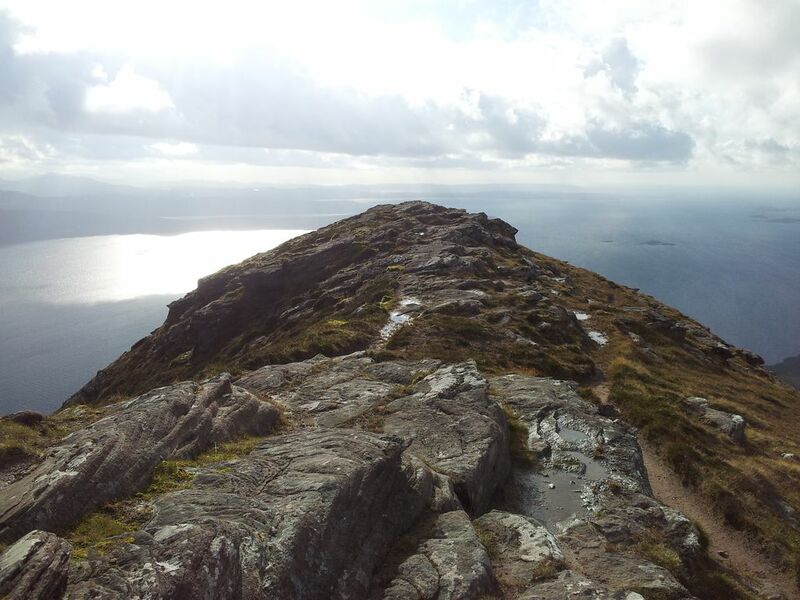 Eventually the path swung south west and the features spotted earlier all suddenly came into view. 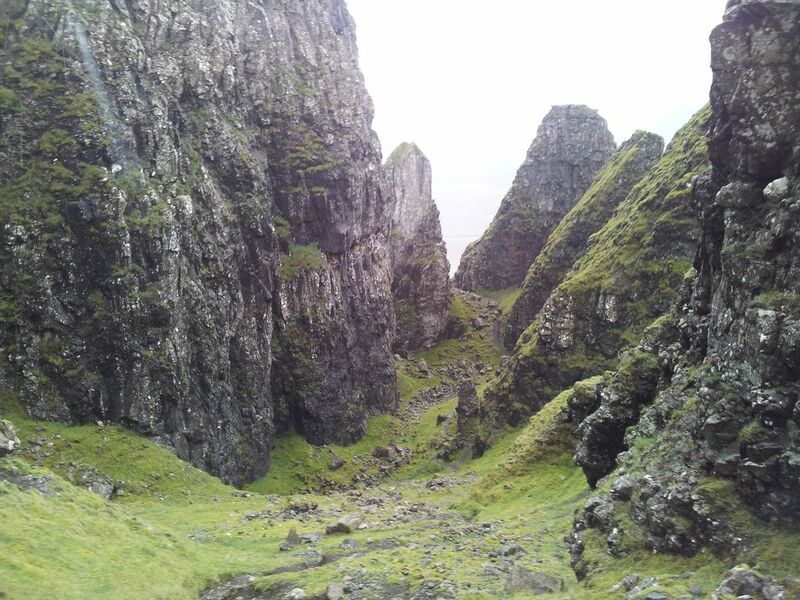 Towering cliffs and eroded columns to the right, it’s definitely a stiff neck time. A cairn marks an obvious spot to ascend for a look around the pinnacles and Table. Looks easy in the photo below doesn’t it, but the ground was still damp and the path an eroded earthy fine gravel which moved in places, the surrounding grass was little better. 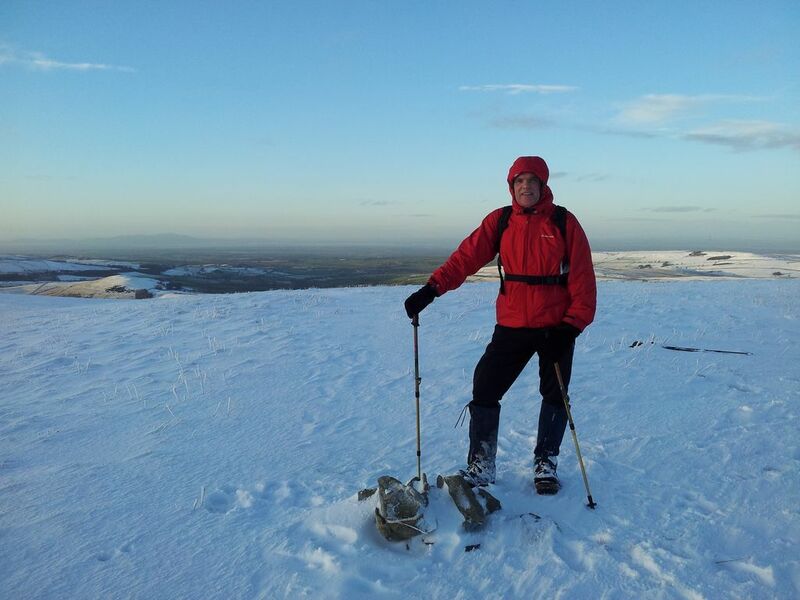 Alan went up first but found his boots increasingly sliding so decided to come back down knowing the steeper ascent ahead had to be retraced. 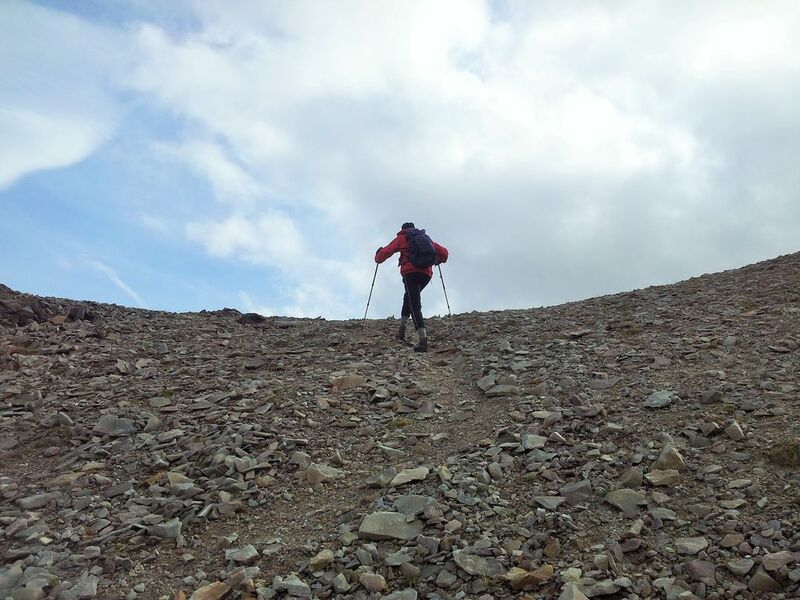 My boots were only just satisfactory so I continued on up, relying on my poles for added support. It was a slow slippy ascent and steeper than it looked from below. I had no clue what was ahead and there was little evidence of reassuring fresh boot prints. Contouring around the Needle I spotted a rock cleft so clambered carefully through. Again the ground was steeply crumbly and certainly no one had been through there today. One of those moments when you hope to find a better way down. 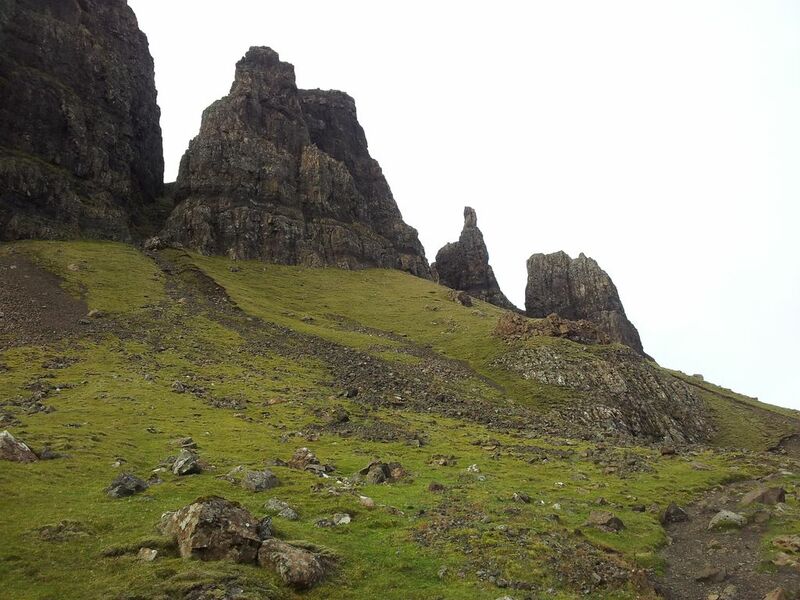 Anyway once up I’d now breached the cliff barrier guarding a maze of rocks, pinnacles, columns, grass and paths. Still no clear view of where to go next so followed the path below snaking up to the skyline. Once at the skyline I realised this was one amazing maze, not as straightforward or flat as it had looked from above. Wish I had more time, but this was just a quick exploration. The Table loomed behind looking unreachable so I skirted around northwards thinking I’ll just nip up then quickly head down. This would have been a lot easier had I gone south. Totally alone up here except for a few surprised sheep, not the best of times for the sky to darken and suddenly start to rain. The prevailing weather was blowing in quickly from behind the cliffs so it was impossible to tell what was next. I couldn’t find an easy way up to the Table so grabbed a last photo before turning round. 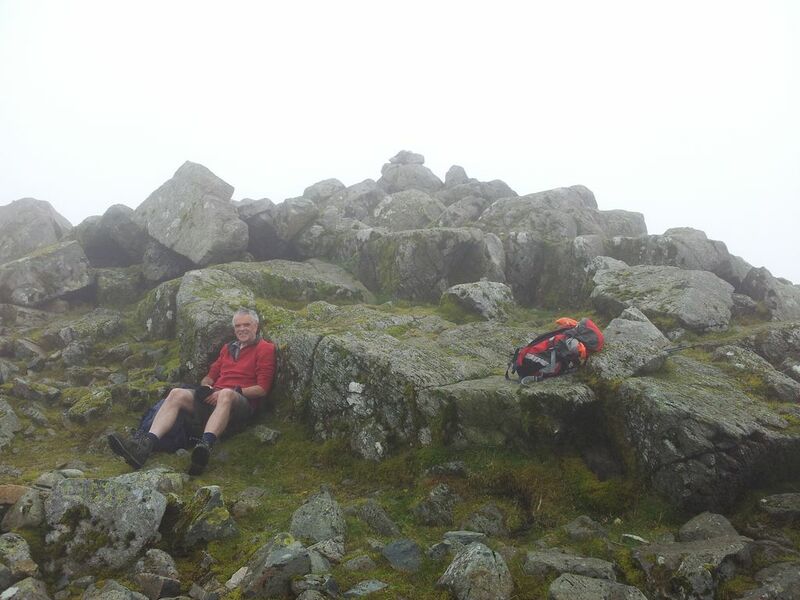 My concern was the slippy descent slopes getting worse in the rain, so dashed back to the rocky cleft which turned out ok in a hurried descent. Returning to the base of the outer cliffs the rain suddenly stopped and the sun came out. I went further right to try a slightly better line of descent carefully down the slippery steep knee aching slopes. The diversion had taken nearly 50 minutes, it would need longer to explore properly. Back by the Prison I collected an Alan and set off south east on the lower path, soon coming to a cairn taking the lower left path heading in a straight line for the now visible car park. Back up to the Needle and a possible route to try next time through the gap top left? Some parts of the path had irritatingly been badly churned up by nearby cattle. Then we came to a surprising rocky step across a small gully with water streaming over the hand holds. We were quickly over and it’s probably easier after less rain but a surprise on a ‘tourist’ path. Back to the car at 5.25pm after a 4hrs 50 min walk, this could certainly be done much quicker but there’s plenty of places to linger so why rush. 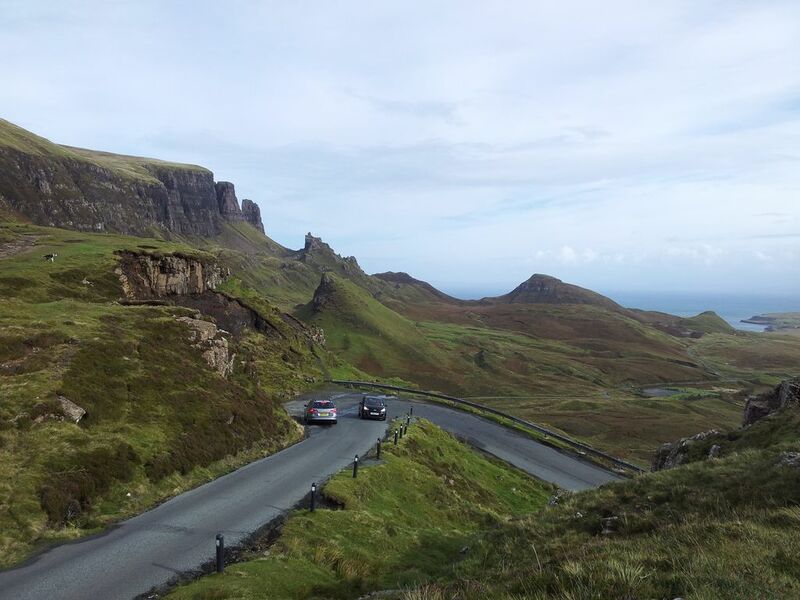 Rather than drive back the same way we went south west across to Uig and the faster A87 route back to Portree. 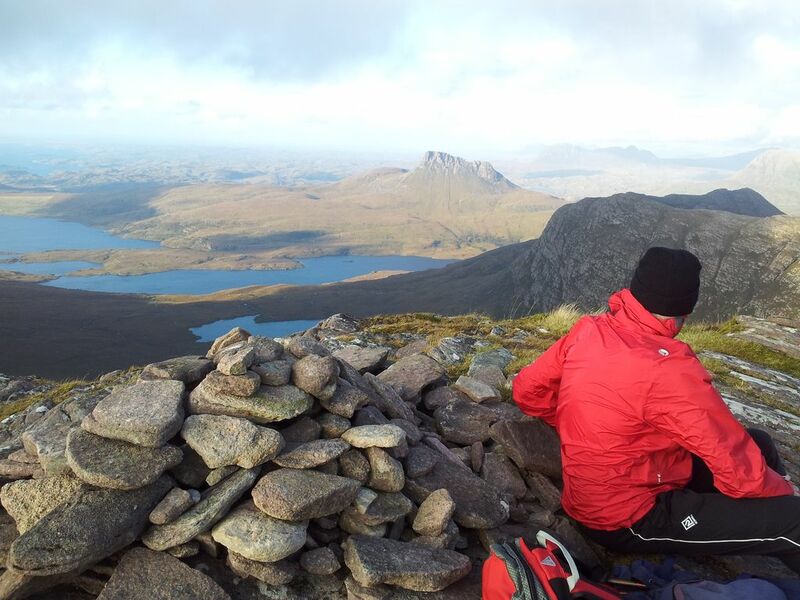 Luckily still enough time for a pint at the iconic Sligachan. 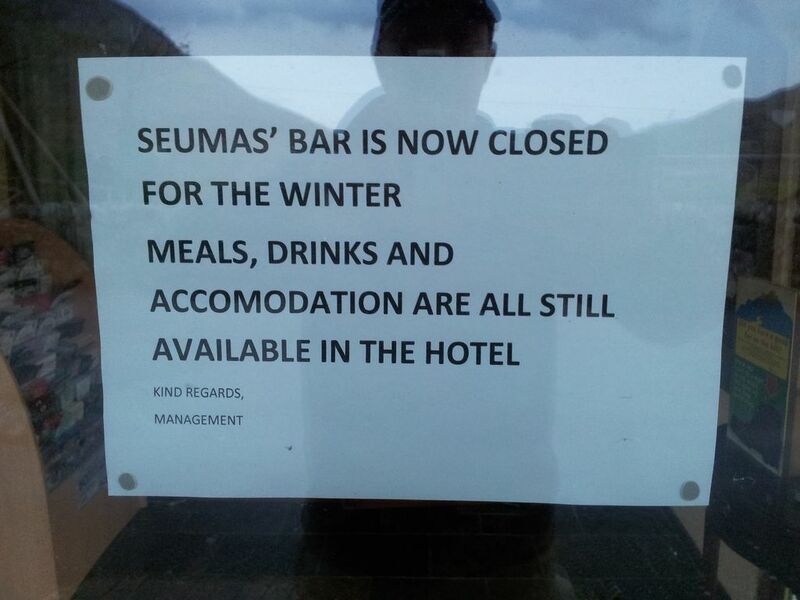 Often a disappointing bar but this time I was determined to enjoy their hearty highland hospitality…. Ok plan B, walk around to the more staid MacKenzies residents bar, staffed by two friendly ladies and with real fire and comfy old worn settees. 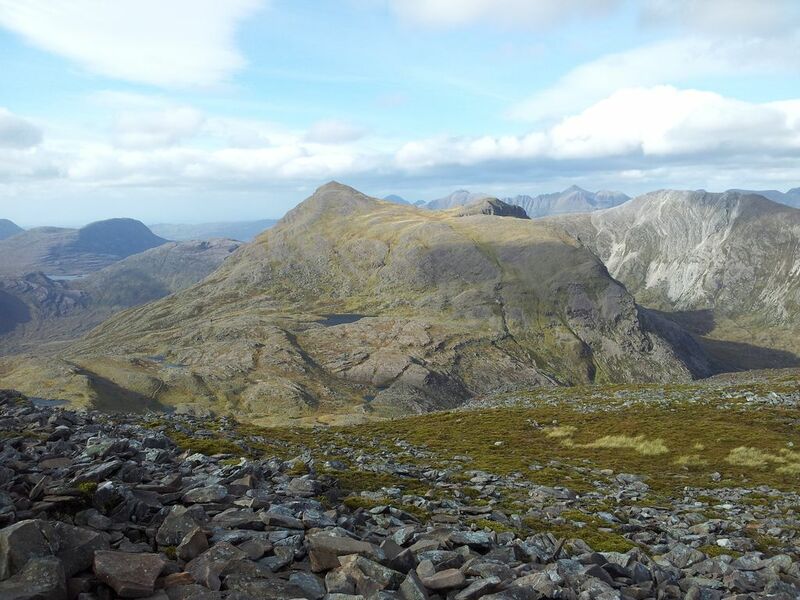 The history of this bar though is worth the visit including Collies lounge where the early Cuillin climbers such as Norman Collie, John MacKenzie & Charles Parkinson would assemble. 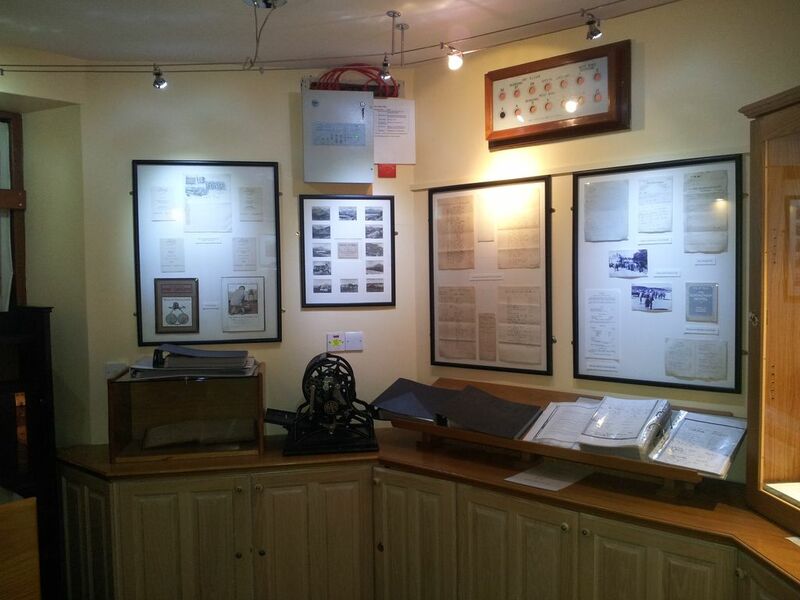 Even more interesting is their mini museum of local climbing memorabilia charting the history of the hotel, a very pleasant surprise and worth a look. 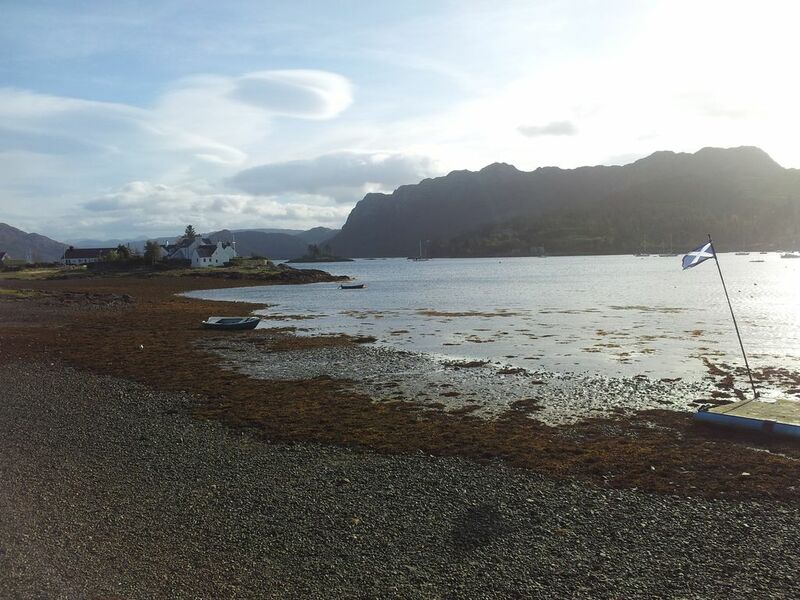 Food was once again at the highly recommended Plockton Shores Bistro, followed by beer at the Plockton Hotel. Tried a sampling of 3 x 3rd pints, sadly none of which hit the spot. 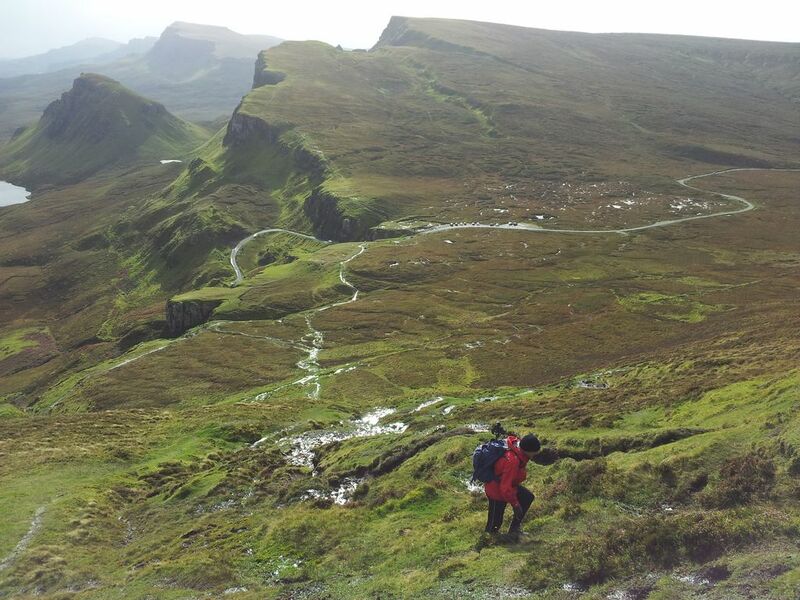 The Quiraing is a harder route in my opinion with paths traversing steeper grassy slopes & a rock gully step across a burn which would stop some families especially in spate or iced. There seems to be a lower car park which would involve more ascent but misses out the bad step. Trying to get up to the hidden pinnacled area is harder than it looks and has to be reversed, so most people stay on the lower path. For a hiker it’s an excellent circular walk using both paths which can be done either way, with an option to Sron Vourllin. 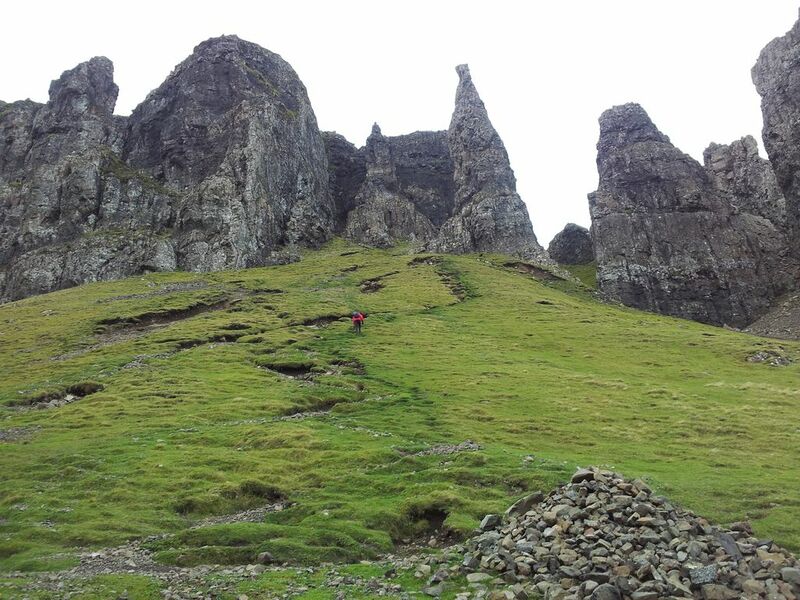 The walk to the Sanctuary on the Storr is a higher ascent than the low path on the Quiraing, but a very straightforward one and provides both easier and more choices to explore its more spacious pinnacled areas. 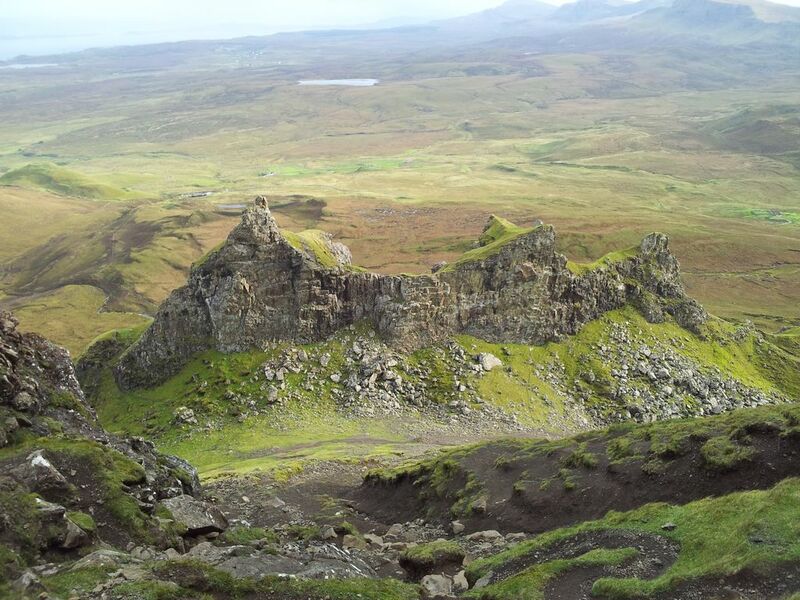 Care still has to be taken in parts but if I was in a family group I’d choose the Storr. Note my description here is only to the area around the Old Man. 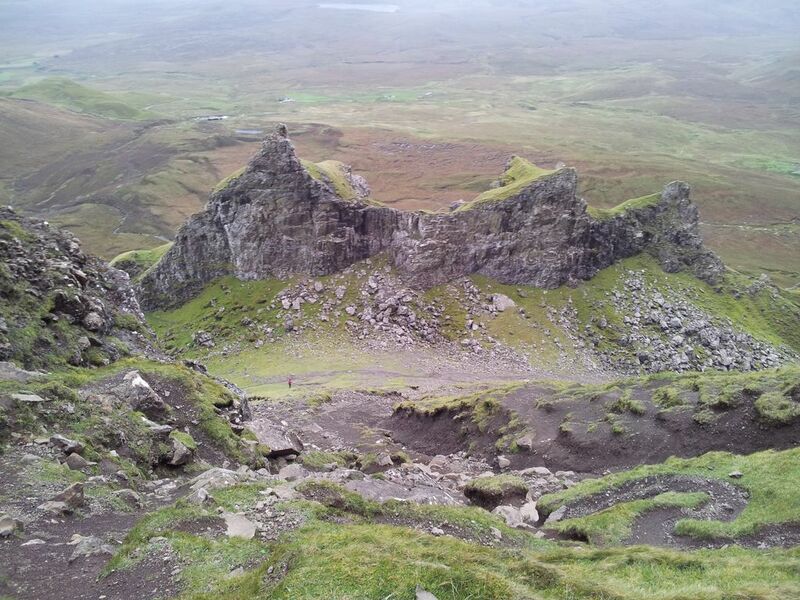 The longer walk up and around the cliffs to the Storr summit is a different matter and is more suited to hikers. 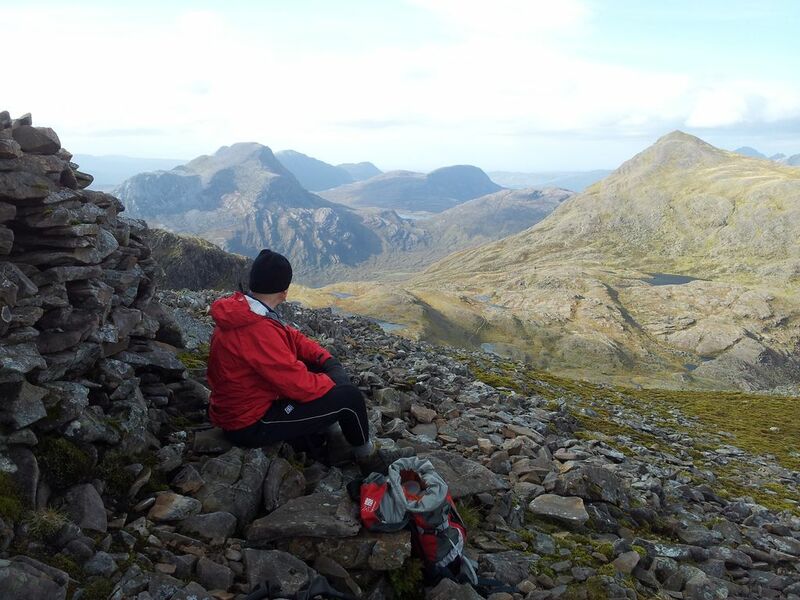 We did it on a greyed out cloudy day with no sight of the Cuillin or mainland, it was ok but you need the views as a reward. Both need boots if you want dry feet and outdoor clothing including a waterproof. 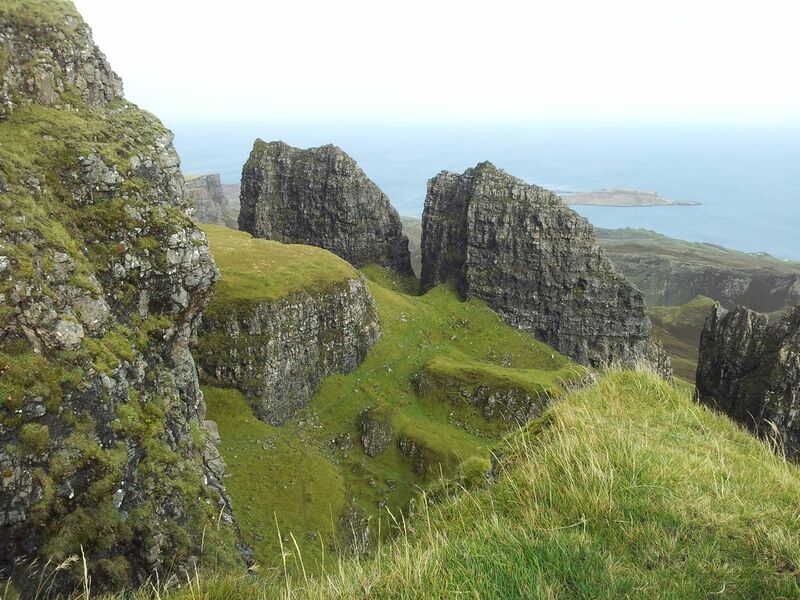 Weather can change rapidly in Skye and you may not see it coming from behind the high cliffs. Both best done on a fine day with clear distant views which will give an excellent experience. Only downside there’ll be loads of people doing the same so maybe choose early morning/ late afternoon/evening and it’ll be quieter with more magical light. 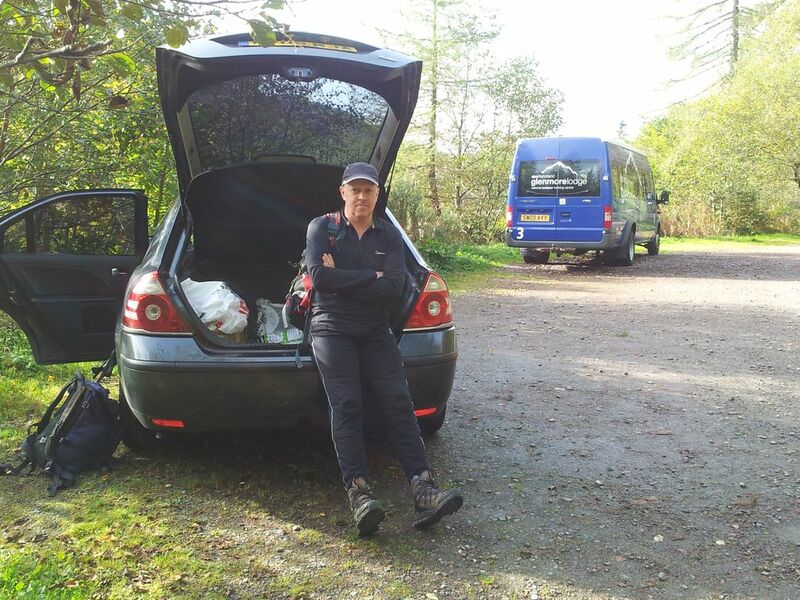 Day one of a week’s walking holiday in the wonderful north west highlands. After a long period of settled weather Autumn had finally arrived, and with it the gales. The Met Office suggested Skye would be cloudier and windier than the mainland, which at least narrowed our options a bit. 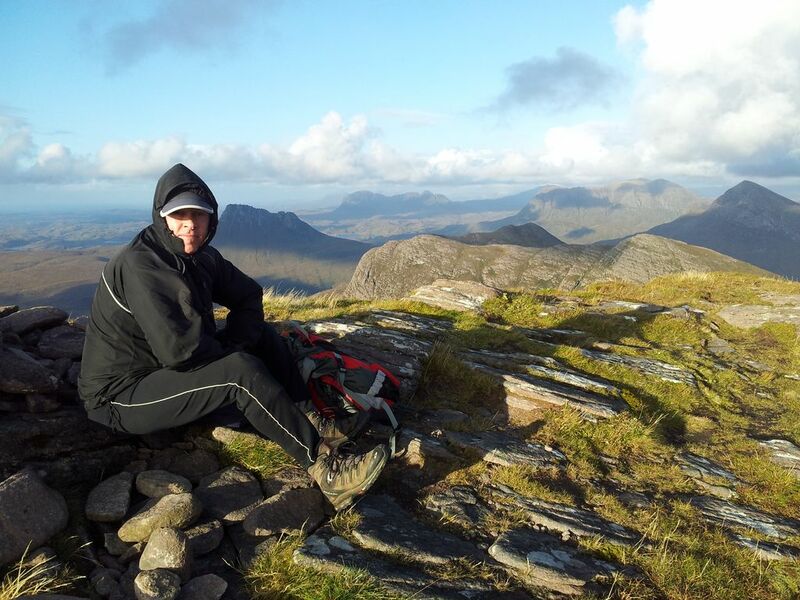 We would head inland where the forecast was clear and dry but with 65 mph gusts on the high mountains. Despite this we were determined to get out somewhere after driving up to Plockton the previous evening, (we just weren’t sure where yet). One thing was sure, to be wary of narrow ridges and any hint of exposure as those gust could have me over – just like last year on Cul Beag. We headed east to suss out the conditions with a few ideas in mind. For a few minutes Ben Damph was top target, till we glimpsed the distant fin shape and agreed this wouldn’t be advisable in those winds. 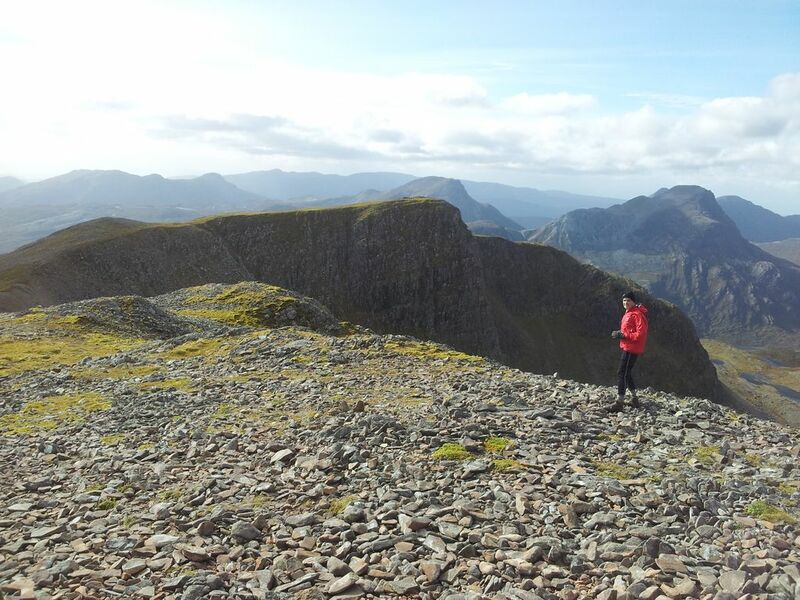 From our experience last year on Cul Beag we needed a safe top with great views, no exposed ridges and a northern ascent shielded from the fierce south west gusts. Alan was scanning the mountain books as I drove scanning the road, then as the view below appeared Alan had a light bulb moment. 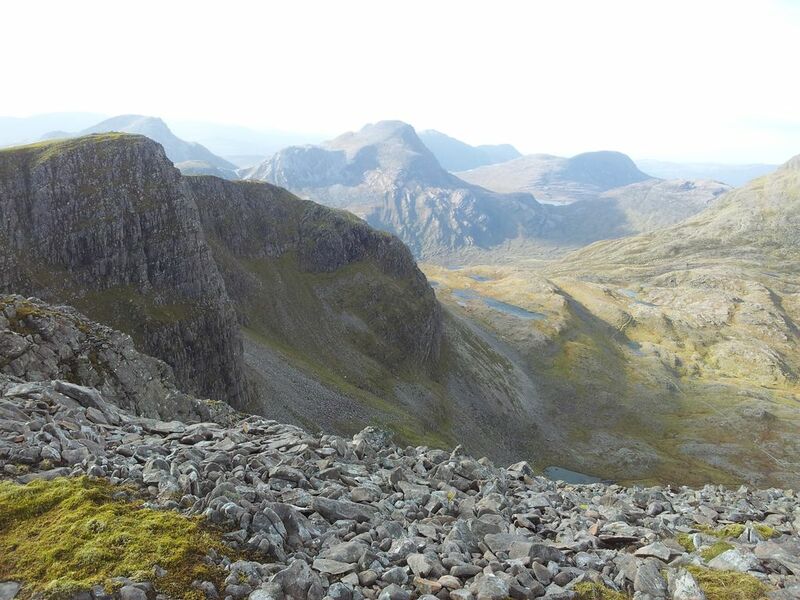 Whilst it was too late and too windy for the lengthy Corrie Lair circuit, the impressive looking Corbett of Fuar Tholl had everything we were looking for. 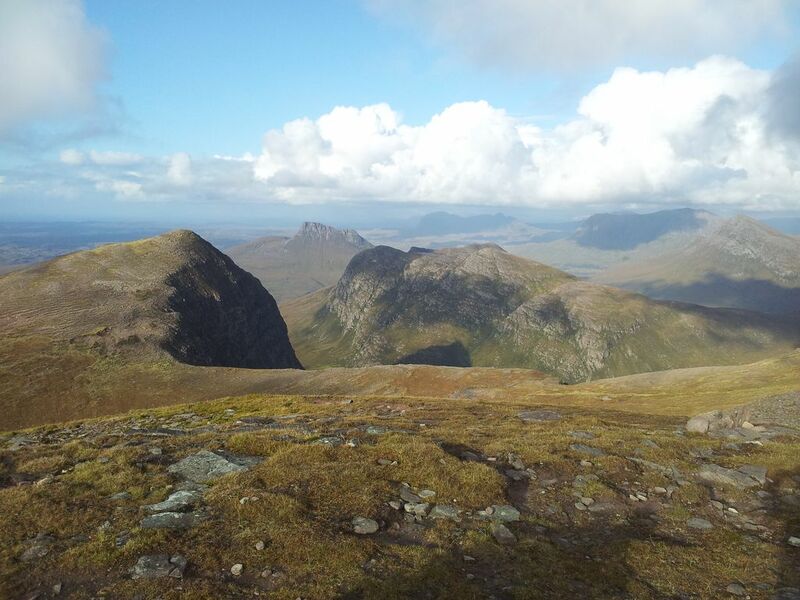 Fuar Tholl dominates the southern approaches yet is something off an offshoot to the two neighbouring Munros, Beinn Liath Mhor & Sgorr Ruadh. 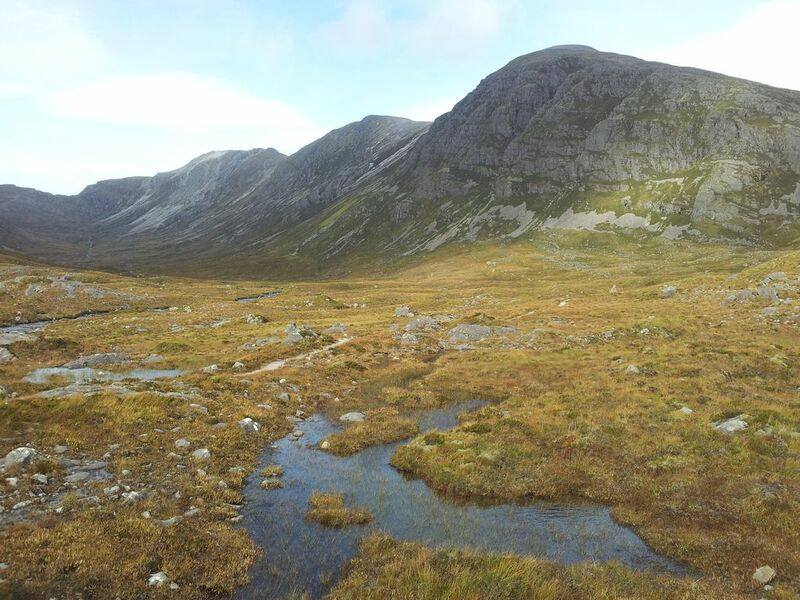 Being the 13th highest Corbett it fails to reach Munro status by just 7 metres and is consequently less popular, however some describe this as the best mountain in Glen Carron and well worth a visit. This would be a rare out & back in preference to the two alternatives. 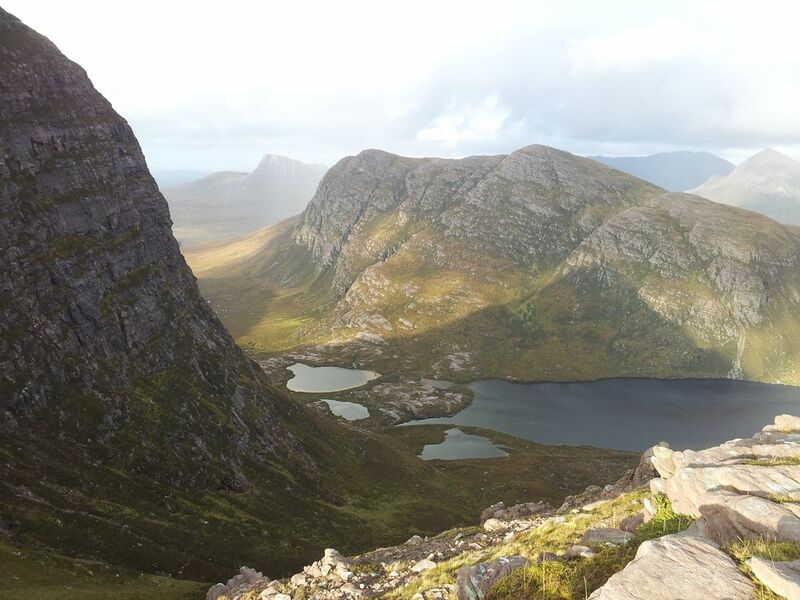 The guides mention a possible direct descent to Achnashellach via the east ridge however the understated term used in ‘Ralph Storers 100 Best Routes’ was enough to put us off. 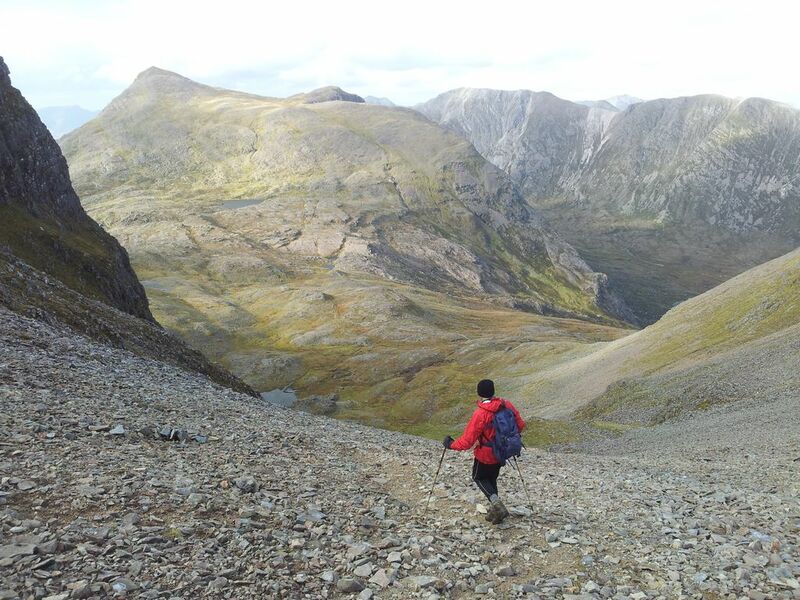 If Storer describes a route as, “it’s as rough as it gets”, then it will be bloody rough. 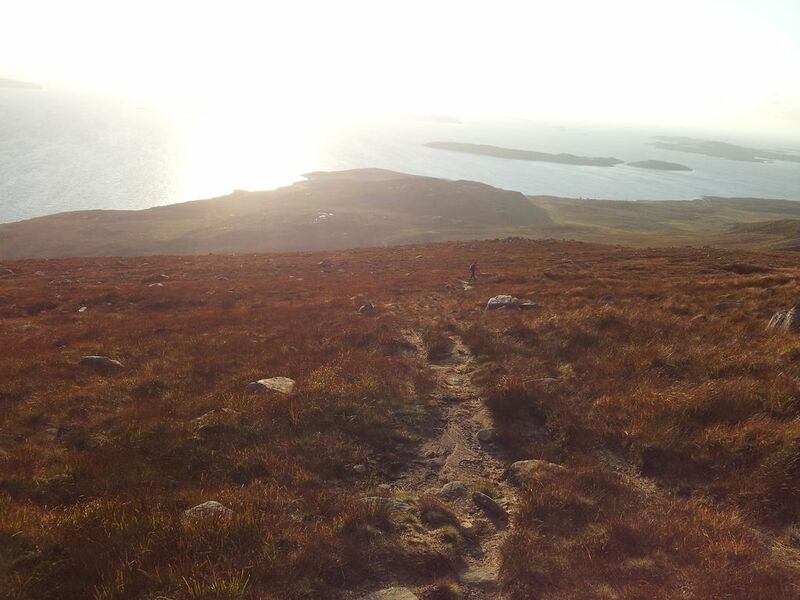 Alternative no 2 is a south west pathless descent to Balnacra/Coulags which leaves you some distance from the car. 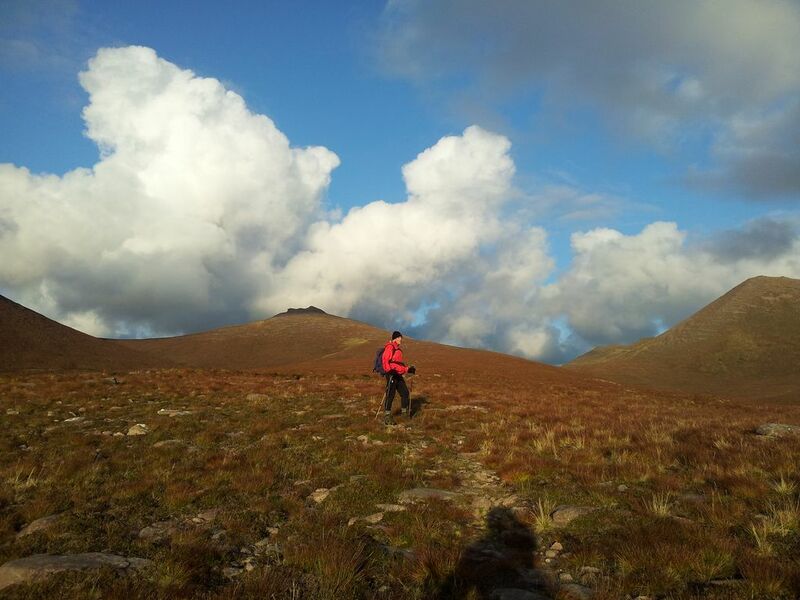 With hindsight we never once regretted our route choice & it utilises a bloody good path. We’d had no time for unpacking or packing the night before so a late start, even forgot my favourite ancient blue Patagonia capilene top. On the drive here there’d been no sign of cars parked in any of the usual Munro spots which reinforced the apprehension of the conditions ahead. Slightly reassuring then to see a Glenmore Lodge van. 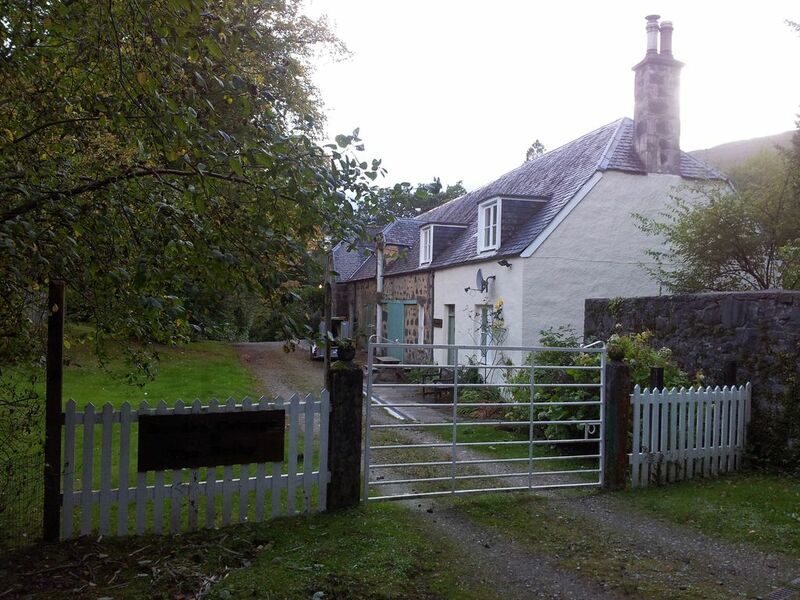 Leaving the car we crossed the A890 and followed the side road passing old stone farm buildings and the Garden Cottage before reaching the railway station. We walked through the gated crossing following a dark track for 100 yards which then opened up to a crossroads with the obvious route being straight ahead. This would be the wrong route however, as the correct one is sharp left, had to check the map to confirm this. Just as you pick up speed an impromptu sign is reached indicating it’s sharp left to the Coire Lair. Useful addition this as it’s easy to miss this turn whilst gazing at the scenery ahead. This takes you down a track through a deer fence gate. After passing through trees close to the river a stalkers path opens up starting to zig zag uphill. Found this an excellent walking surface, good gradient and well managed. More reasons to use this same route in descent. The surrounding ground does look rough, there was certainly no temptation to leave this path at any point. 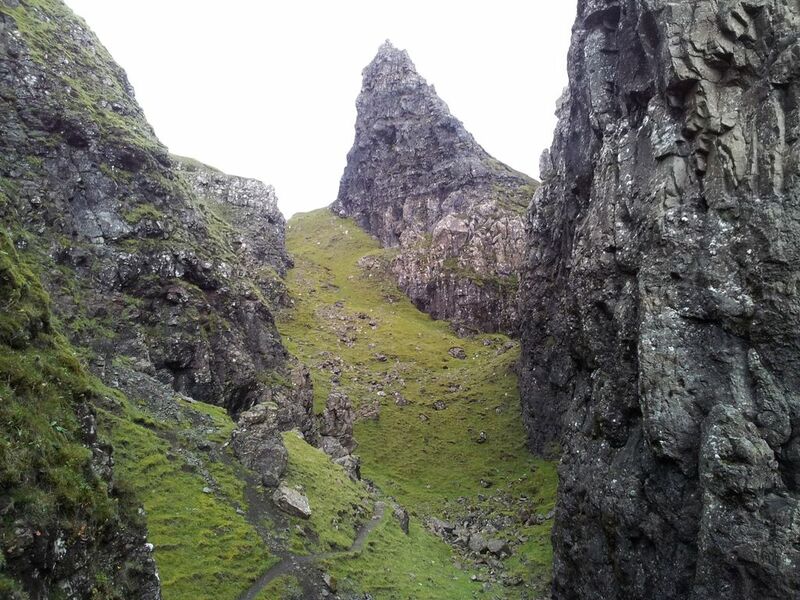 After nearly an hour from the car the path levels off and the views really open up to the Corrie Lair. Which is nice. 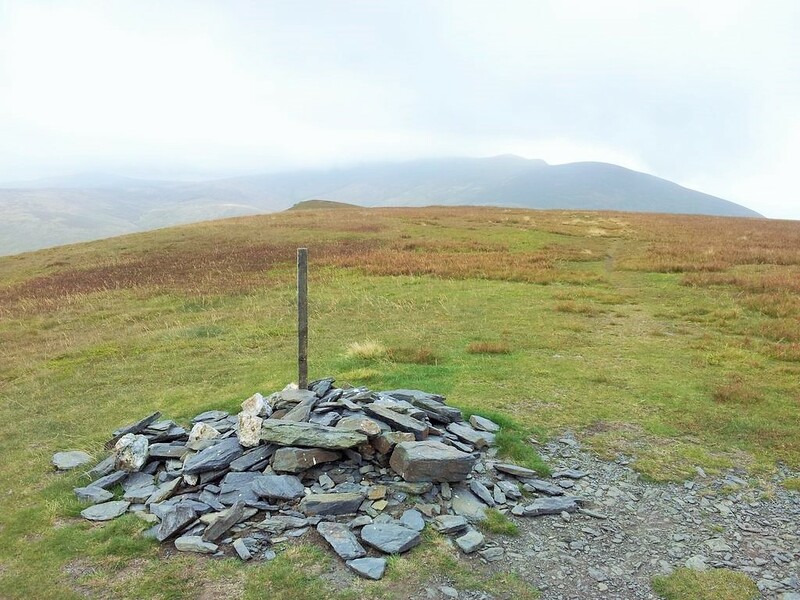 The path soon splits in 3 marked by a small cairn. 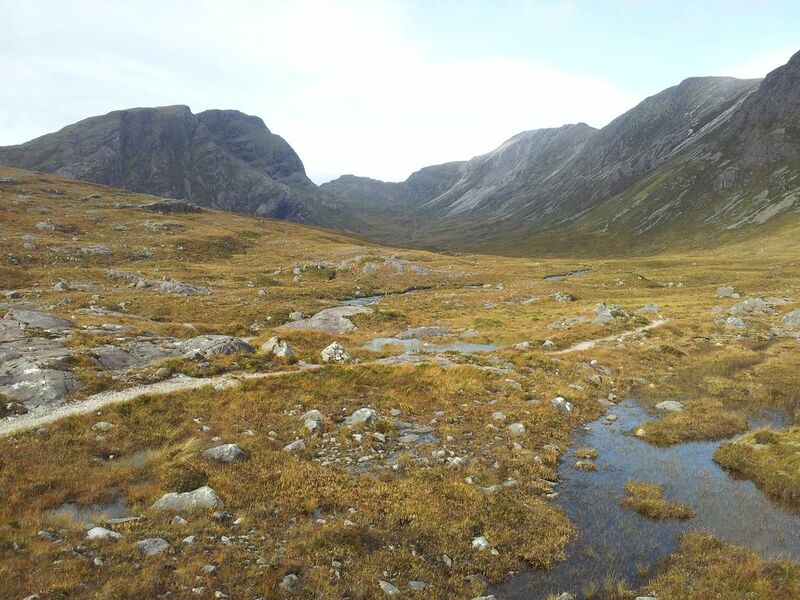 One continues to follow the river up the valley, a second heads up the right shoulder in the picture above along the skyline of Beinn Liath Mhor for the full circuit. Meanwhile our route heads north west down to the river to access the Corbett from the north. 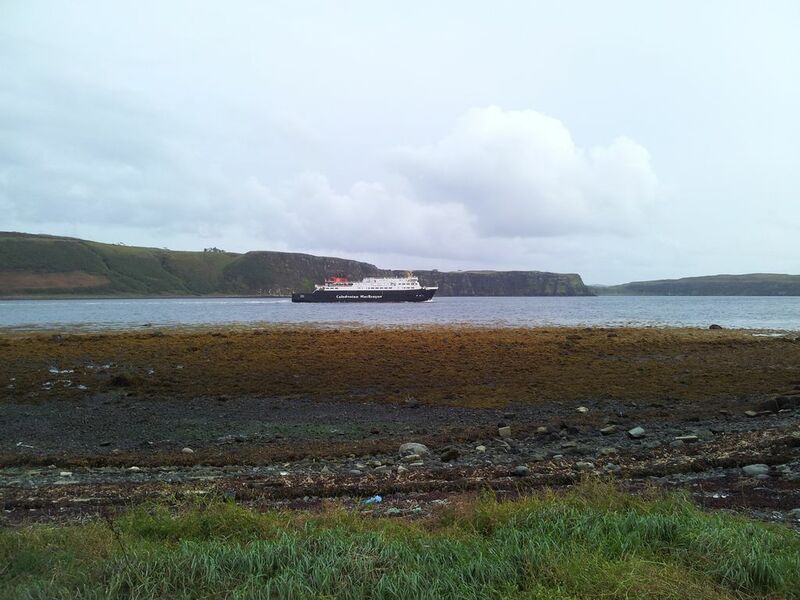 Fuar Tholl was now showing off its brooding side. Had almost forgotten one warning for this route that the River Lair may be difficult in spate. This began to look more of a problem than we imagined. The path goes to an obvious looking crossing point with one or two markings nearby suggesting alternatives. None of these looked inviting so we traipsed downstream to see an island but couldn’t be sure what was on the other side. Every hopeful spot had a high slip/fall factor due to the speed of the water. We traipsed upstream and found a flatter area, then looked downstream then upstream again. Each time we considered a crossing the sky darkened so we couldn’t see the river bottom, then a noisy gust of wind would blow reminding us that this whole trip might be in vain if we can’t get up top. 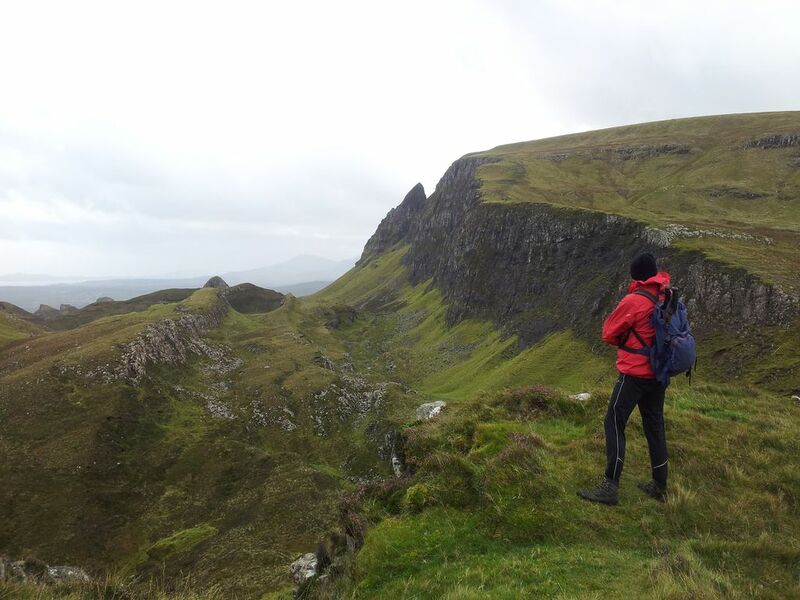 The options were to turn back, a huge diversion upstream around the loch, or soaked boots. The boots would take ages to dry and this was just the start of the walk on day one. So option 4, boots off and wade it. Many years of hillwalking yet first time we’d done this, obviously we’ve had it too easy:-) Bit cold, bit slippy and poles are essential. Had wasted a bit of time here faffing about here then drying feet. Still it meant we had got across and boots were still dry, and of course we won’t have to do that again. Oh hold on we’re coming back this way, bugger. 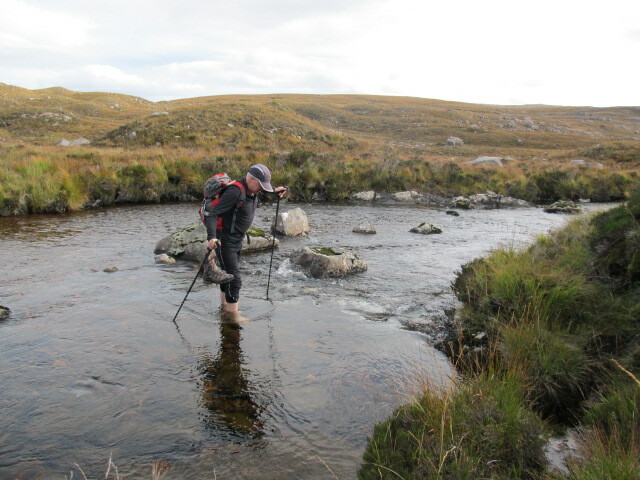 As we’d crossed a little upstream we had to relocate the path before following it on more zig zags rising up towards the bealach between Sgor Ruadh and Fhur Tholl. 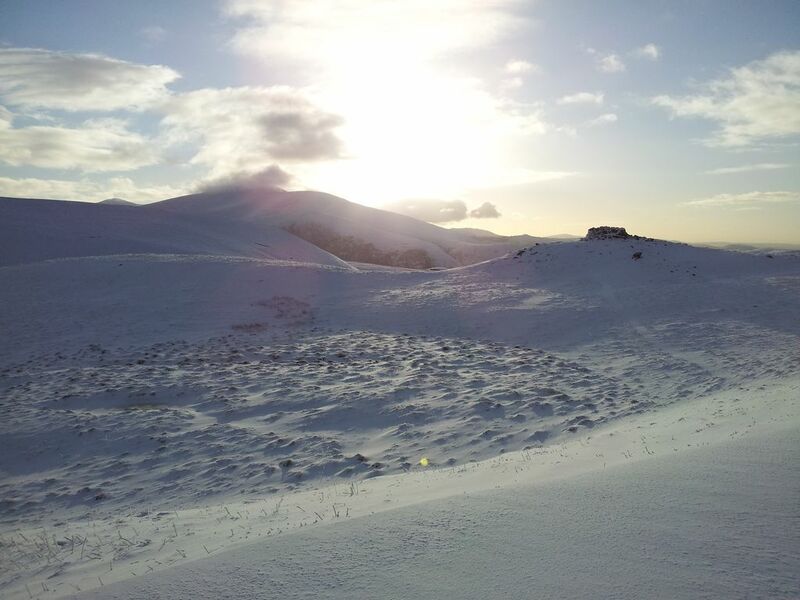 Scenery changed as we got higher round the back of Fuar Tholl, now we could see why it’s called Cold Hollow. 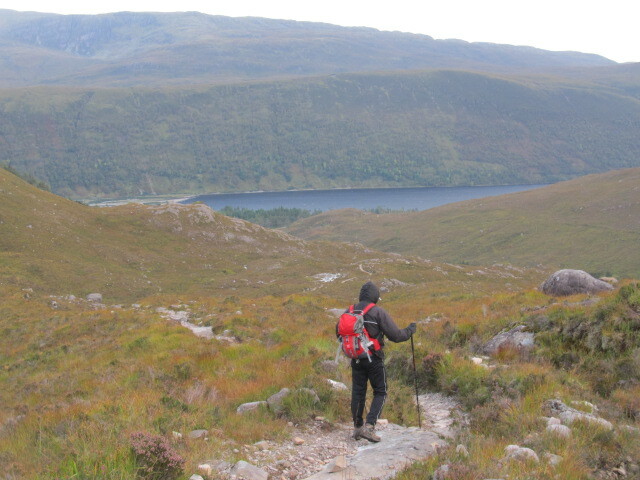 Rather than carry on up and round the Creag Mainnrichean we had decided to choose the direct route up from here to maximise shelter from the gales. Dominated by the Mainreachan Buttress this is certainly an impressive sight. Our route went up below the left side of the buttress trying to pick the best ground, grass at first eventually joining the scree to the skyline with the summit out of sight left. Was easier than it looked with the occasional old footprint but nothing recent, we were certainly the only one’s up that route for the past few days. 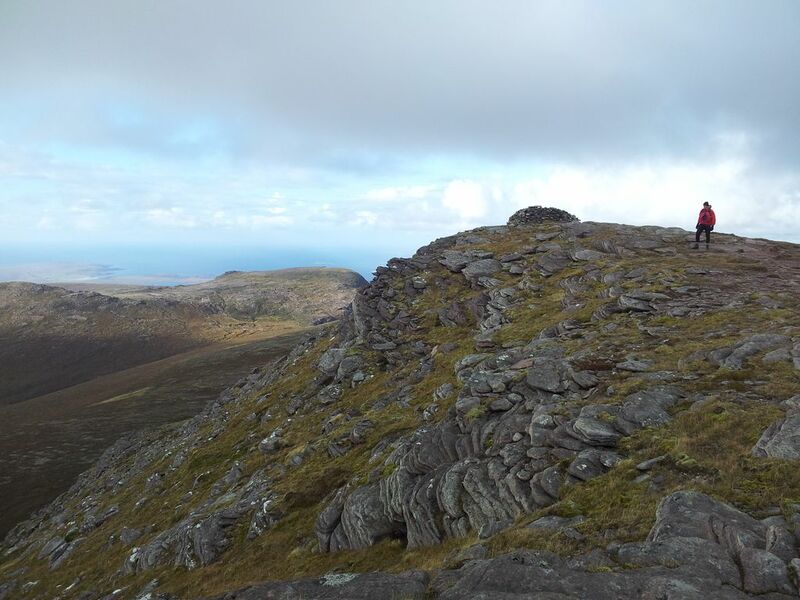 The best thing about a steep ascent to a summit is that you know everything is going to look very different, very soon, assuming you can still stand. 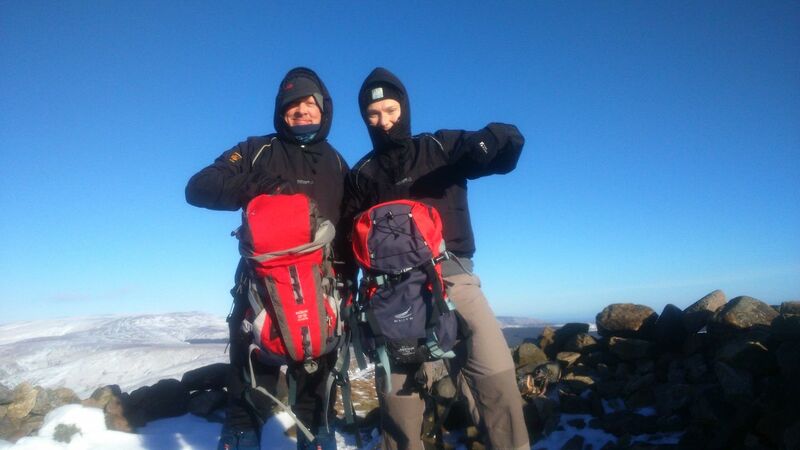 40 mins of ascent later we stopped below the skyline and layered up for the summit. First impression;- it was windy, funnelled but not unbearable. Just a few minutes away the summit was visible with a shelter, so we quickly scurried up. And then the views came. 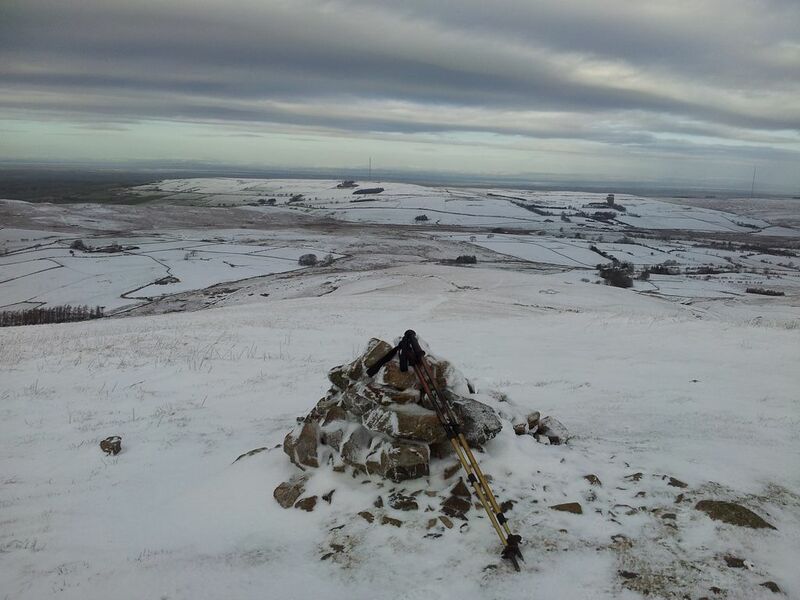 After much weather apprehension on a day when few seemed to be out on the hills, our plan had worked. We had made it without incident to the top, for once I wasn’t blown over and the views were magnificent. 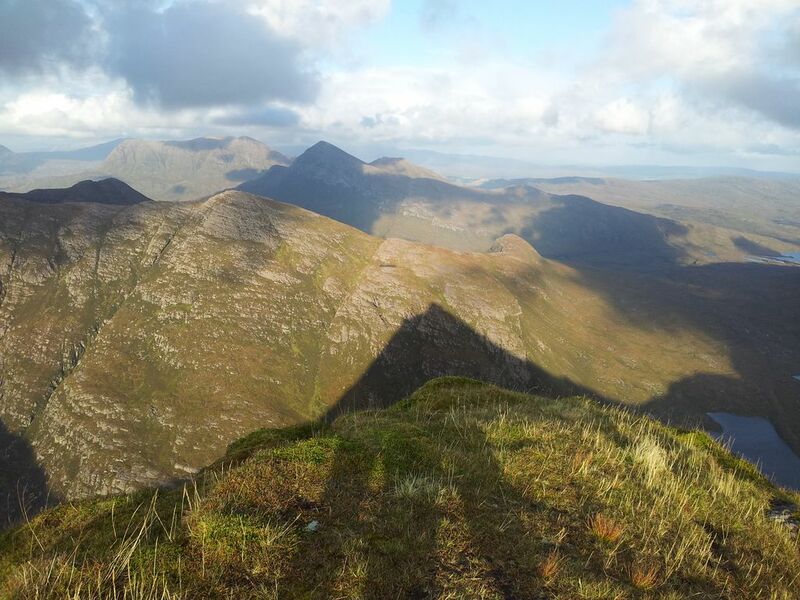 It was spot the distant peak time, Torridon, Slioch, An Teallach, to name but a few. Happy time up here. 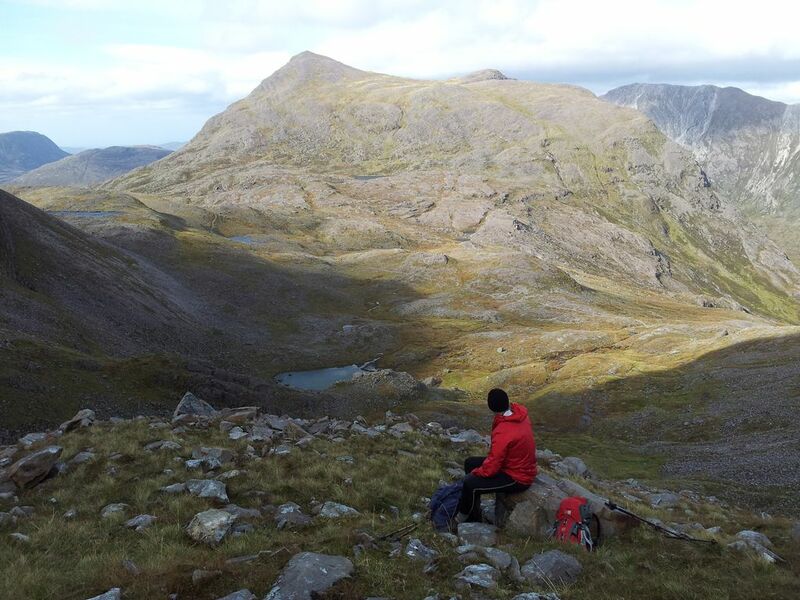 Had a wander around taking advantage of some surprisingly sheltered areas on the summit. Felt lucky to be enjoying all this on day one, we werent really expecting it:-) All good things though, gales were forecasted to increase through the day so after nan inspiring 50 mins we started to head down. 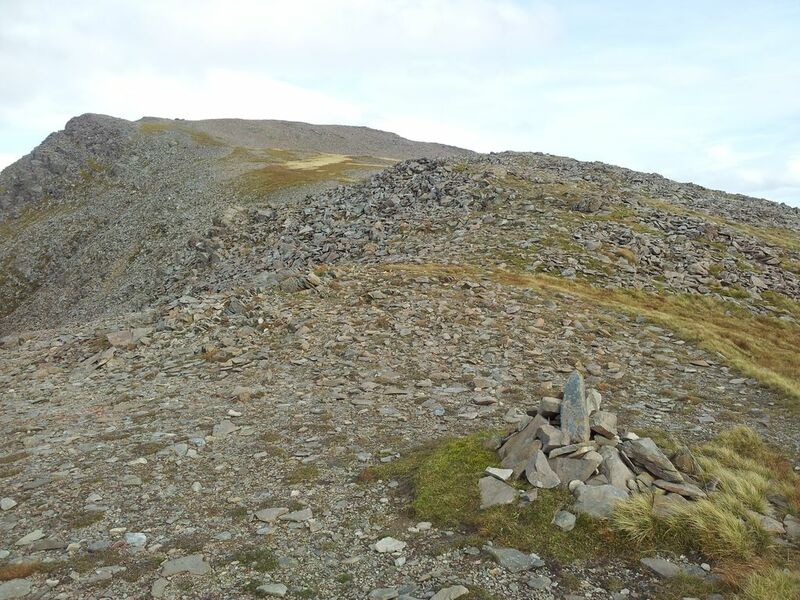 Now we were walking straight into the prevailing wind which steadily increased nearing the cairn marking our scree descent to the belach. Buffeting started, much as we wanted to walk out to the top of the buttress the sensible decision had to be to get off that ridge. After only a few feet of descent conditions eased, which made us want to go back up again, sensibly we did not. We were down to the main path in 30 mins and managed to find a faint track this time. This had been harder to see on the ascent, poles came in handy again here. Now for the the same route back, remembering to find the same river crossing point, it seemed colder this time. 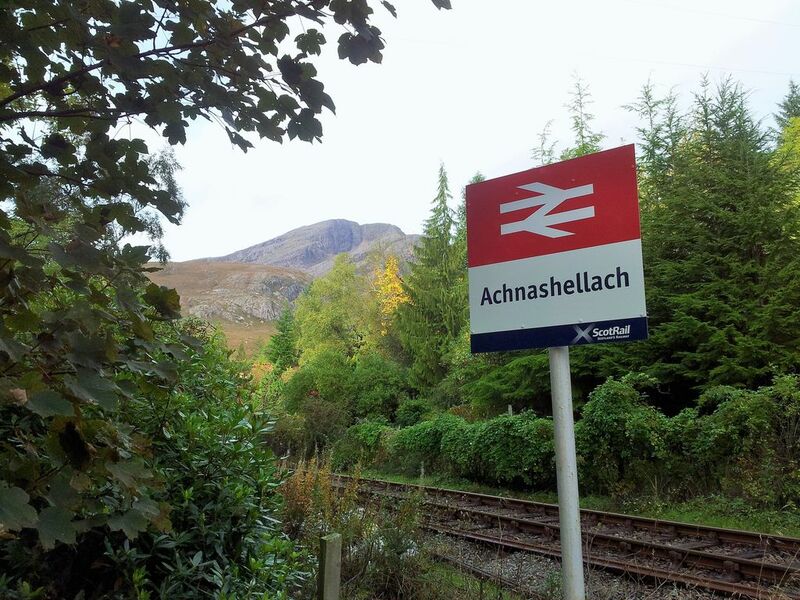 Then swiftly back down the great stalkers path to Achnashellach. 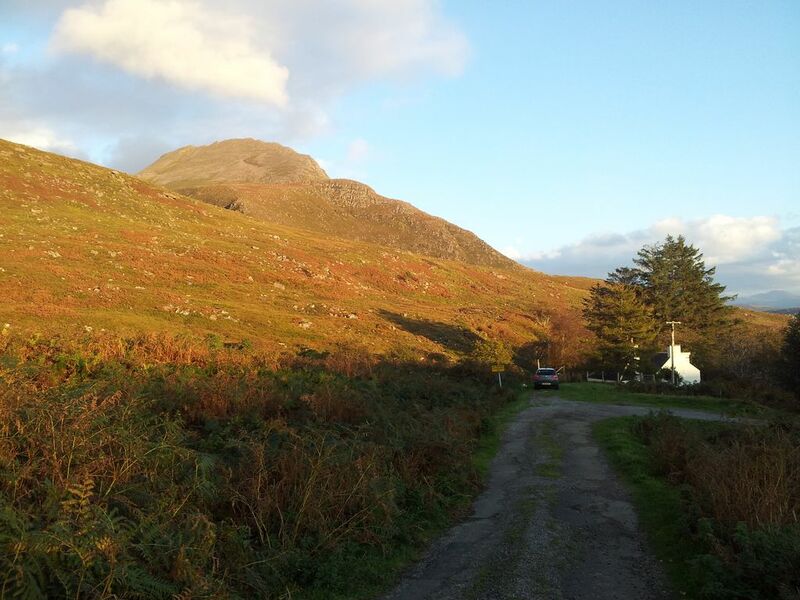 Back at the car 6.20pm with only a short drive back to Plockton for the night. Food including fav black pudding, apple & goats cheese starter at the Plockton Shores (recommended), pint of Plockton Brewery Hitched in the Plockton Inn. 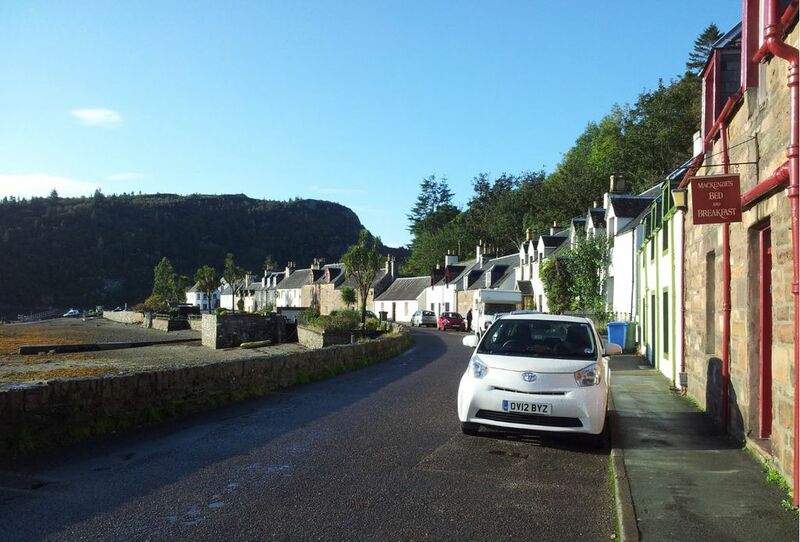 That’s four mentions of Plockton in one sentence. Great start to the holiday, very happy with our mountain choice, views stunning and delighted to get out. Apart from one figure briefly spotted in the distance we saw no one all day, excellent. That night a lot of rain fell so the River Lair would be trickier. Walk Highlands mention trying the crossing to the island downstream from where the path intersects. Might be worth taking flip flops. 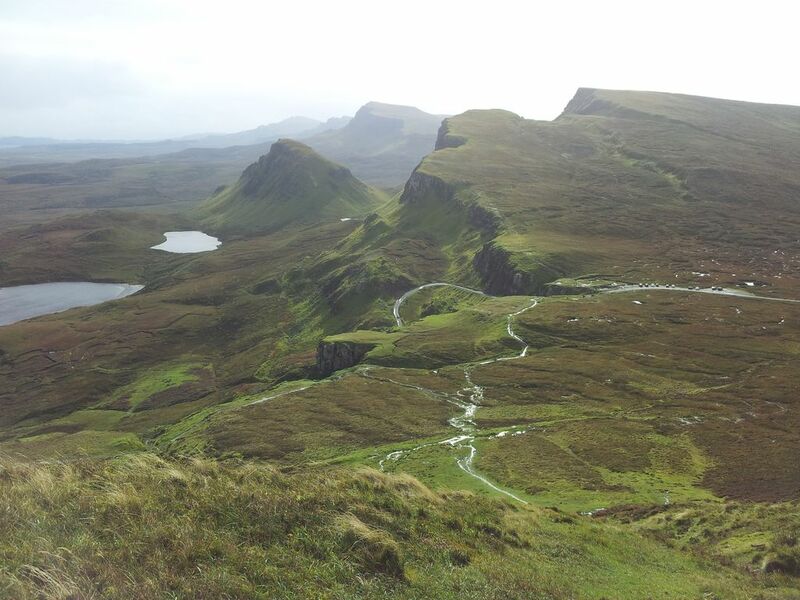 Next day after a damp gusty start we ended up at the Quiraing. Some routes need no explanation, but this one certainly does. 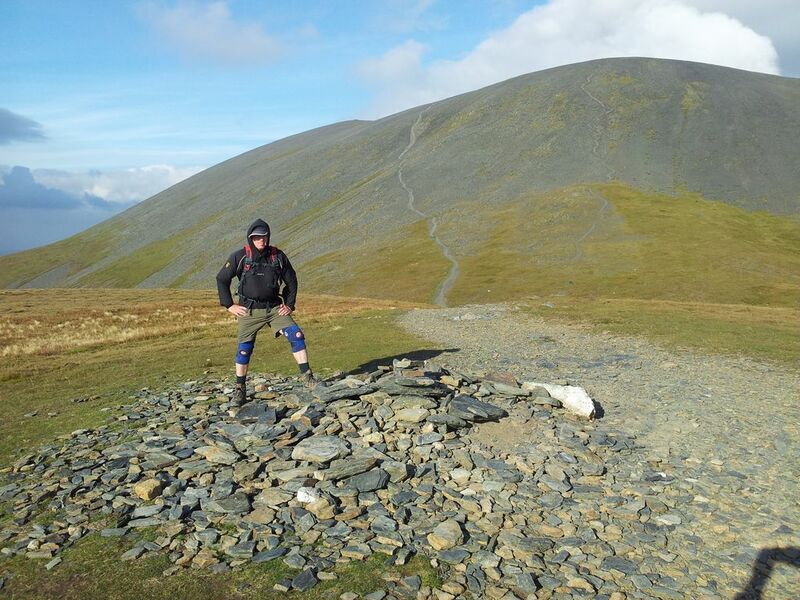 It goes like this;- my mate Alan has done more Wainwrights than me, but he’s never been happy that I’ve done three that he hasn’t. 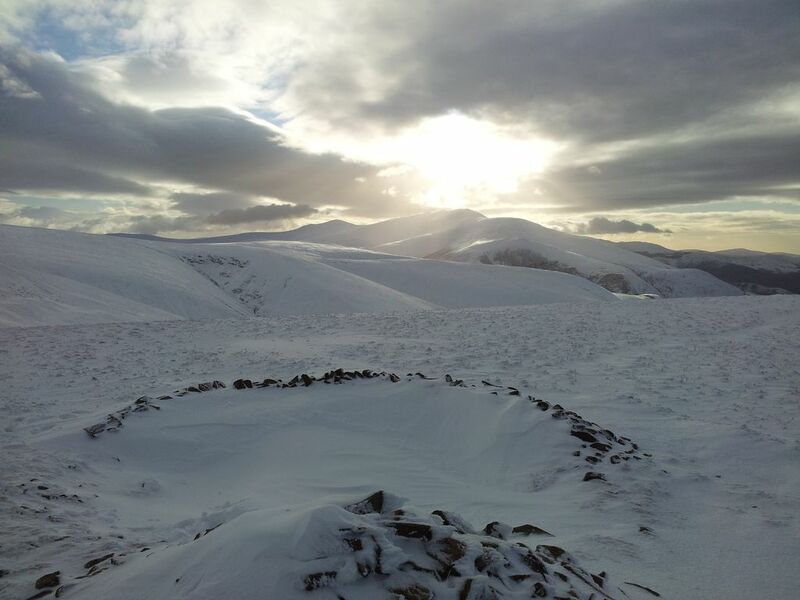 The offending three are Souther Fell, Mungrisdale Common and Bakestall. In other news I’ve never been up Lonscale Fell, whilst Alan has. 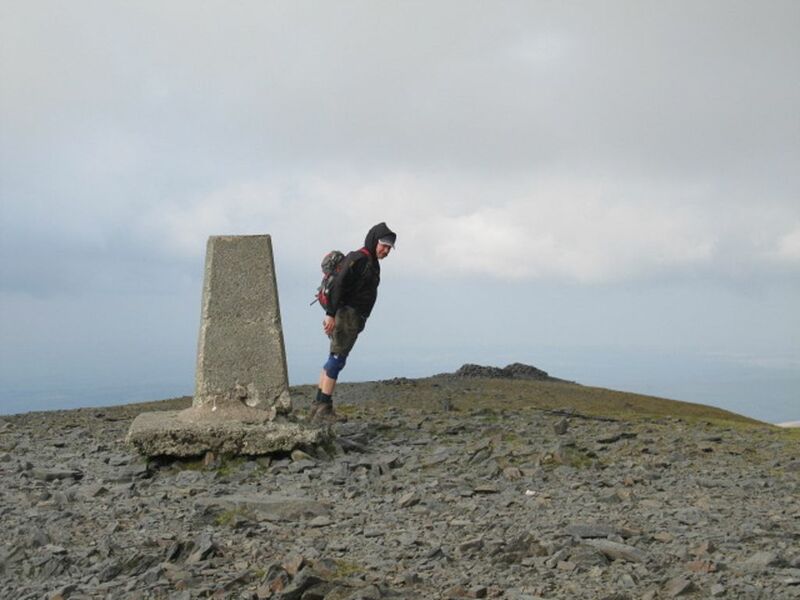 Meanwhile neither of us have done lowly Dodd on Skiddaw’s west side. Alan doesn’t have a car, so to avoid numerous bus trips a cunning plan was formed over pints of foaming beer. It would put right all the wrongs above and restore balance to the force. (Also Alan could then find something else to worry about). Plan A;- I’d drop Alan off at Mungrisdale where he’d start walking west over Souther Fell. Meanwhile I’d drive west and park below Skiddaw on the road to Latrigg. I’d then walk up to bag Lonscale. 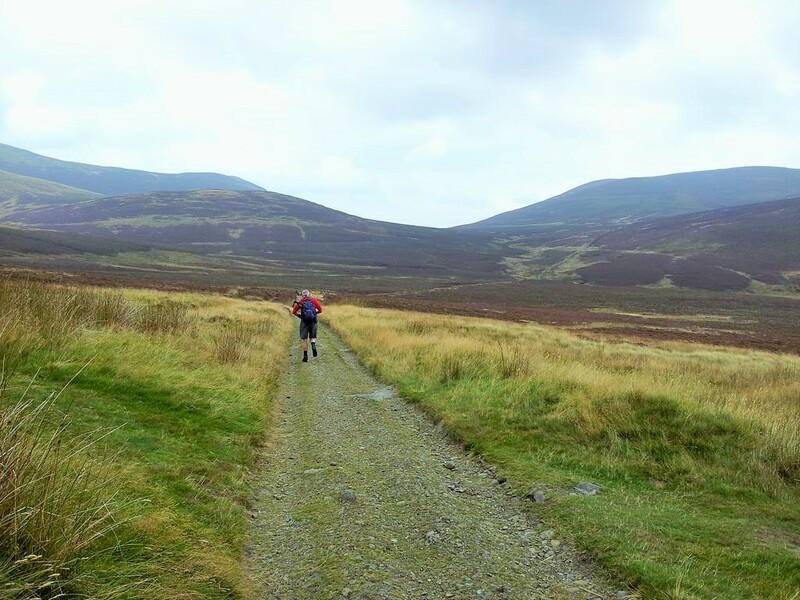 Alan would continue on to Mungrisdale Common, Skiddaw House then Bakestall. 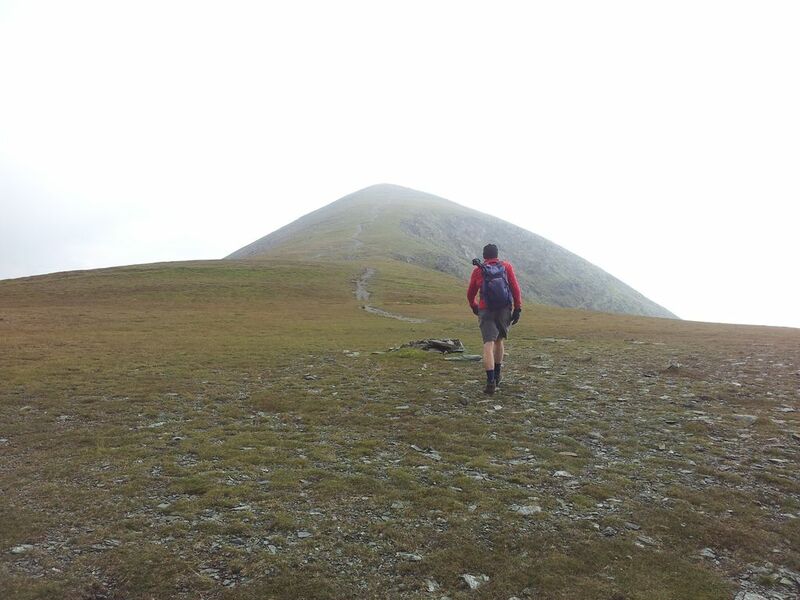 I had the easier task of ascending Skiddaw from Lonscale to wait for him on top. 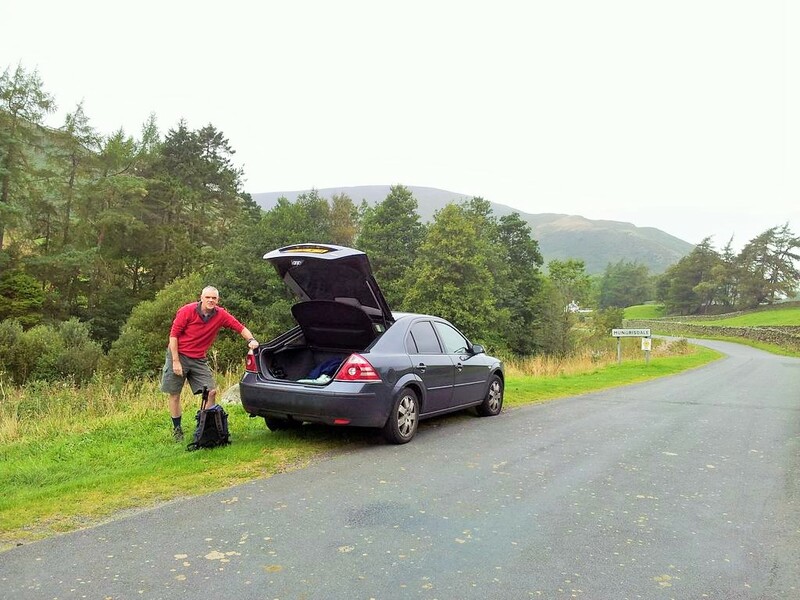 Then we would both descend back to the car via Dodd. Plan B:- Late amendment. My walk was too short and waiting on tops of mountains can be a bit chilly. 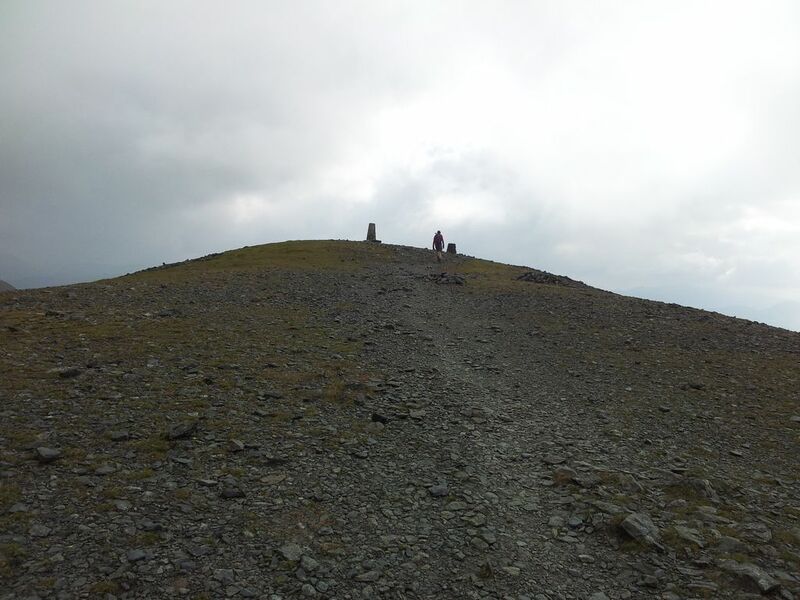 So from Lonscale I would also descend to Skiddaw House, where we would both meet up before continuing on up Bakestall to Skiddaw, then down over Dodd. It’s like a giant pincer movement, sorry I’m on the wine. Anyhow….. Starting Point – Layby west of Millbeck at the wooden footpath signpost. I once stayed at Lizzick Hall so knew there weren’t many other parking places along this road. 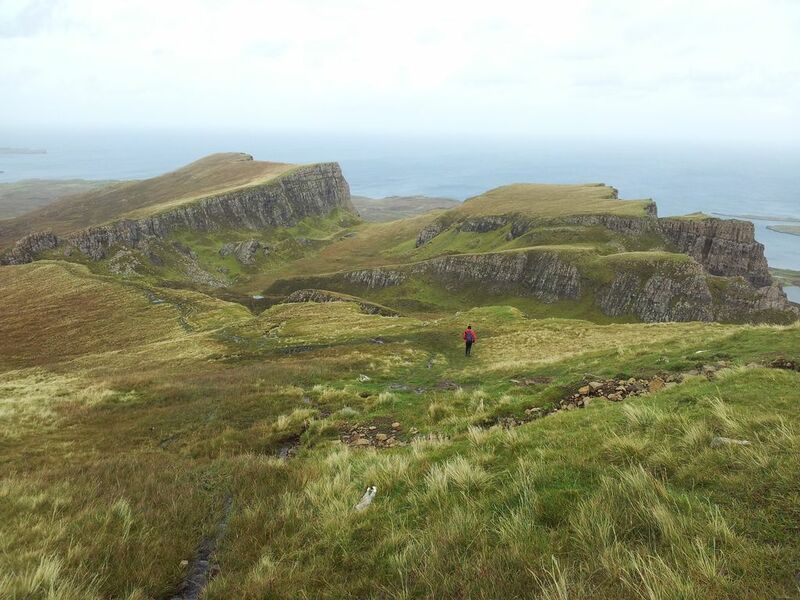 Route Summary – Walks work best in stages, so here’s the 4 that worked for me. 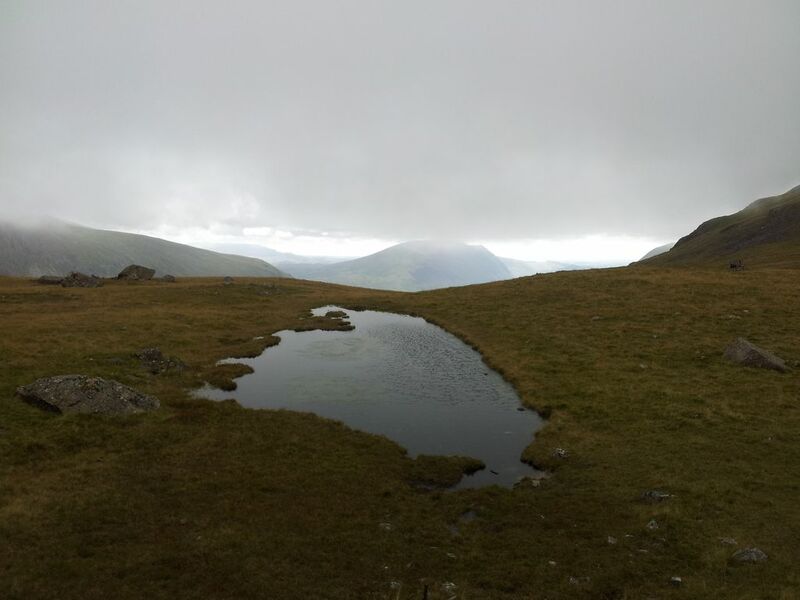 10.25am – Dropped Alan off at Mungrisdale, forecast was for a grey start generally improving. In reality it had just started drizzling with cloud down. Not ideal but I had reasonable confidence in the Met Office (despite failing to mention drizzle). PS; I’ve had to touch-up the first section of these photos as they were really dull, they flatter the weather. 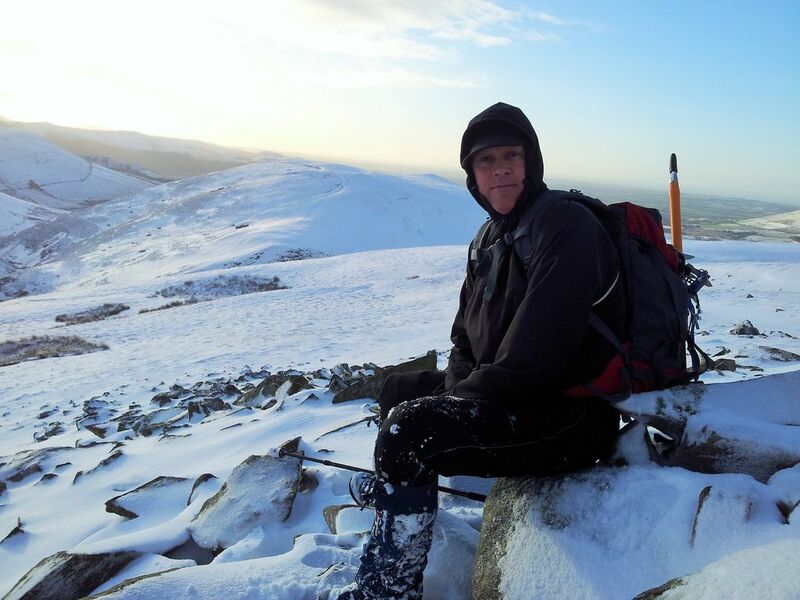 11.10 – Alan’s photo on lower top of Souther Fell! 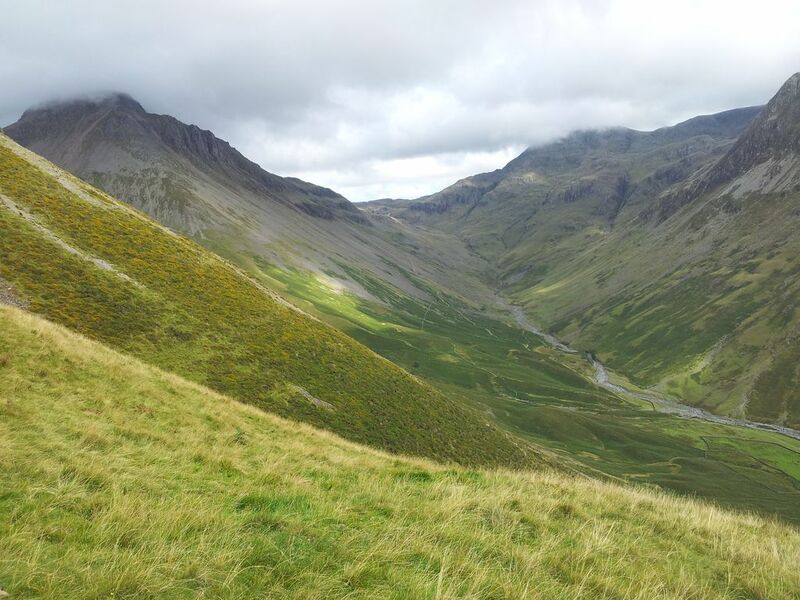 Nice road to walk along, quiet with pleasant views south over to Newlands and Coledale. 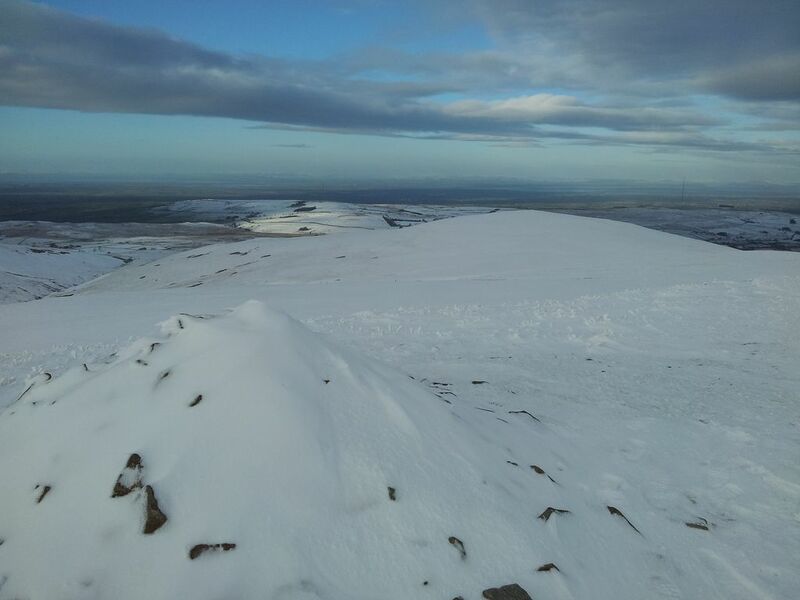 Received a text from Alan 3 mins after I left saying he was on the far top of Souther Fell. Meanwhile suddenly in the grey gloom some sun appeared, briefly. 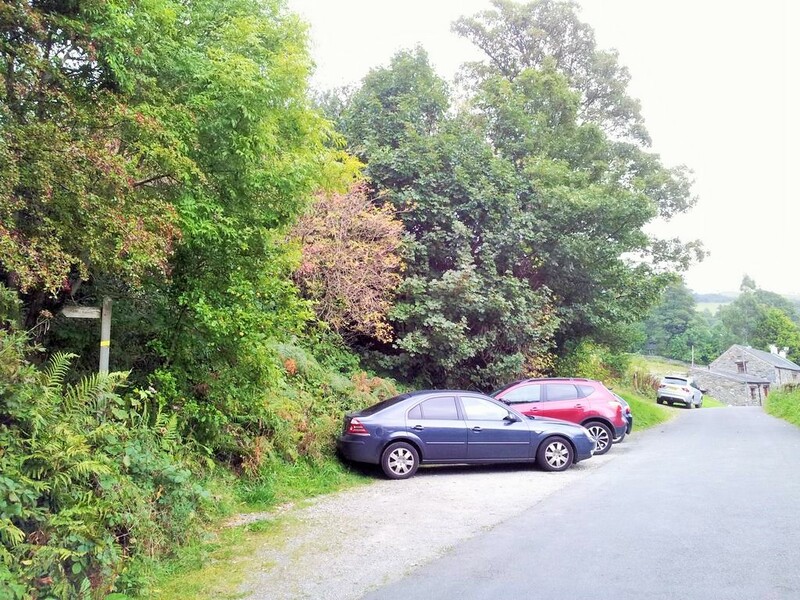 After 30 mins walking I reached Latrigg car park, heaving with cars trying to shoehorn into spaces. Very well managed path in big gravelly zig zags to cope with heavy footfall. First time up this route, my two previous Skiddaw ascents having been from near Bassenthwaite and via Sharp Edge (interesting day that one). After some sustained ascent the main path switched north west, whereas I diverted off north following the Whit Beck over a faint grassy track. 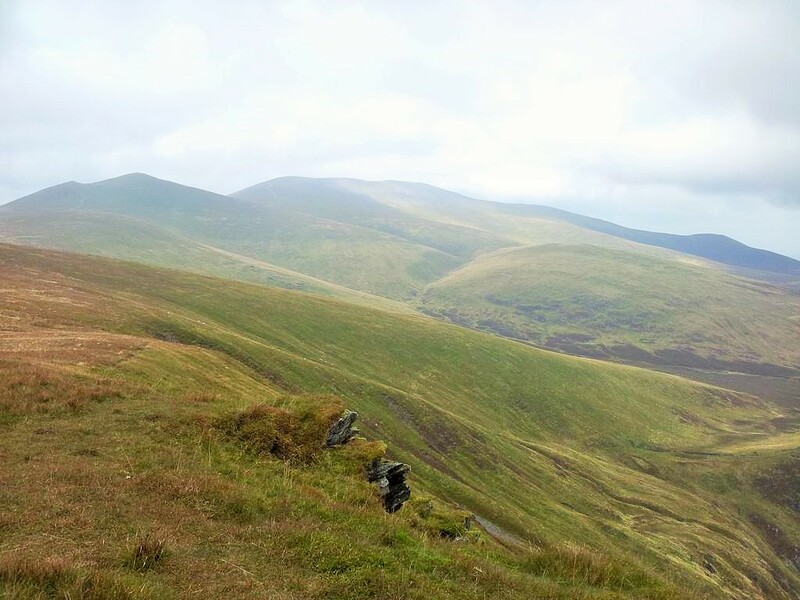 Cresting the dip between Jenkin Hill & Lonscale Fell brought first views over the Back o Skiddaw. Then a right/east turn along a fence for Lonscale Fell top. Now if I could get to Lonscale top before Alan got to Mungrisdale Common I reckoned I’d get down to Skiddaw House before him. There was no competition here of course, I just wanted to beat the long legged bugger. 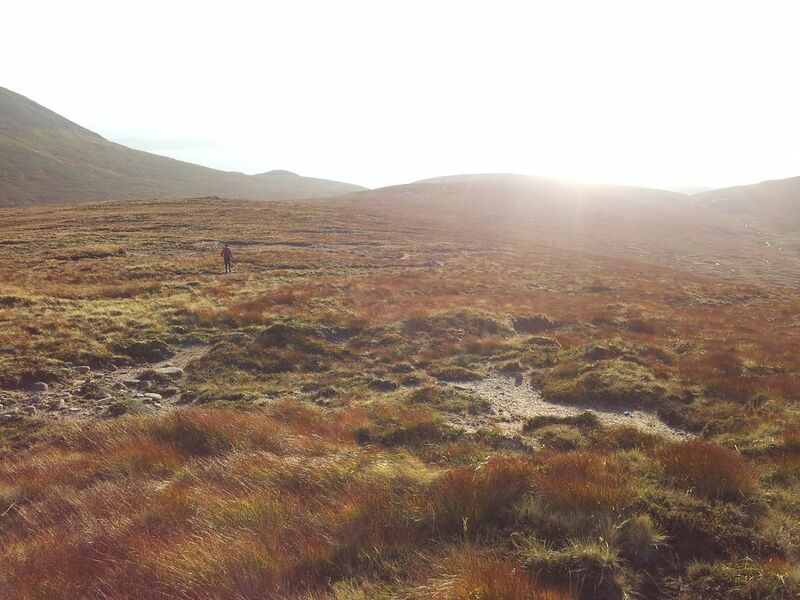 On my ascent to Lonscale my phone went and the worst news possible, a text from Alan already on Mungrisdale Common. He was having some food & would leave at 12.40. 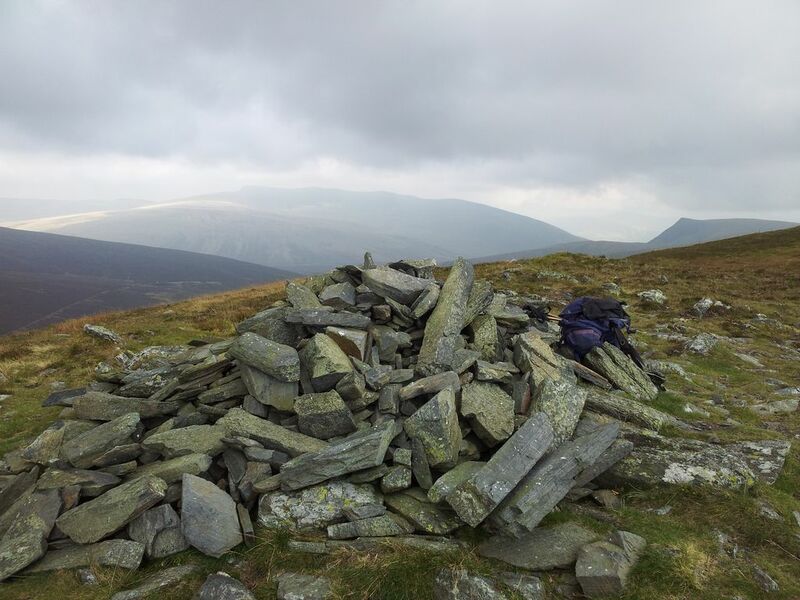 At exactly 12.40am I reached Lonscale Fell cairn. Not having been here before I wasn’t sure if this top was the Wainwright or above the distinctive cliffs. Either way I wanted to stand above them and check the views out. A grey day but still good, also refreshingly I was totally alone, no one to be seen. 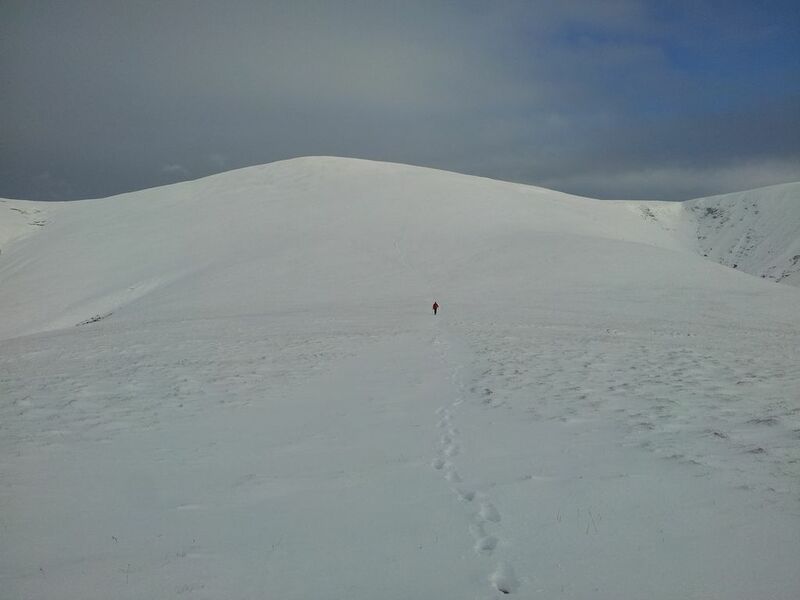 Menacingly though somewhere down there was a long legged Alan hurtling towards Skiddaw House, he would get there before me, my fate & mountain manliness were doomed. 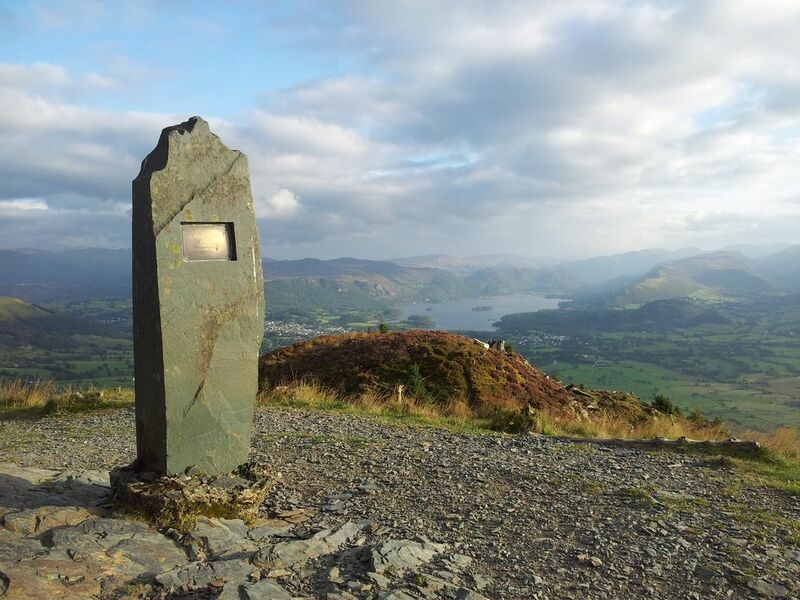 Stage 2 – Lonscale Fell to Skiddaw House; (40 mins). After a few seconds enjoying these views I hurried across the tufty grass, firstly north west then north east for the descent over Burnt Horse. This looked fun – and it was, had a nice mini edge to it. 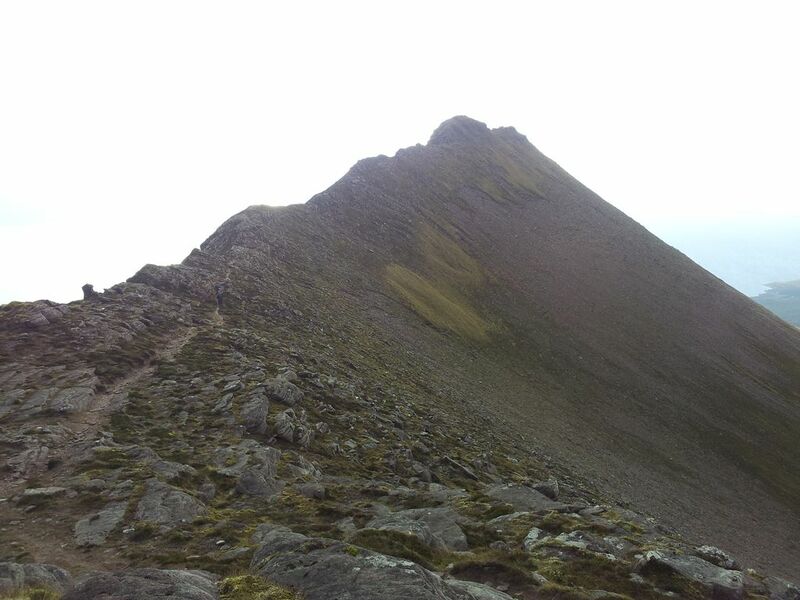 It was up there I spotted Alan on the path far below, closing in on Skiddaw House. I was close but my descent route went straight down rather than angling to the House. I thought of lobbing a rock at him or something, anything to slow him down. Alas this wasn’t possible and I had to accept that the long legged bugger had beaten me. Look at the smug expression below, note the feigned tiredness as if he’d waited ages. We had some food and exchanged route stories. Bizarrely he had seen what appeared to be a childs fluffy toy on top of Souther Fell, which turned out to be a confused grey squirrel. (Reported this later as it’s a protected Red Squirrel area). 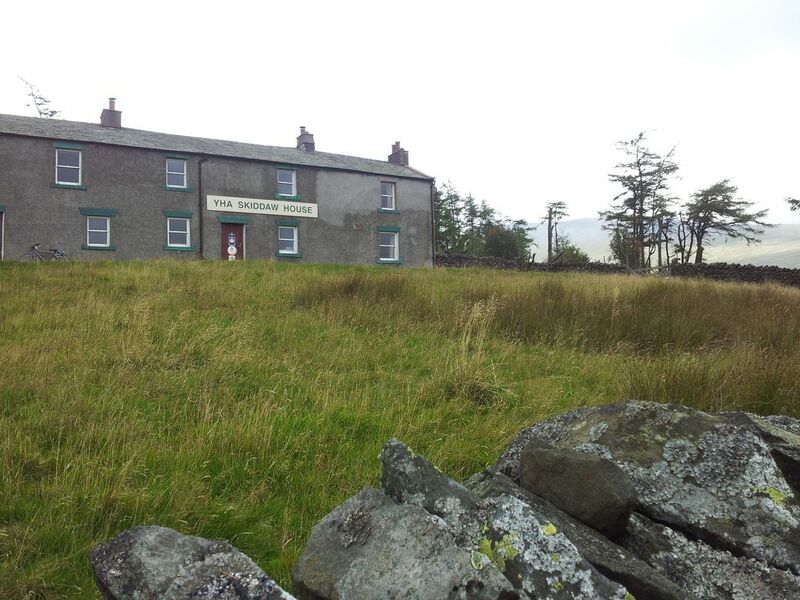 1.40pm – leaving Skiddaw House – Britains’ highest YHA Bunkhouse!! 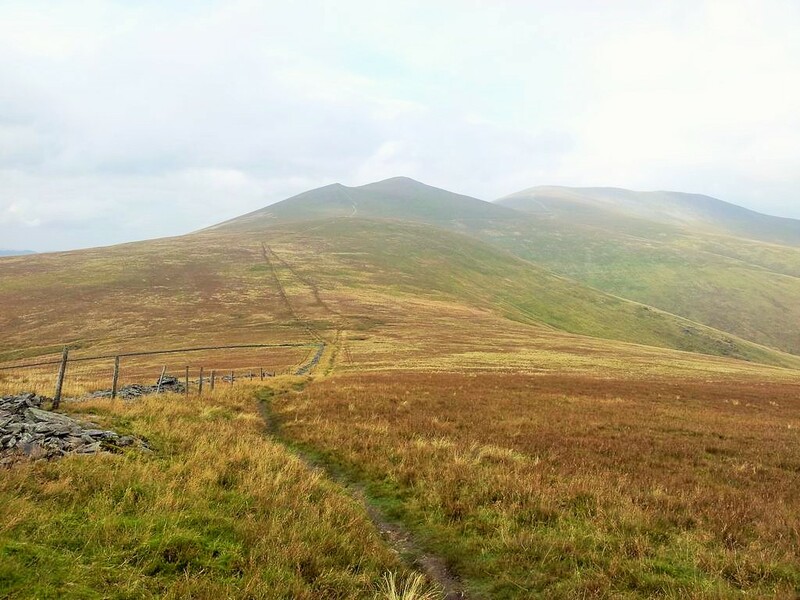 Stage 3 – Skiddaw House to Skiddaw via Bakestall; (2 hrs). Refreshed and fed, we started along the excellent path north west, dodging occasional mountain bikers. 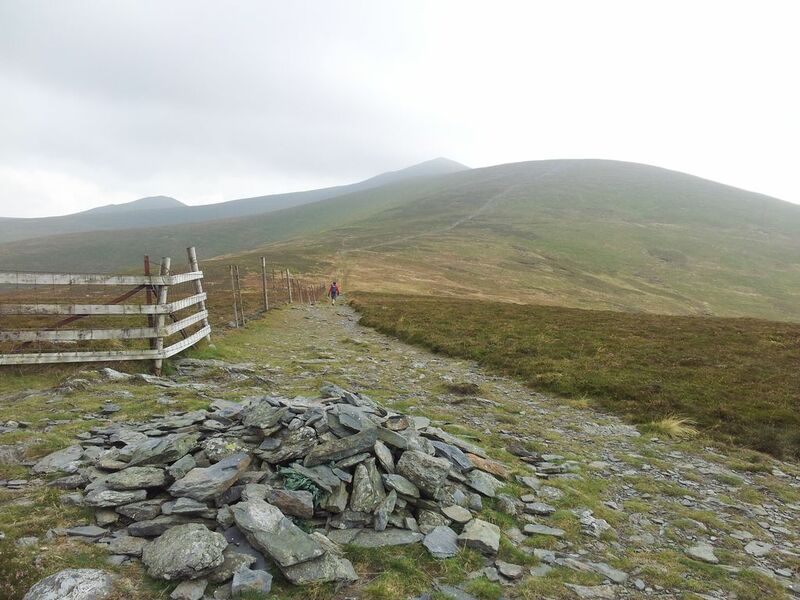 Nice along here, looking up at Skiddaw, Great Calva & back to Blencathra (still full of cloud). 1.40pm on way to Bakestall – look he’s away again! Took about 30mins to get to the spot below, just above Dash Falls with probably the worst section of the day ahead, the slog up to Bakestall. 45 degrees, relentless. 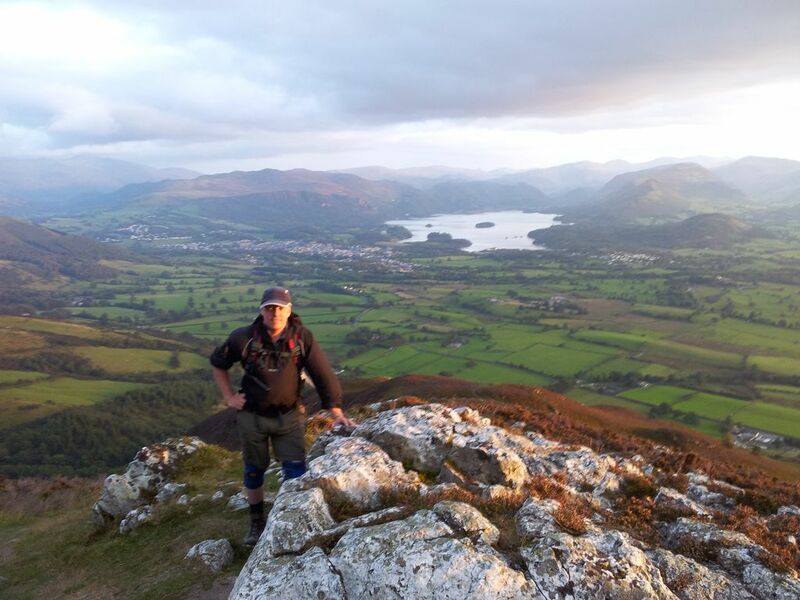 2.55 pm on Bakestall, the last ever Wainwright I’d done but Alan hadn’t!! 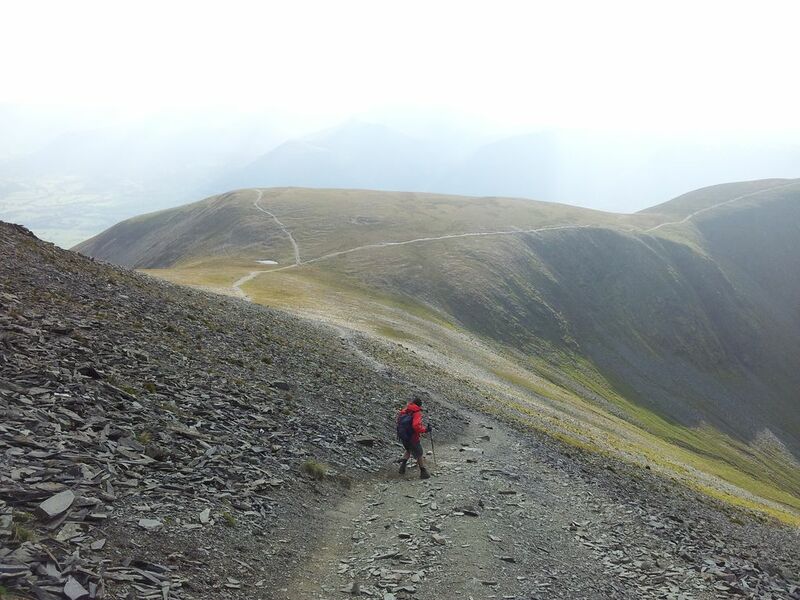 The pace slowed up to Bakestall, glad to reach it as at least the gradient eases for the final stretch up to Skiddaw. Views were very hazy and grey yet Alan seemed at ease, because of course there were no more Wainwrights left anywhere in the universe that I’d done and he hadn’t. This happiness was fleeting, one look at that weather and it was doom & gloom “weathers changed for the worse, cloud’s coming down”. 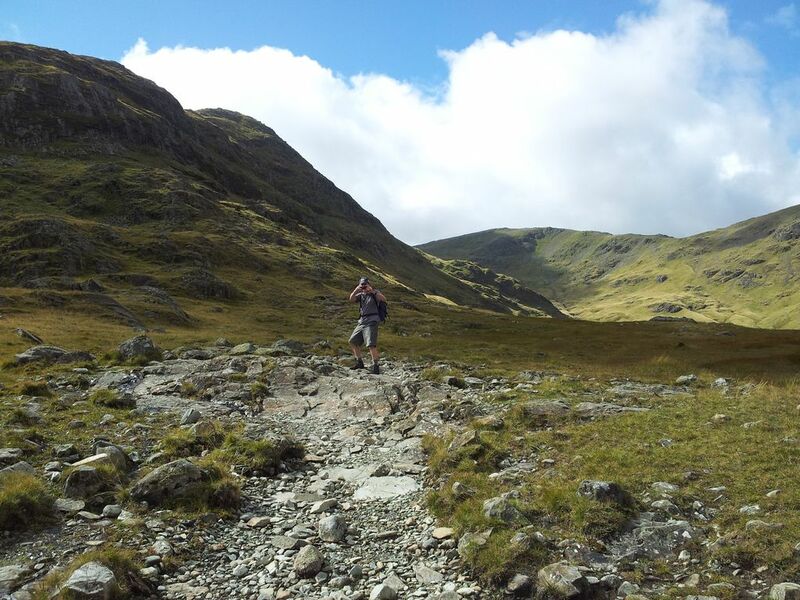 I reminded him of what happened recently approaching Kirk Fell, with some positive willpower the sky cleared. 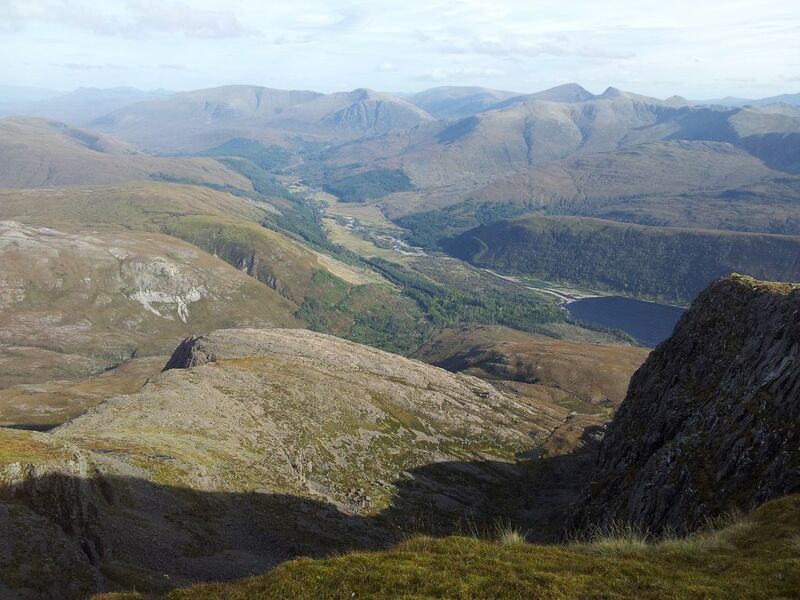 I implored him to think positively, visualise a clear summit. Secretly I could see his point, it looked grim getting rapidly worse from the south east, still I oozed positive vibes. 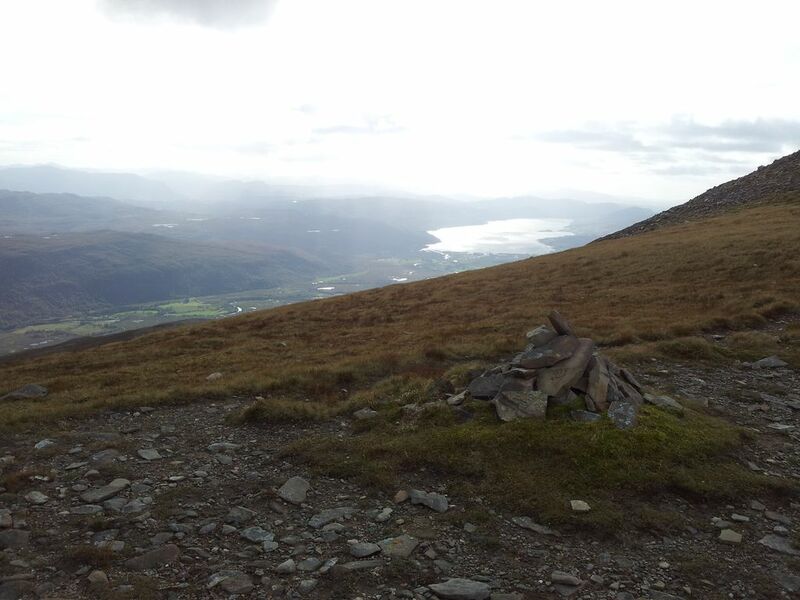 We arrived to a gratifyingly clear summit despite the threatening cloud. 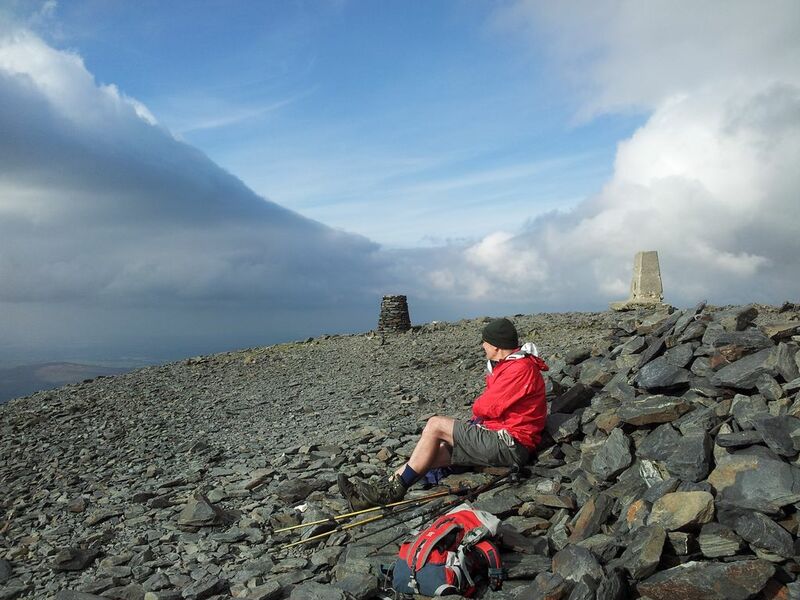 Alan had taken exactly 5hrs to reach Skiddaw, I’d taken just 30mins less, interesting stats. Remember those positive thoughts? Blencathra had cleared for the first time all day and a patch of blue. One unexpected thing, it was bloody windy, there’d been little sign of that so far on our sheltered route. We took photos then very quickly scrambled behind the shelter to escape the gale. Windy on top, maybe the curry last night? 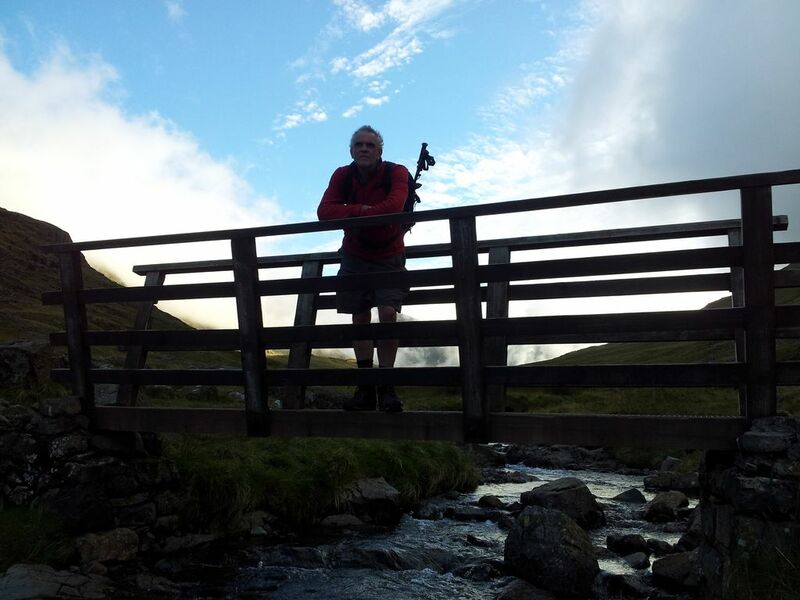 Amazing views – not Alan’s legs, the sky!! 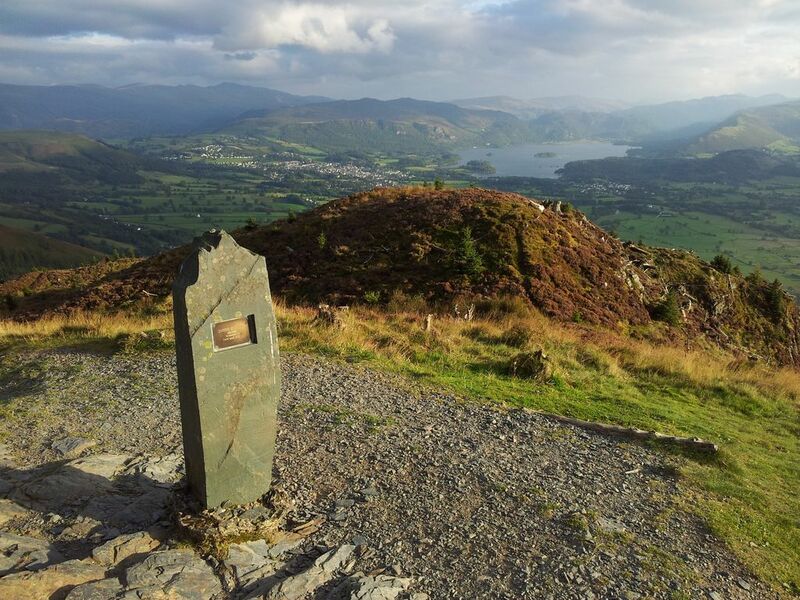 Stage 4 – Skiddaw to Millbeck via Dodd;– (3hr 30mins). 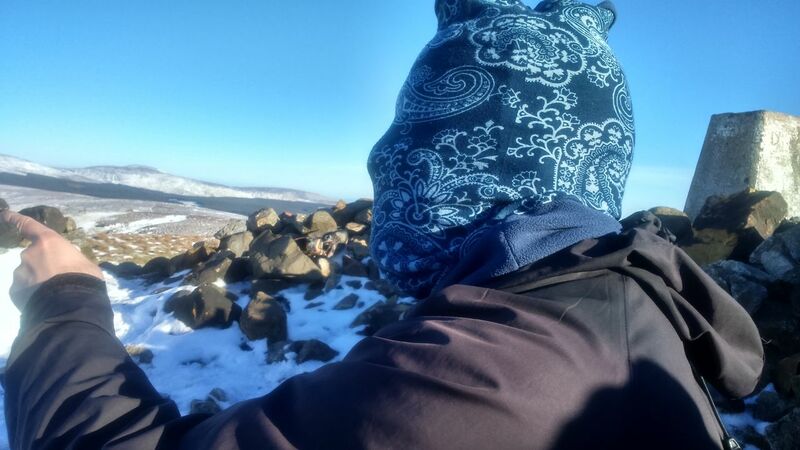 Reluctance to leave a clear mountain top was overtaken by a need to get down and a need to get warmer. We’d been up here 40 mins which reminded me how much of a bad idea my route Plan A would’ve been. Unlike Alan, I refused to put gloves on, so reclaimed some of that lost mountain manliness. Now for the knee breaking descent south to Carl Side, wasn’t looking forward to this one bit. Surprised to find it better than last time, looks like a lot of the loose scree has simply been worn away by boot power. Doesn’t look pretty though. 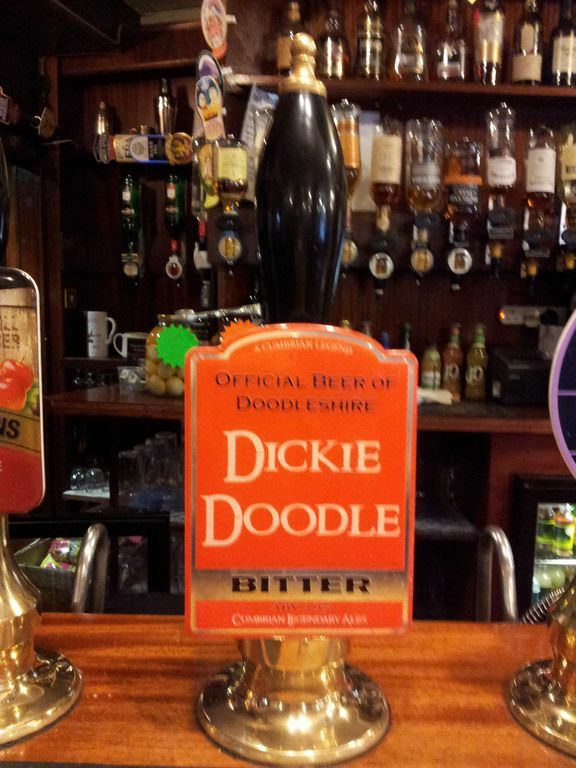 Now for a diversion to the day’s only joint new Wainwright, the elusive Dodd. Covered in conifers (I hate conifers) we had nearly attempted this offshoot many times driving past from other trips. Today was the day to finally bag it. Dodd’s lowly height however lulls you into a false sense of security, Alan knew it wasn’t straightforward, conifer plantations rarely are. We managed to locate the path linking up to the ascent ok though. 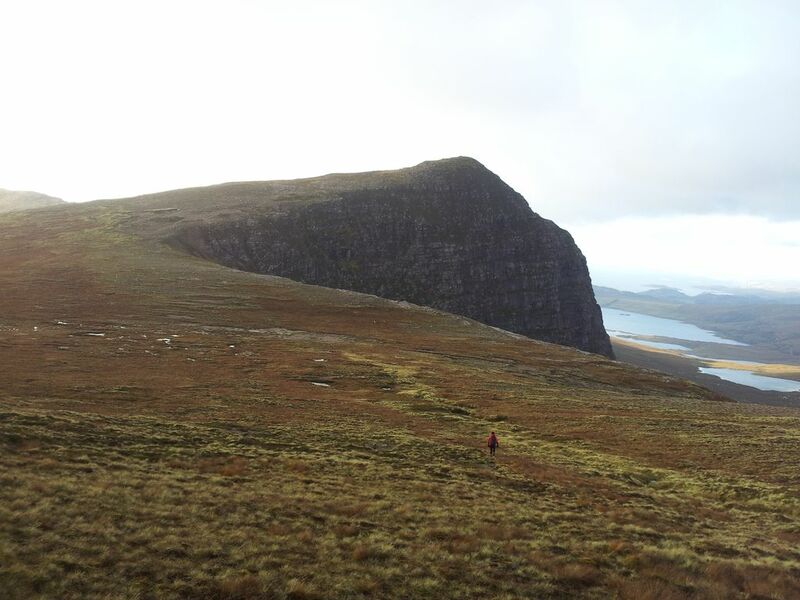 Dodd’s shape changed as we drew near, began to look bigger too, full of forest tracks. 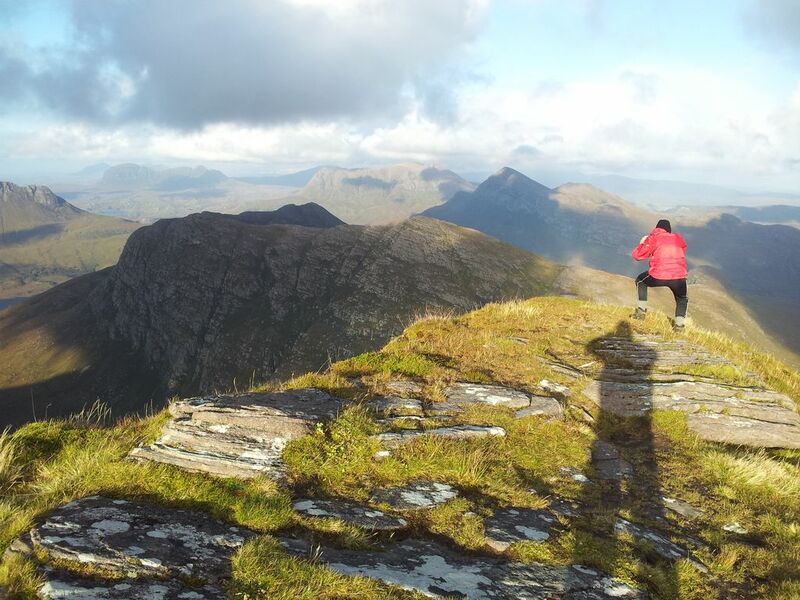 We managed to follow my Viewranger phone map paths ok and ended up on top 20mins later. We liked Dodd, spent ages up here, the views and situation lovely, the forest and tracks ugly. Dodd’s also slightly odd. Now to get down. Ah right, well the mistake I made was not preparing or checking any routes. 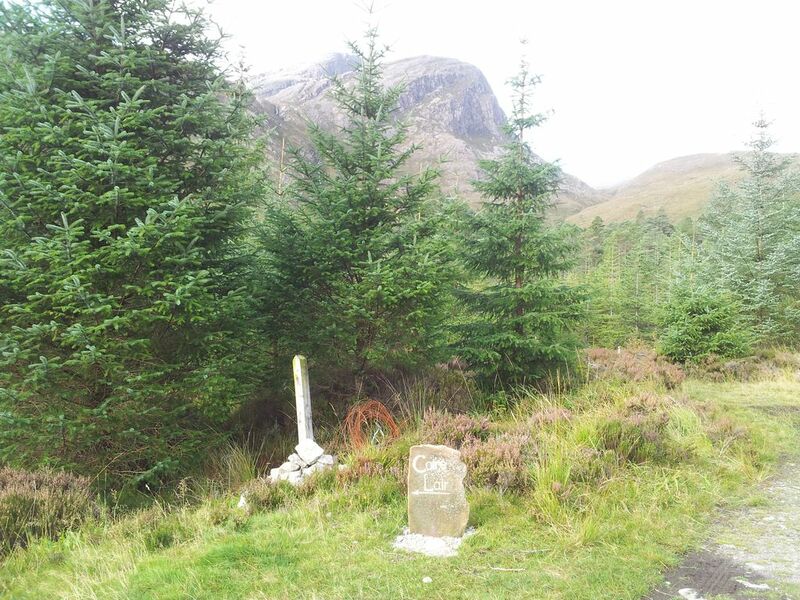 We tried in vain to locate Viewrangers marked path going south east through the trees down to the car. The only footpath sign seemed to be heading too far west and we did not fancy faffing about in dark forests. 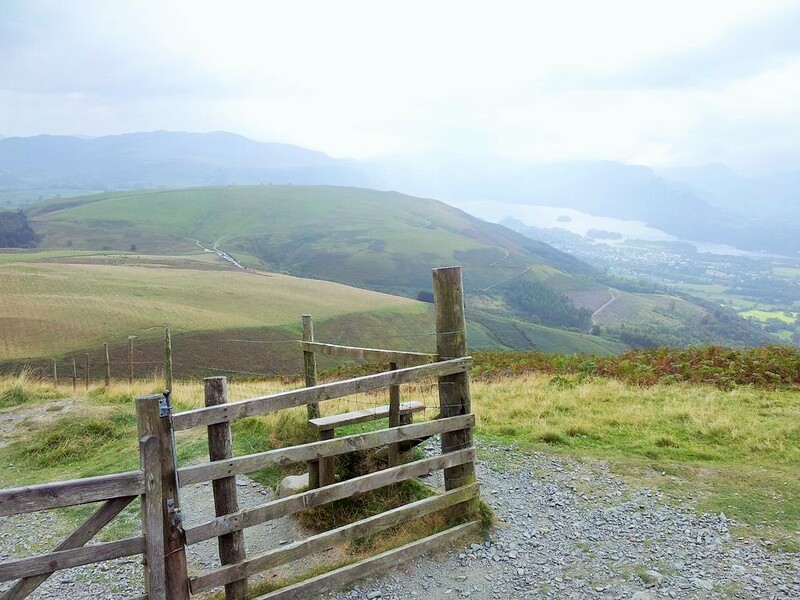 It’d been a long day so we weren’t going to mess about any longer and decided just to retrace our steps east and rejoin the main Skiddaw descent path to Millbeck. This was thankfully soon accomplished after an irritating reascent. Straightforward descent now to Millbeck and the car. 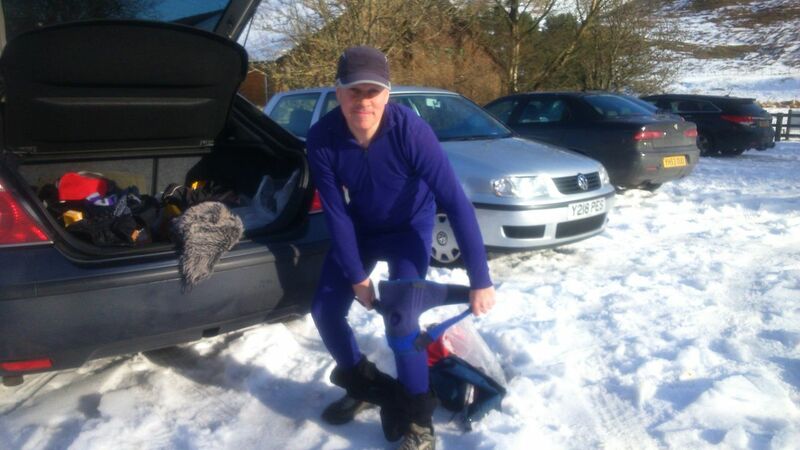 Then suddenly Alan tweaked his right knee, an old injury causing him to slow and almost hop agonisingly down. I offered my Pacer poles and sweaty knee supports, he graciously declined for some reason. Knee knackered Alan descending WAY behind me for a change! Felt sorry for him of course yet memories flooded back of past descents featuring a distant Alan waiting for me and my aching knees. 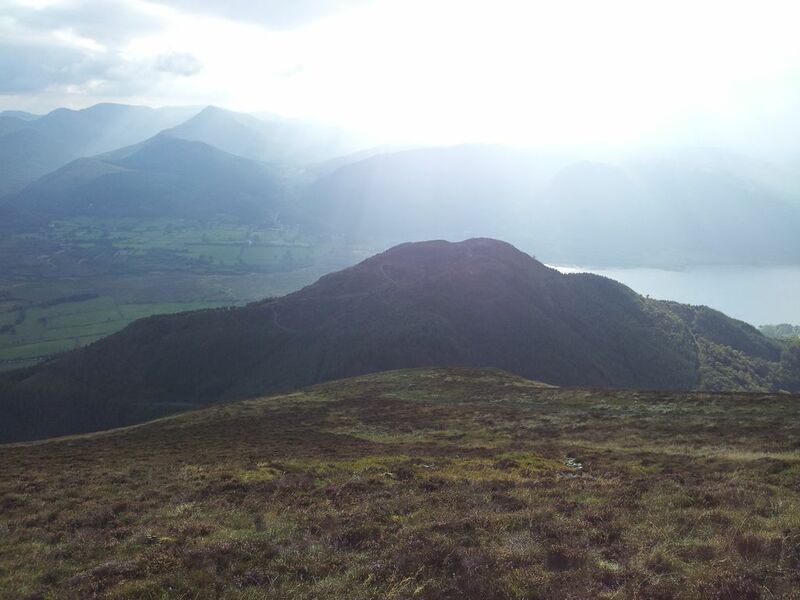 As he hobbled down I thought back to my failure at Skiddaw House, and in an instant all my mountain manliness returned. The force had indeed been restored to the universe and we were both more than happy to reach the car parked very close at 7.45pm. Plan B had worked, it had been a good day in the fells. Final path to Millbeck below in gently fading light. 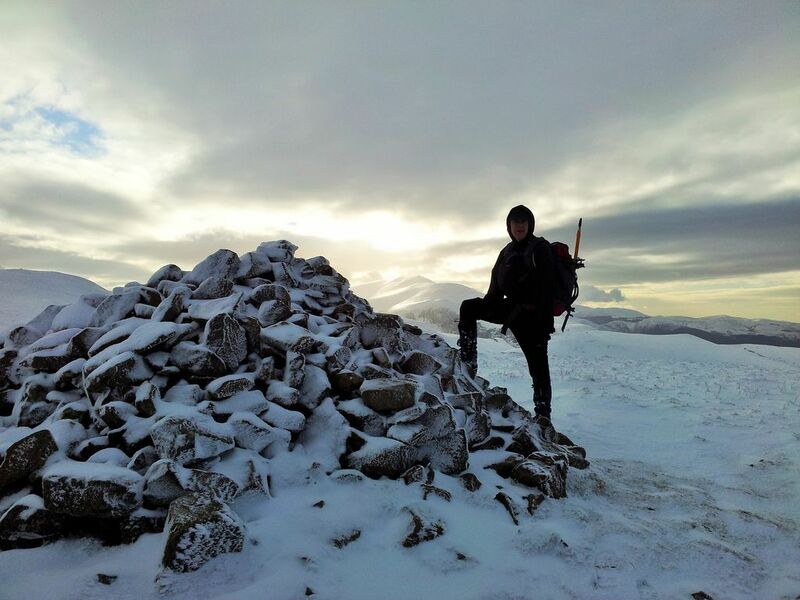 Second attempt to finally bag Kirk Fell after last years bad back failed expedition. 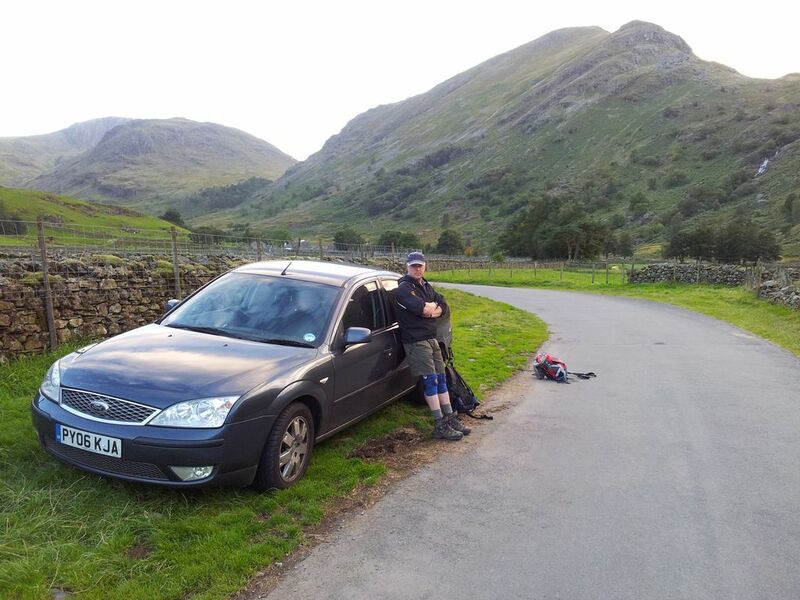 Plan A was to park again at Seathwaite, head up Sour Milk Gill, along Gillercomb, over Green Gable, Windy Gap, skirt around Great Gable across Beck Head and up to Kirk Fell. 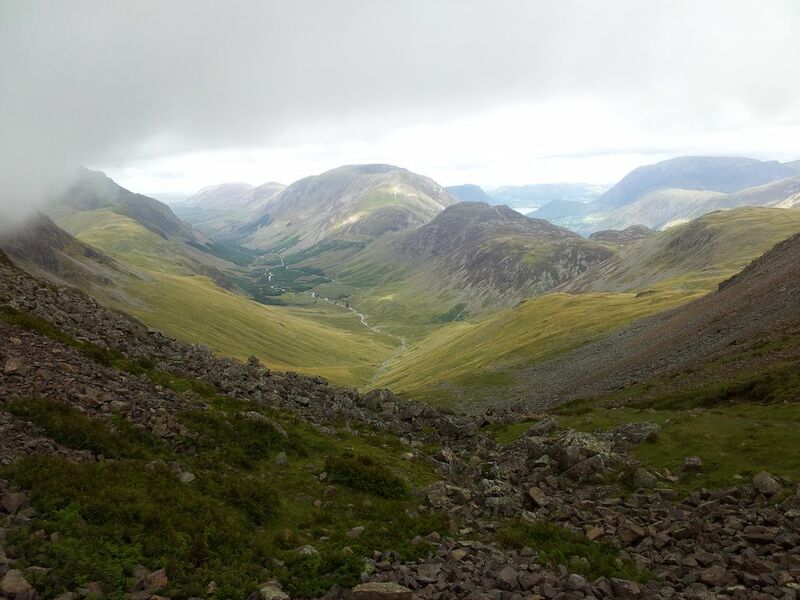 From there we’d turn back east up and over Great Gable then down to Sty Head and back to Seathwaite. 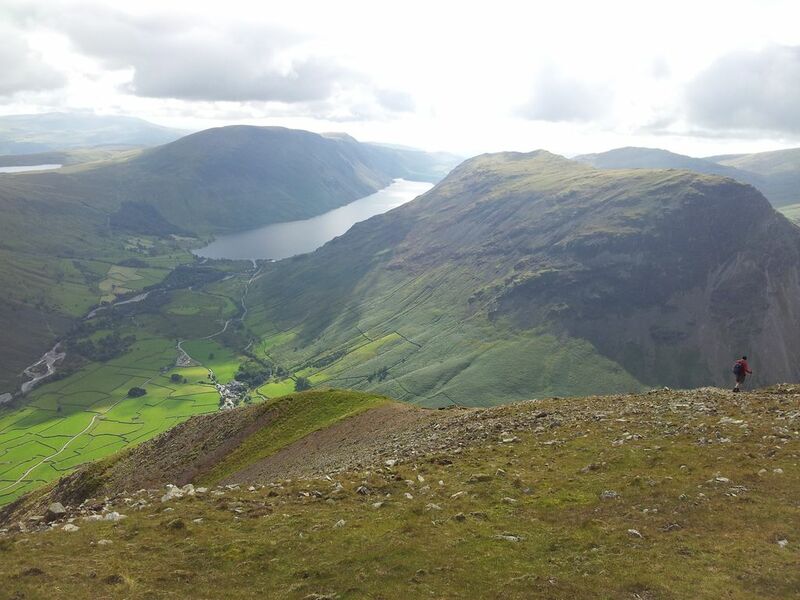 However, there was also a second option from Kirk Fell, if time permitted. 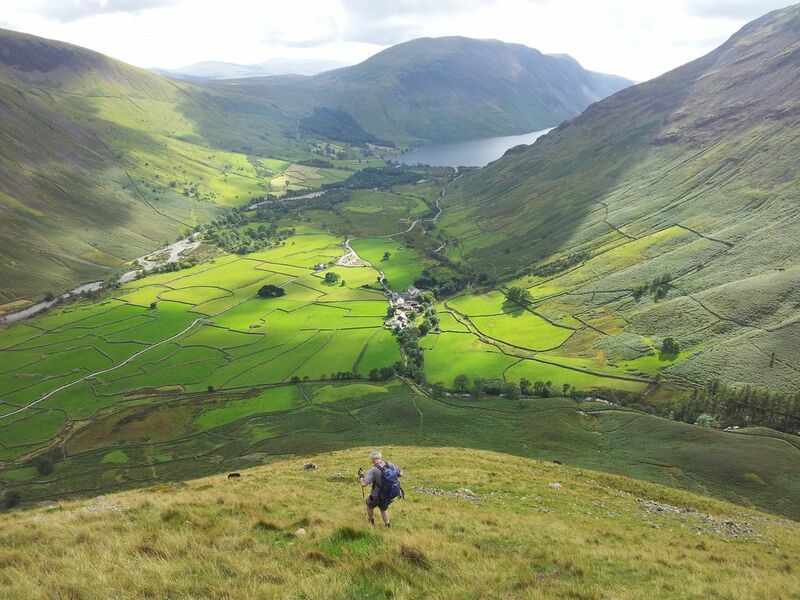 Inspired by a thoroughly enjoyable route on Sca Fell some months ago, we would descend to the iconic Wasdale Head Inn for a pint, then walk up the valley to Sty Head and back to Seathwaite. 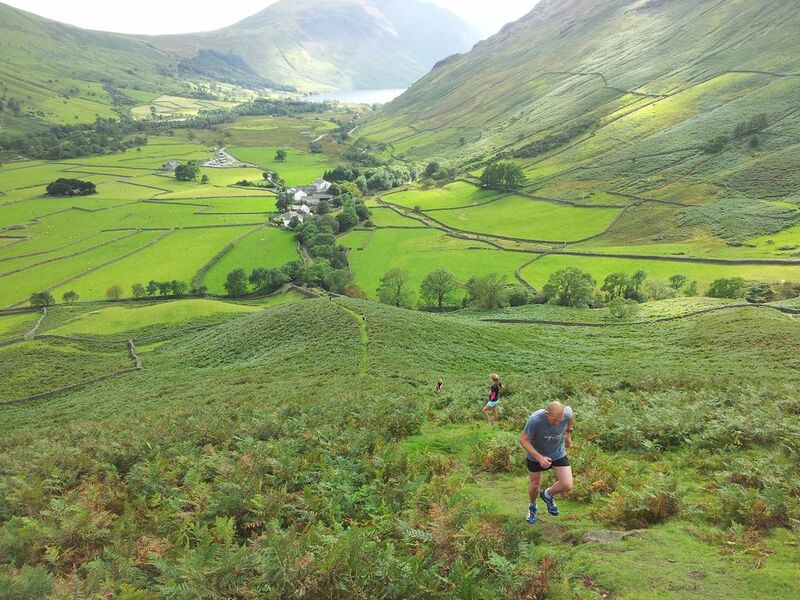 The thought of stepping on the hallowed turf of Wasdale once again was an appealing incentive. After a few rainy Sundays we had an encouraging Met Office forecast, improving in the afternoon, dry with a chance of cloud on south western tops, then deteriorating evening. 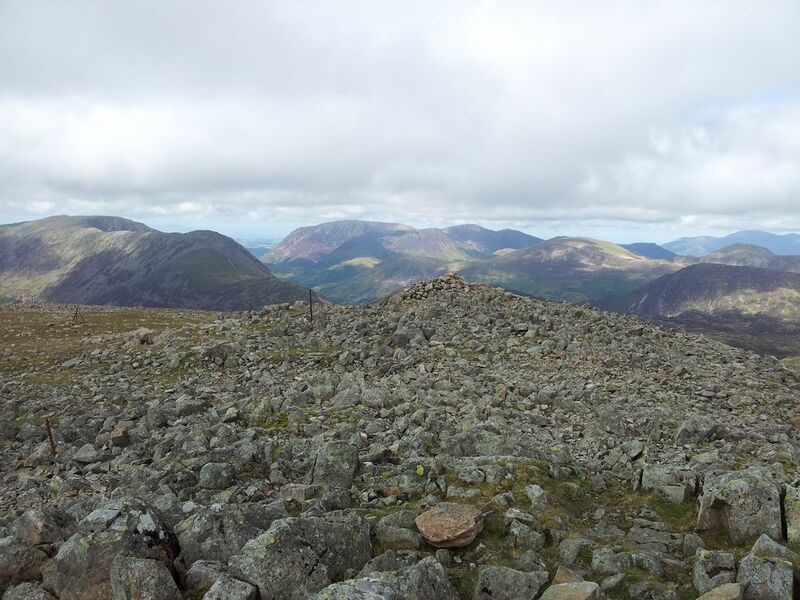 Fingers crossed for views on a new Wainwright, I’d waited many years to get up Kirk Fell. 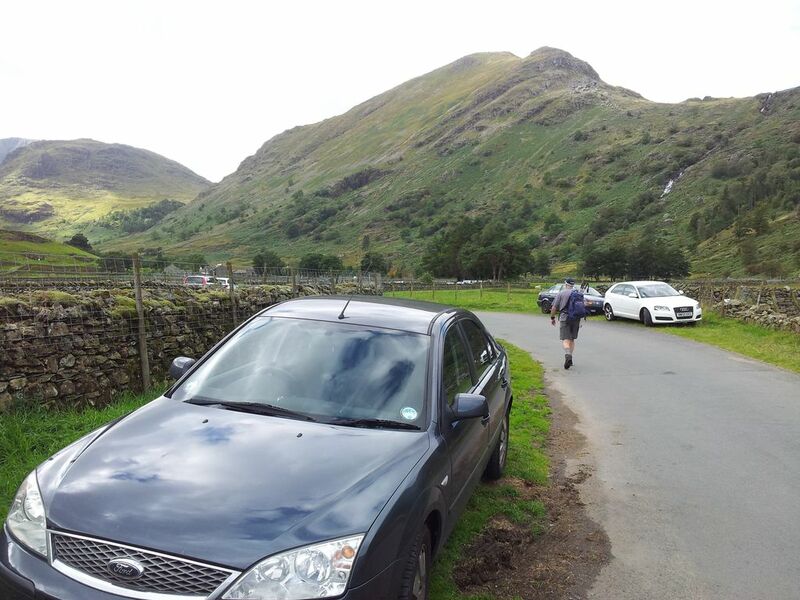 Stage 1 – Seathwaite to Green Gable; (1 hr 30 mins) – Despite a late 10.35am start we managed to get a decent parking slot, luckily not too busy. 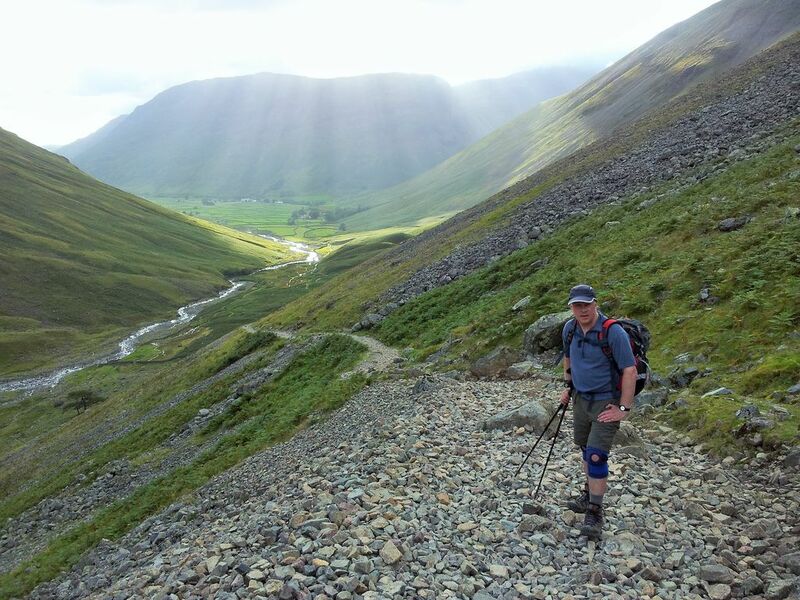 So boots on, poles extended, knee supports velcroed up, looking good in T shirt & shorts:-) Joined other walkers for the 5 min road walk to Seathwaite farm before turning west, crossing the river and starting the climb up Sour Milk Gill. Always nice to begin a walk with a stiff climb. (It’s not really). Progress was surprisingly swift, maybe I was keen to exorcise a few demons from last years painful slog. 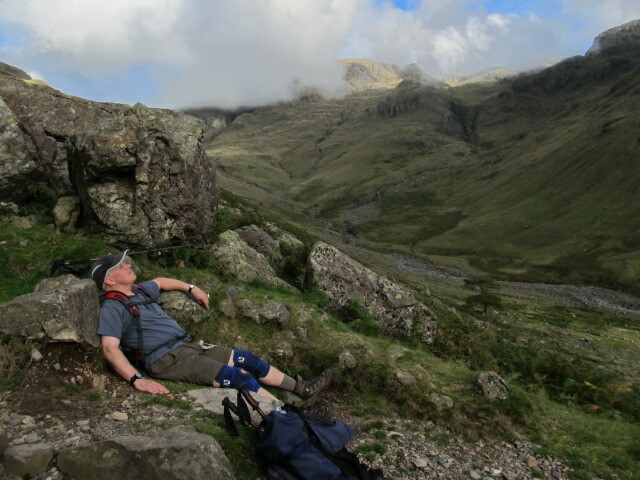 There was rueful recognition of two places I’d had to stop for a lie down, bad backs are buggering things. After minimal height gain views start immediately down along the valley. Then the usual mountain suspects open up southwards with a nice angle on the Sca Fell range. We were soon up above the waterfalls far quicker than last time thank goodness. The angle then eases very nicely for the walk along Gillercombe. 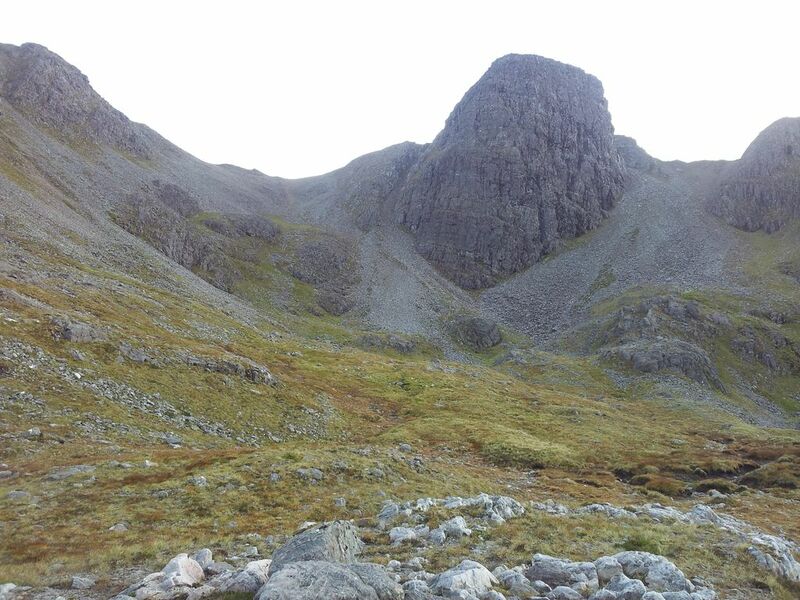 We briefly considered then reconsidered adding Base Brown to the route as the goal was my missing Wainwright of Kirk Fell. 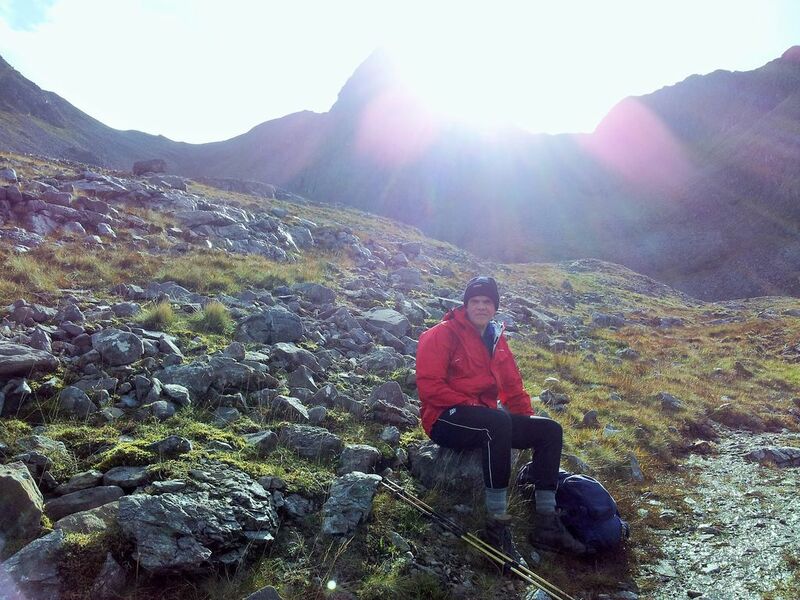 Progress was again good and we soon reached Green Gable for a quick food and route assessment stop. Unfortunately we also found cloud was still hanging over the big mountains. Always best to remain positive though and that forecast suggested it might lift. Bit of a technological delay on Green Gable as my phone was suffering random shutdowns caused by a device storage issue. Swapped batteries which seemed to sort it. 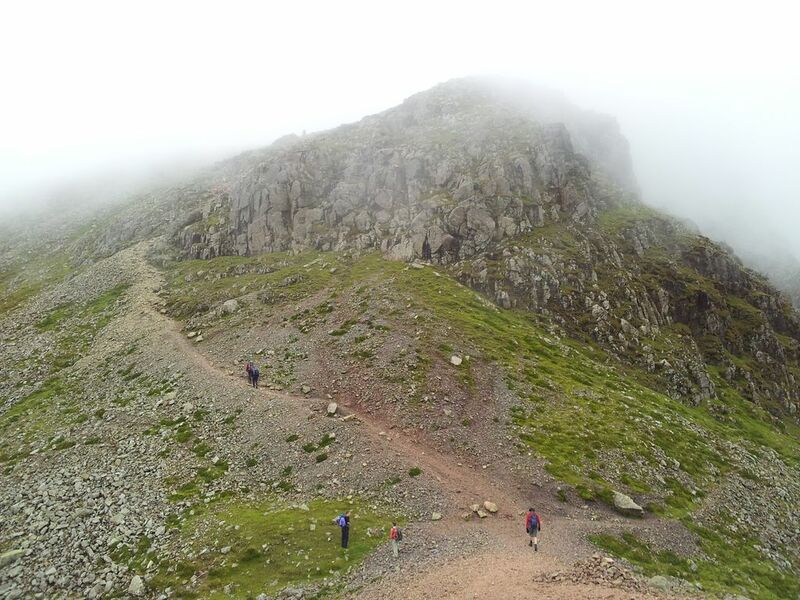 Now for the route assessment, I felt fit for a welcome change, so persuaded Alan that instead of skirting round Great Gable we should go over the top. 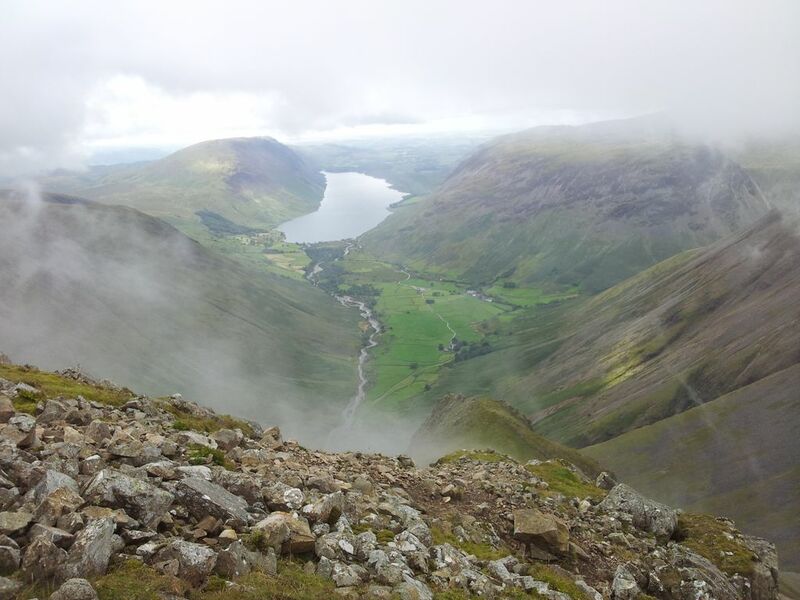 I was already wanting to do the Wasdale diversion after Kirk Fell which would already push time constraints. But what the heck, if it meant missing an evening meal and getting a takeaway in Penrith then it’d all be worth it. 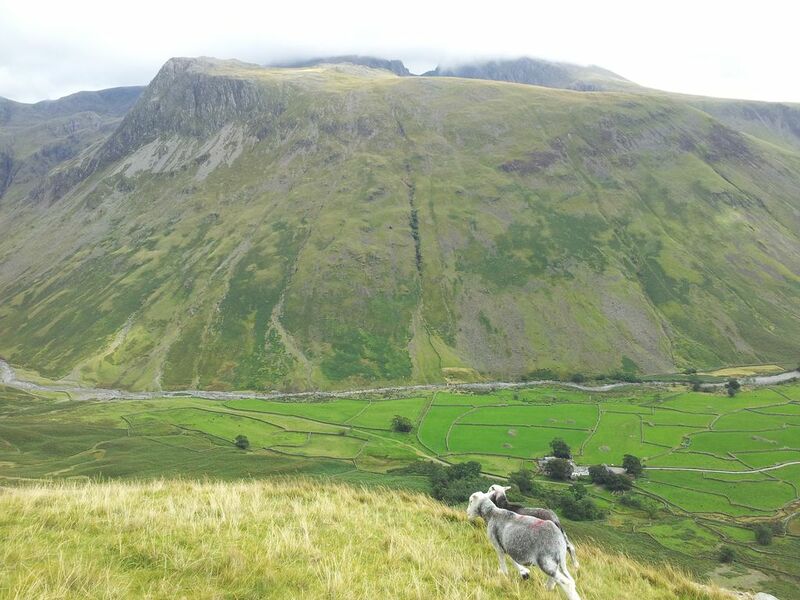 Alan wasn’t sure about the craggy route west from Gable down to Beck Head in cloud as neither of us had done it before. He was convinced the weather had turned with low cloud set in. I said confidently that we could use my phone GPS for the route and at least we wouldn’t be delayed on top as nthere’d be no glorious summit views. 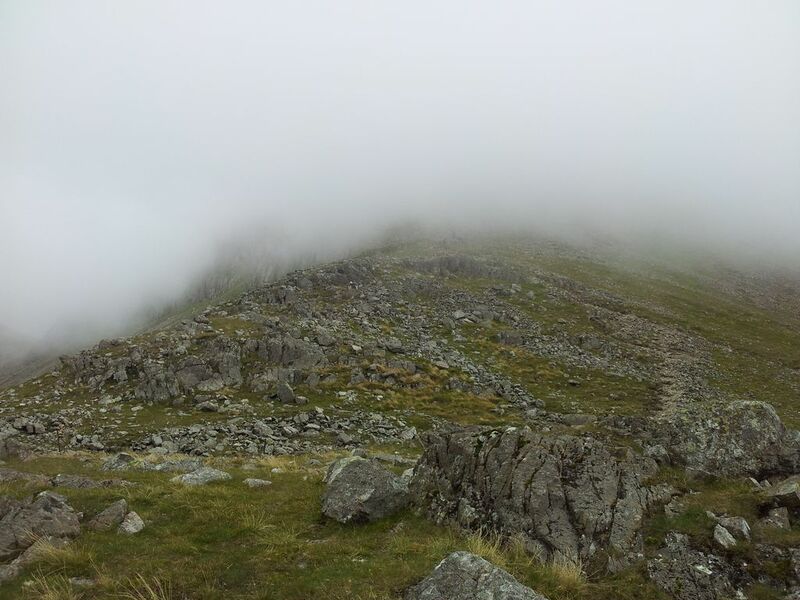 Stage 2 – Green Gable to Kirk Fell; (2 hr 45 mins with delays) So Plan B was agreed, my phone was route tracking again, and down into Windy Gap we clattered. We were up to Gable quicker than expected, that scramble can be a pain but I’ve learnt to stow my poles now which frees the hands. I dont do this enough, it’s just sheer laziness. A few people on top as usual, no chance of a cloud break so we sat on the sheltered side for food and then nipped over to see the memorial. 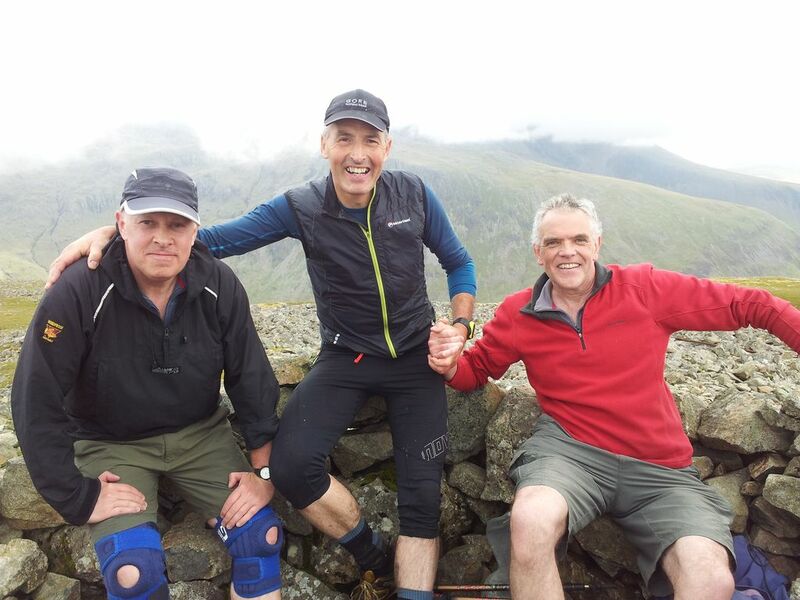 Gable’s just not the same without those amazing views, although at least Alan’s legs were hazed out for the summit shot. 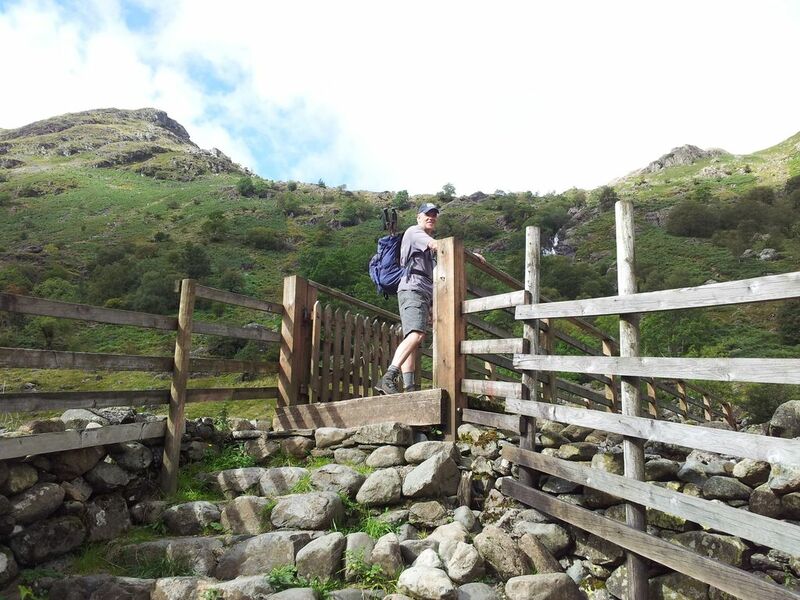 Ok back to the route checking, there were 2 path options to Kirk Fell showing on the map, Alan was happier with the less rocky one so off we went. It looked steep but should be easily followed in the cloud especially by checking the route on my phone. 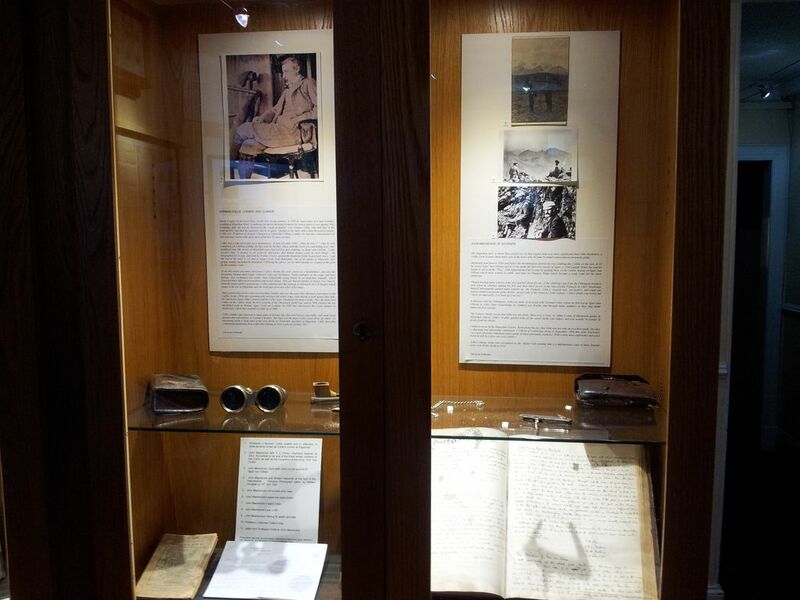 I even had a compass on my wrist, now had I looked at this we wouldn’t have had any problems whatsoever. But I didn’t and we did. 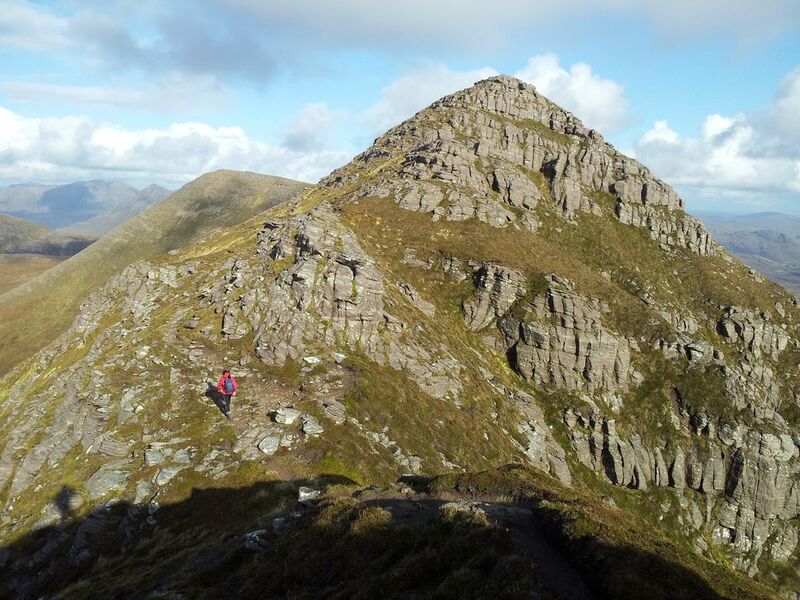 The Gable incident – how not to navigate in the hills! 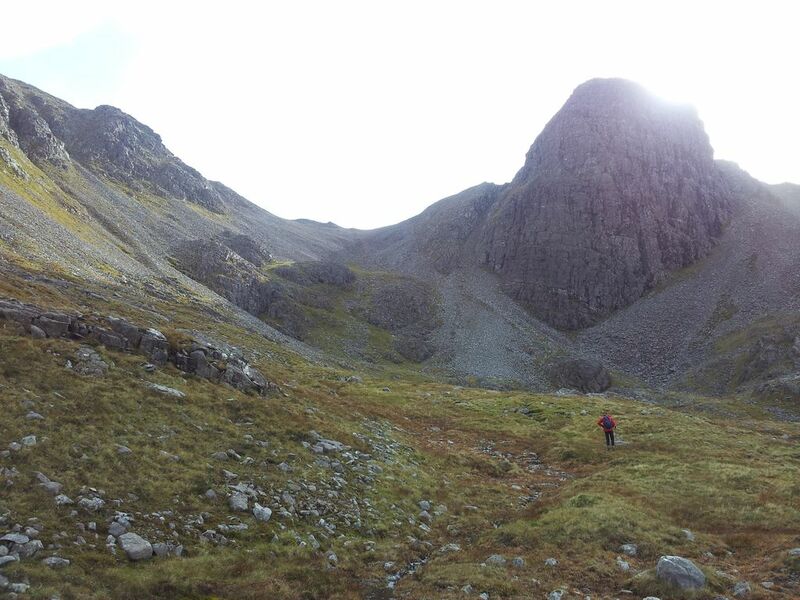 We started along a cairned path which was clearly the craggy direct descent we were trying to avoid. I checked my phone and angled south west to pick up the second path. This was easier said than done and after a bit of faffing we found a kinda path which seemed right. This started getting into steep scree so we angled south catching a glimpse of what looked like a path through the cloud. 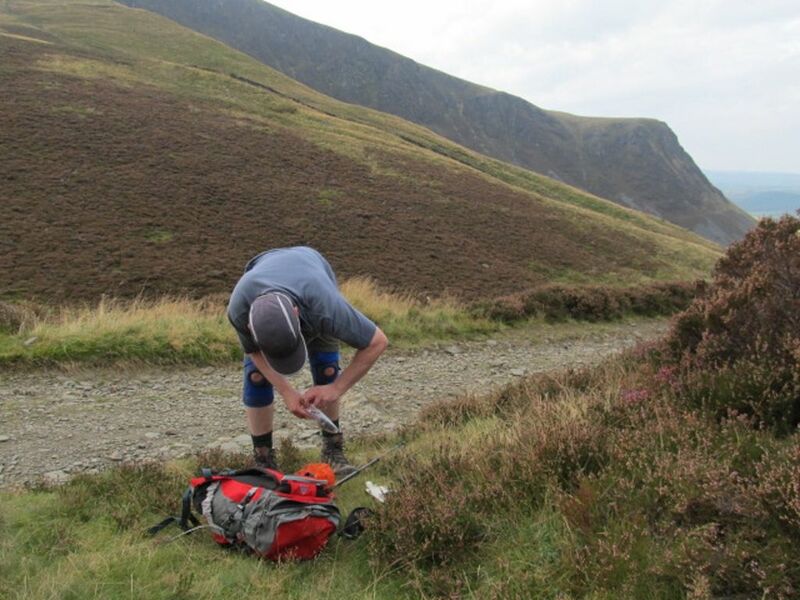 Alan was having grip problems on the scree whereas my Pacer poles were proving invaluable. The cloud then cleared for a brief moment allowing a quick photo, we still didn’t fully realise we were in the wrong place until another check of my phone. Instead of giving it a quick glance, I stopped and discovered it had been frozen including the GPS tracking. Bit of a schoolboy error. We had become slightly separated, I was still up for skirting round as we could see down the scree but Alan couldn’t grip at all. I headed off north west to try and find the correct route but Alan wasn’t able to follow, so he shouted for me to continue on whereas he would head back up and we could meet later at Sty Head. I carried on skirting on poor ground realising this was inadvisable so turned back up. This involved some easy scrambling, I got the phone restarted and soon found the main cairned path. 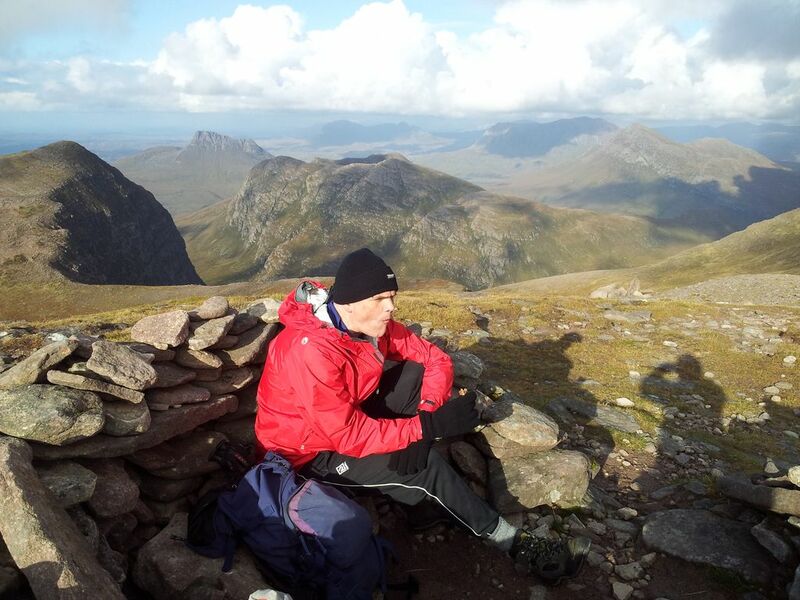 Then sprinted back up to Gable summit to find a surprised Alan taking a quick break. We then retraced my steps and carried on along the cairned route which was fairly straightforward eventually descending to Beck Head, the col below Kirk Fell. Amidst the blur of fit 50yr olds I’d not yet taken in the event of finally reaching Kirk Fell, and it was completely clear. I prodded Alan with a loud “told you”, he grudgingly smiled. 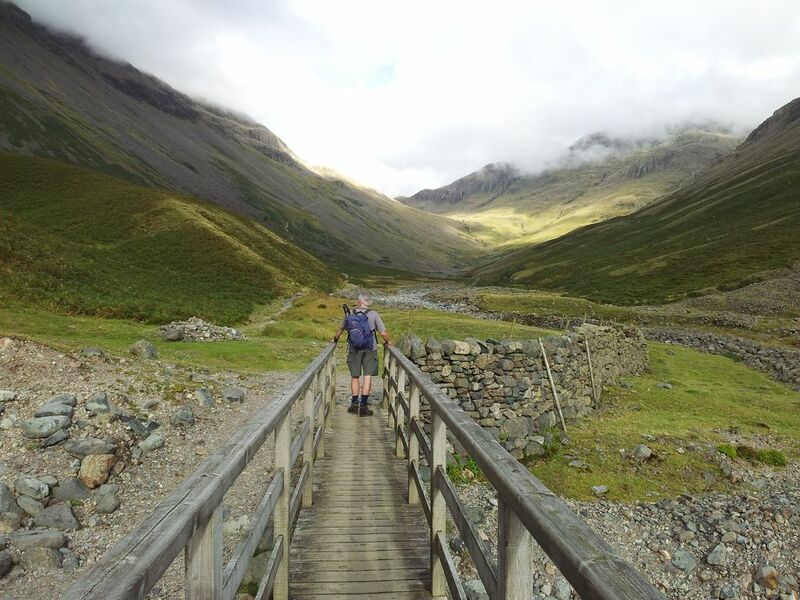 Quick photos, a shaky video and a very very quick route assessment which involved looking at Wasdale and nodding our heads. 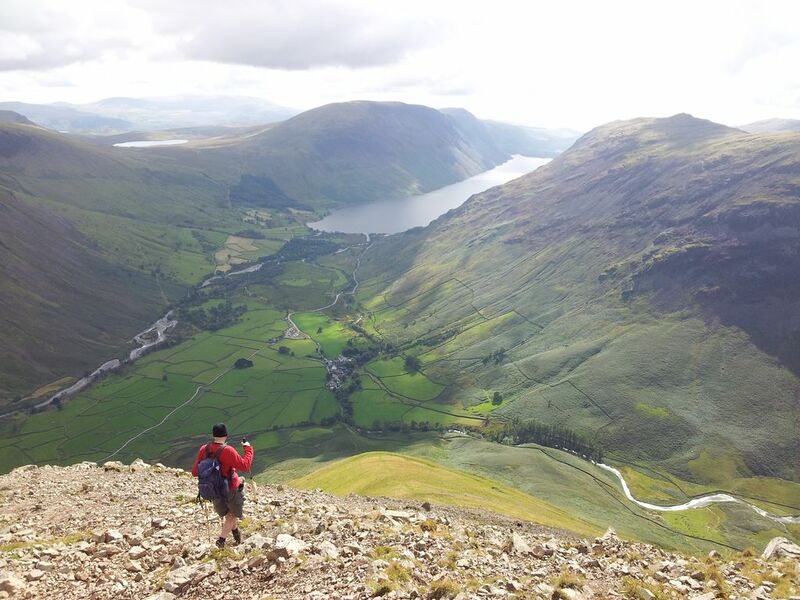 Despite the delays up on Gable we were about to head down to the Wasdale Head Inn. Not a descent to look forward to but beer awaited us at the bottom!! 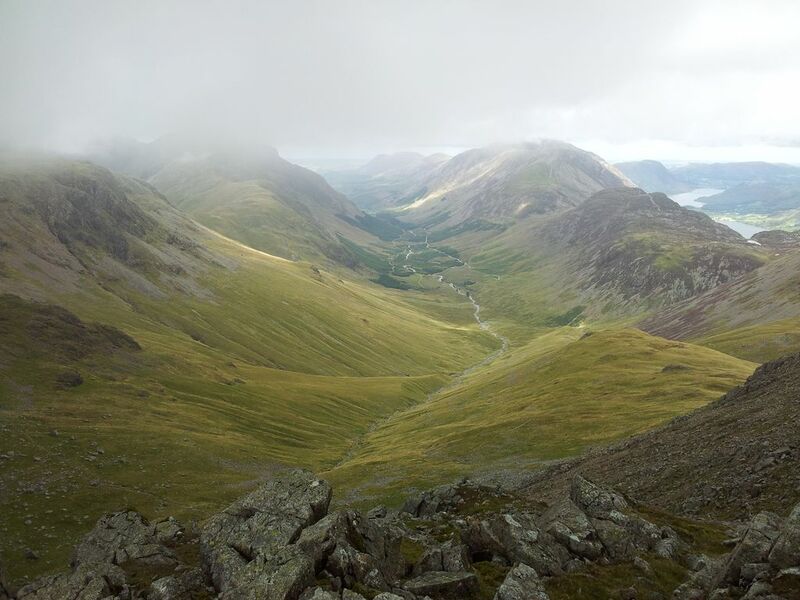 The Kirk Fell to Wasdale Head descent is known for being unrelenting and unforgiving. So poles out fully, knee supports tightened and charge! Feel the pain, enjoy the views! Three dots started moving up towards me, remember Competitive Dad from the Fast Show? Bloke running up with (I assumed) his 2 very young daughters trying to keep pace. Said they’d be doing a race up here soon so needed to check it out. Gulp. Competitive Dad! Come on Olivia! Five mins later I was in the pub. Shock horror, NO Loweswater Gold! However this was ok.
Classic Alanism whilst sat here, the sun went in and Alan immediately started fretting stating, “the weathers definitely turning, theres been a change, it’s a lot darker suddenly, something evil approaching, oh hold on it’s ok I’d just put my sunglasses on”. We have hours of jovial fun together in the hills you know. 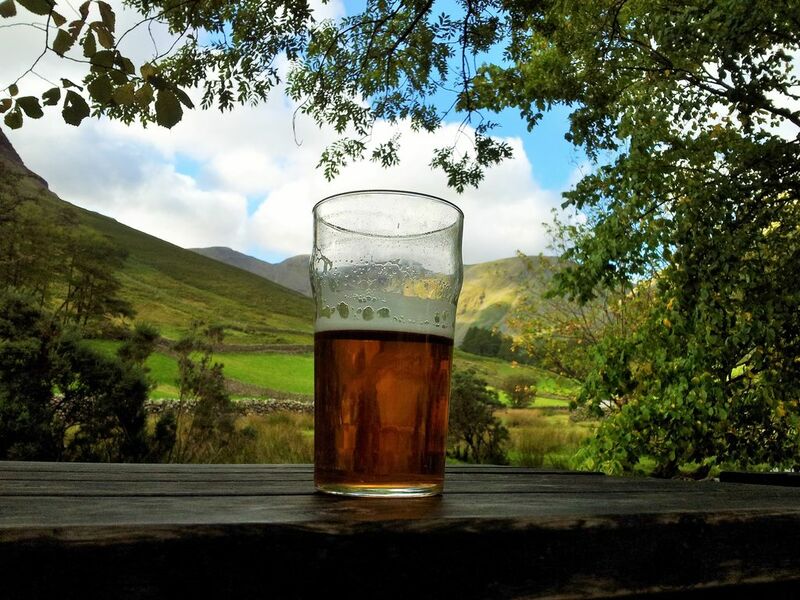 Now one thing we learnt from doing this Wasdale diversion descent last year from Sca Fell, was that we should only have one pint. This was fully appreciated on the ascent up to Styhead that day. Definitely one pint. Must admit this time that pint was gone quickly. 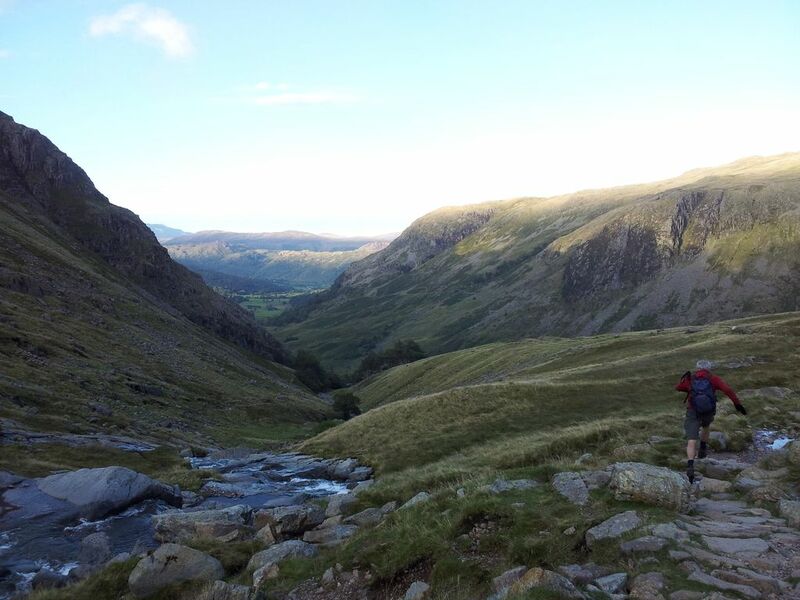 So after 1 + a half pints it was time to turn back to Seathwaite. Quick walk around the pub. Oddly it was totally empty just like last year, albeit with a few people drinking outside. Our memories of the Inn many years ago were different, very busy & atmospheric. Not sure how it’s doing these days. 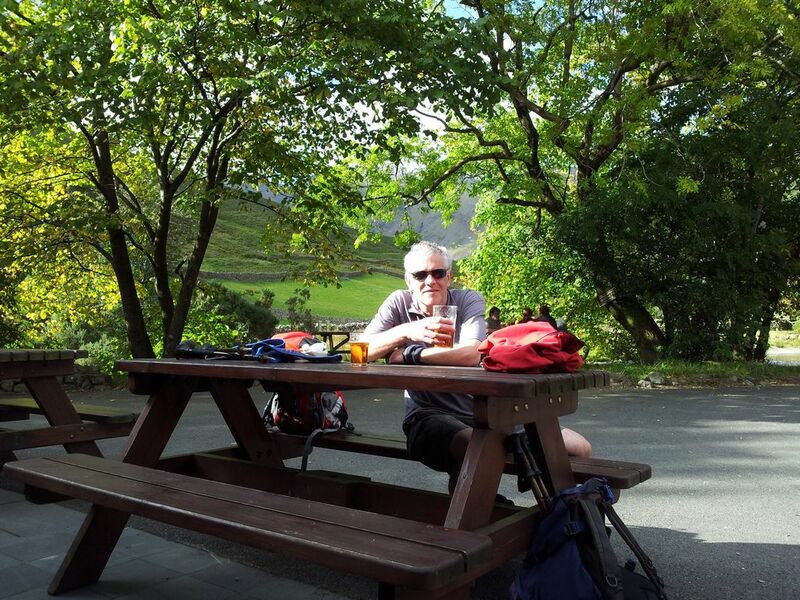 Stage 4 – Wasdale Head Inn to Seathwaite via Styhead; (2 hr 35 mins) After sitting supping beer it takes a little will power to start walking again. Being hungry helped, I wanted me dinner! So off we set, slowly at first along the level ground, looking up at our descent route on Kirk Fell and the scree slopes of Gable. Actually it wasn’t too bad, not one to look forward to after relaxing at the pub but nice knowing its just a little bit further then no more ascent. 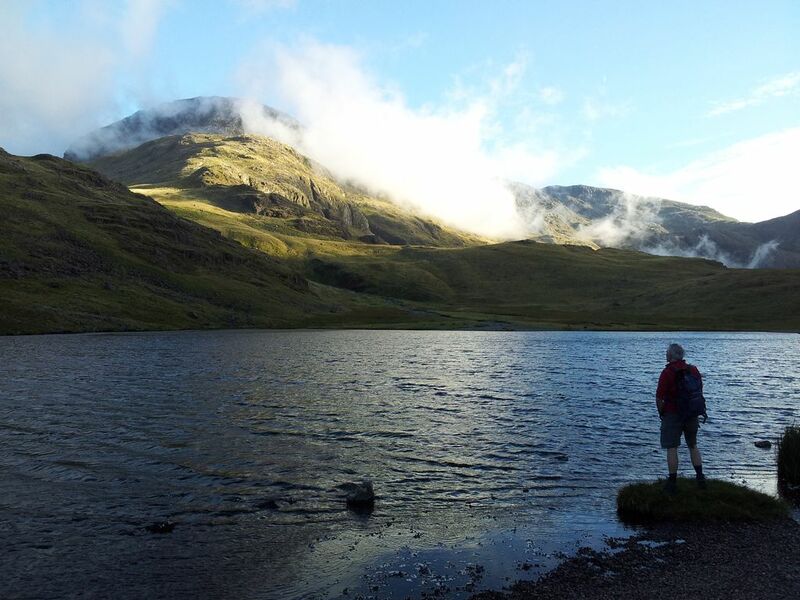 One hour 35 mins from the pub to Sty Head Tarn. The forecasted evening drizzle hadn’t arrived, Gable was covered in grey cloud yet the Sca Fells were bathed in low golden sunlight with whisps of white cloud dancing across the summit. Was going to get poetic then. Let’s just say it was very nice ok. The rather wonderful thing about staying in the hills late is all the other day walkers have already gone down. Apart from a couple camping we were alone at one of the Lakes busiest spots. 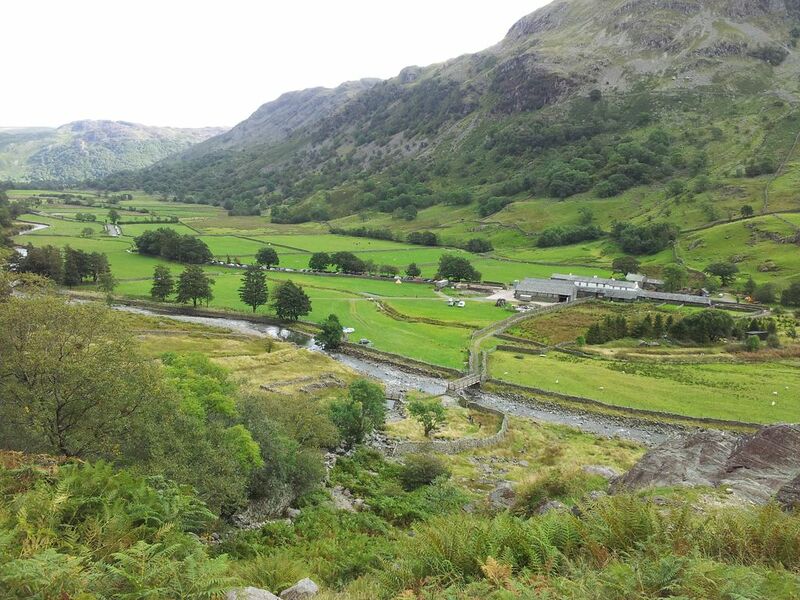 Then it was the straightforward route easing down Sty Head Pass to Seathwaite. No probs apart from the section before Stockley Bridge which doesn’t agree with my knees.